This was the day the adventure finally came to a end and we returned to reality. 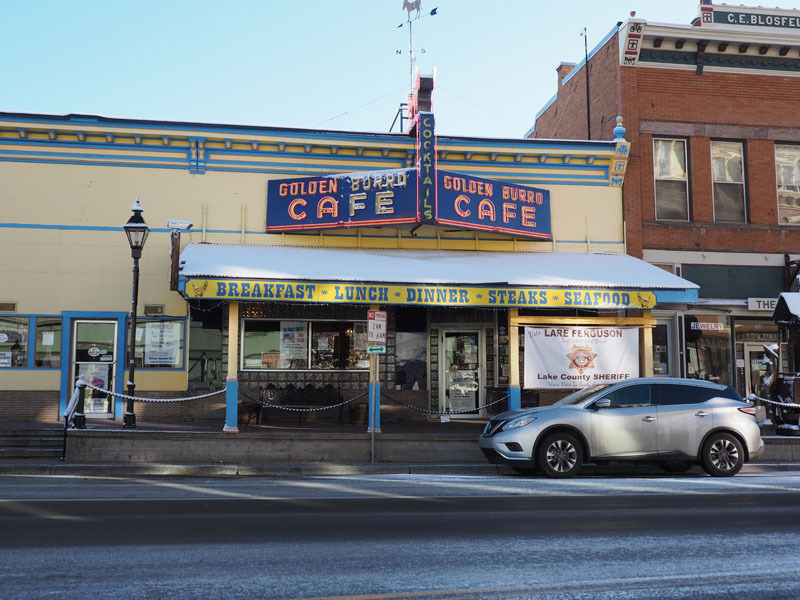 No, we are not home yet, but we started the morning in an unknown little mining town in the middle of Colorado, and ended in the bustling city of Denver. We spent the night in a Hampton Inn hotel in the busy city, and we fly back home today. The mood has already shifted. This was the scene outside our hotel room at Red Cliff in the morning. A light snow had fallen overnight. Off in the distance, the sun was trying to break through. 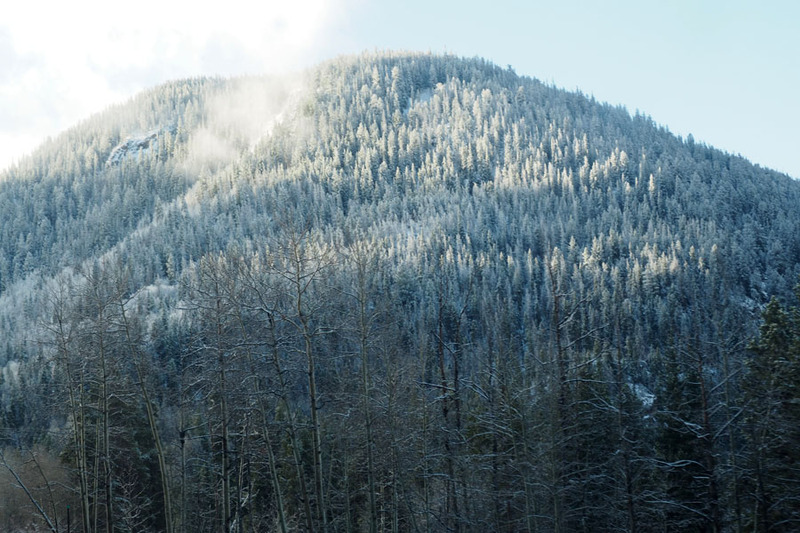 Off to the east, the sun lit up the snow-covered evergreens. This was the direction of Shrine Pass and the road that was not taken. That may remain a dream. We headed up the hill and out of town to get back on to US 24. This road did not seem as narrow as it did to us the previous evening, except at the point where it hit the highway, where they seemed to have had to cut down a little bit of the side of the mountain to create the entrance to the road. There was an overhang that seemed like it would be nasty for tall vehicles. Then it was back on US 24 East. There was more snow around, but the road had been cleared pretty well by that time, and it had stopped snowing. Nevertheless, one had to be extra careful when driving. 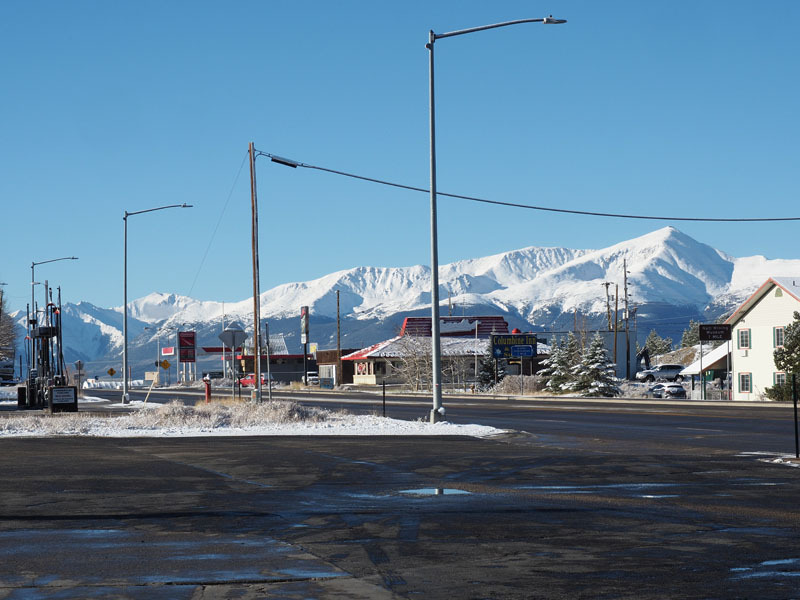 We arrived at the town of Leadville and stopped to fill gas. 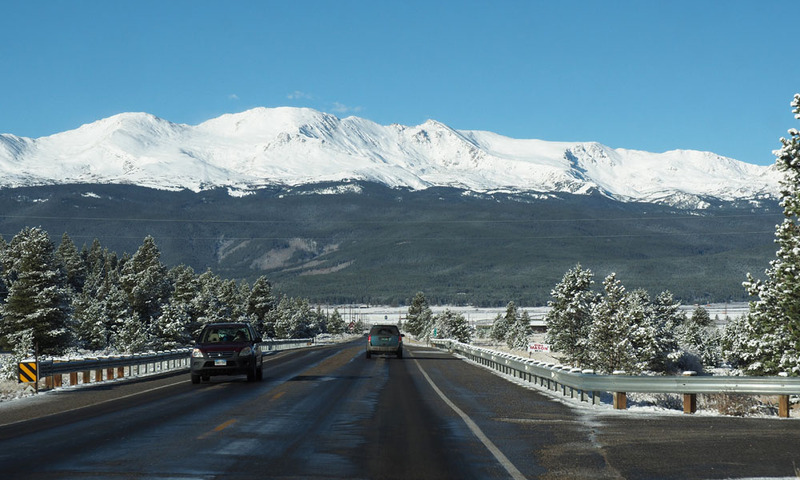 Next to the town were the Sawatch Range of the Rocky mountains. Mt. 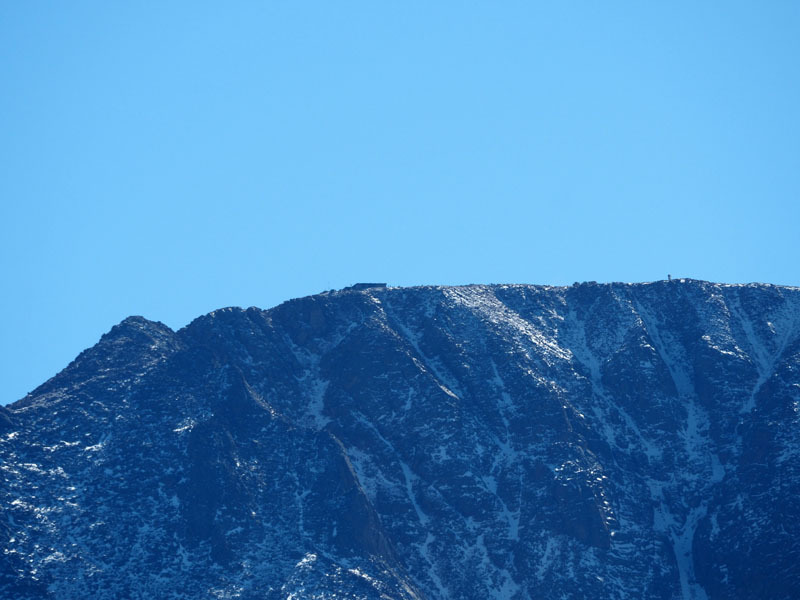 Massive is the closest high peak, over 14,000 feet. 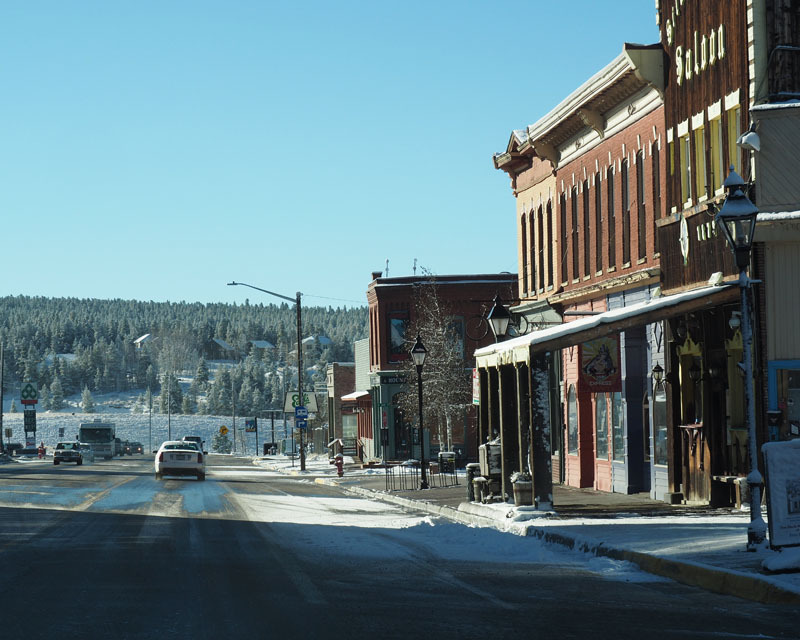 I had selected a route that went through Leadville because I had read about this somewhat less known, and perhaps unremarkable to some, town in a book on running. 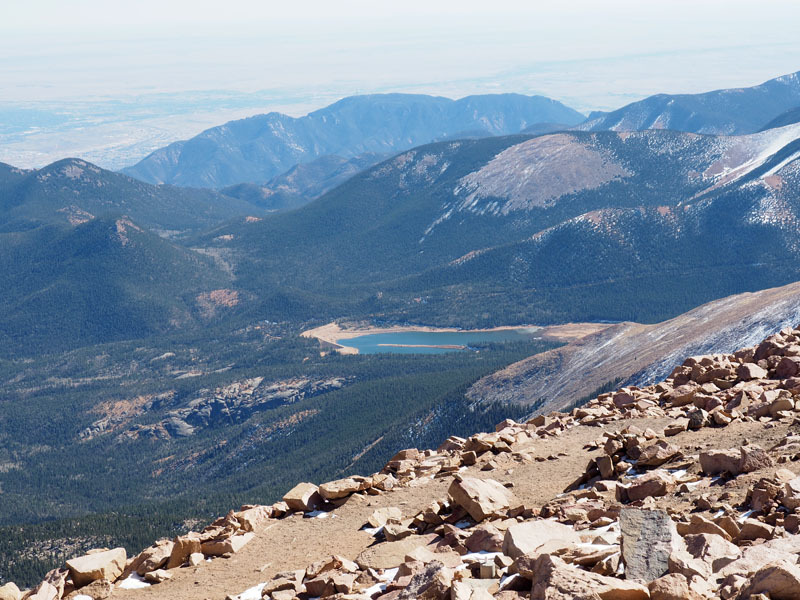 This is the location of the annual Leadville Trail 100, “The Race Across the Sky”, an ultra-marathon where runners covered 100 miles in the Rocky Mountains. I do not think I am going to do that any time soon! 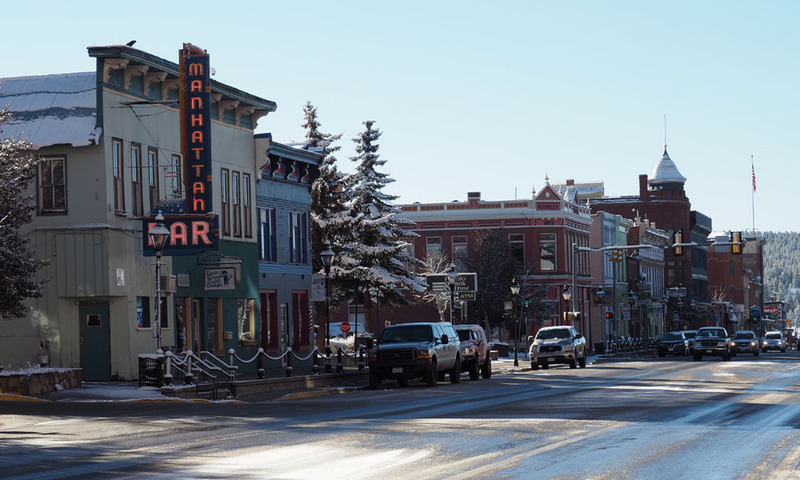 The town itself had a western feel to it, a feeling that we have gotten very used to during these travels. Outside this little cafe you could hear the kind of music that one might have heard in an old western movie, typically in a saloon. (If I remember correctly this sometimes happened before a gunfight broke out.) I took this picture from the middle of the road. I was ready for a shootout! Here are more pictures of the town. And then we were out of town, driving further south in the shadow of the Rockies. We left the snow behind after we left town. 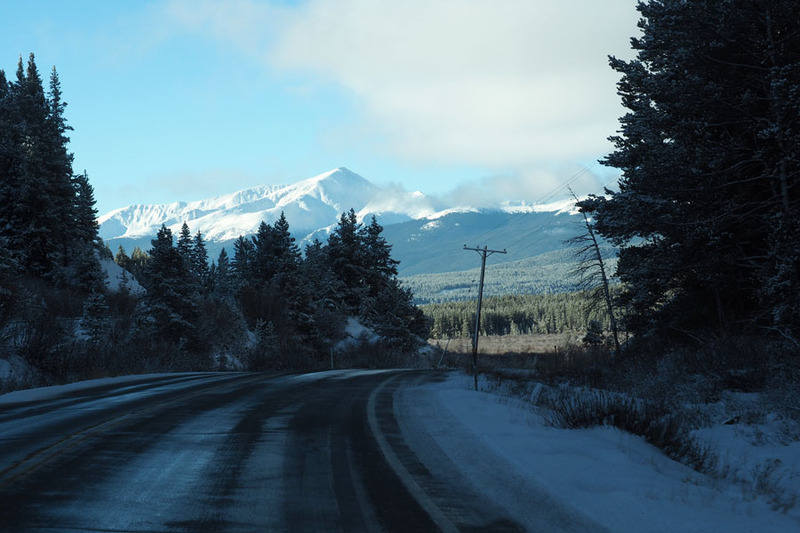 As we drove further south, we saw signs for Mt Harvard, Mt. Yale and Mt. Princeton, all mountains higher than 14,000 feet. What an elitist bunch of folks, the people who named these mountains! These are also called the Collegiate mountains. The road headed south for a long time, and then turned east just beyond Buena Vista, a somewhat sizable town. Then we were headed east, on a big plain, on a road that ran straight and true for miles and miles. There were fields beside us with cows and horses, and then we saw some animals that we did not recognize. I think they were some kind of deer. We climbed out of plains into parkland area. The scenery was still beautiful, but not as compelling as what we had experienced in the last few days. But to somebody who was seeing this after having spent all their lives driving in suburbia, this could also seem remarkable. We passed a little outpost where I finally stopped to take some pictures of buildings that had a western feel to it. This was not the best we had seen during our travels, but this was perhaps the last time we would see such buildings during the travels. 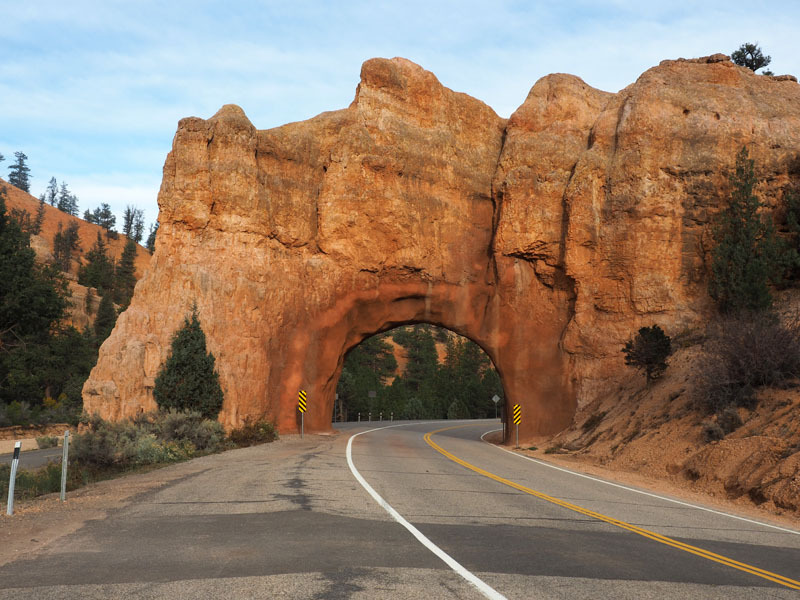 It was when we entered the town of Ute Pass that we knew that we were back in civilization as we have known it all our lives. It was a bigger place with a lot of people, a lot of commercial buildings typical of suburbia around us, and names of stores familiar to us. 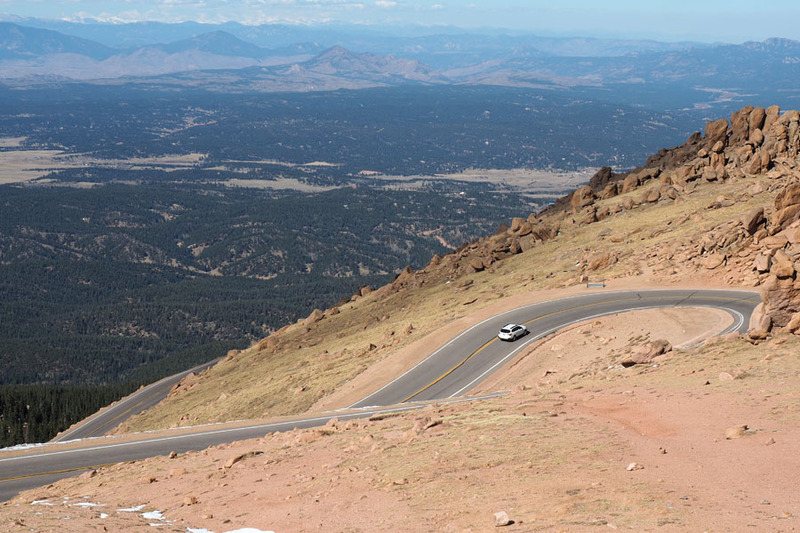 Shortly out of town, we arrived at the start of Pikes Peak highway. There were already lines forming to pay the fees and enter. You have to drive about 20 miles to get to the top. This picture was taken at mile 10 where we decided to stop for some lunch. We might have sat at the picnic benches had it not been for the description they had at the place for black bears. We ate in the car. 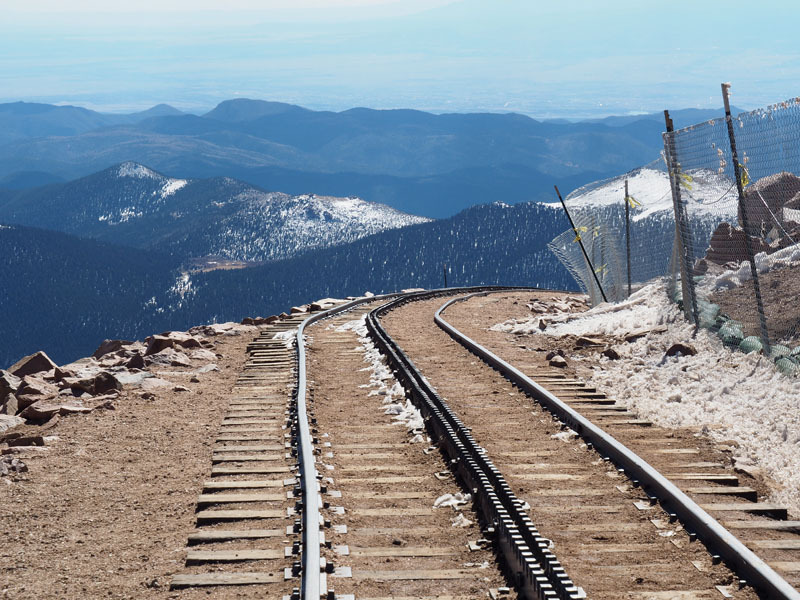 You can see the top of Pikes Peak towards the left side of the picture. We left the forest of evergreens as we climbed. The trees thinned out and eventually disappeared. The last phase of the climb involved a lot of short and sharp switchbacks up the bare face of the mountain. You had to be really careful. We ended up behind a very slow driver who allowed a convoy of about 20 cars to form behind him. The directions for driving this road clearly state that one should pull over and let others pass if there are three cars behind them. (I am told that it is not good to called people names in a blog. So I will avoid doing that.) We reached the top of the mountain in this fashion, in a convoy of slow cars. We were actually a little disappointed when we got there. There is a wide flat area on top, and the area that we were entering through was blocked off with a lot of construction equipment. Additionally, there were a lot of cars and people around. There was a guy who was helping people get parking. Here is a view of a vista at the top of the mountain (click on the picture, as usual!). We were at a height where breathing could be difficult if you were not prepared. After stopping in the cafeteria for their world-famous donuts and a cup of hot chocolate, we stepped out behind the gift shop to take in the view. The pictures below show the place where the cog railroad used to end. 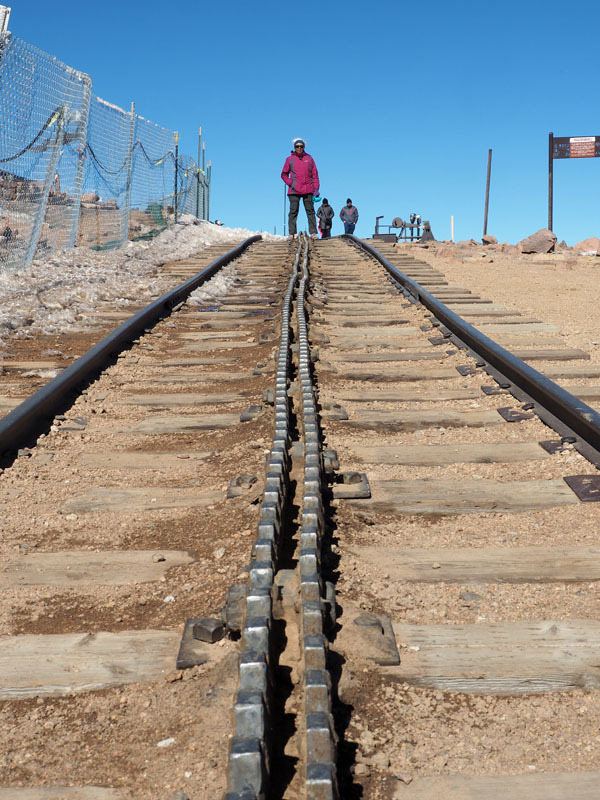 This railroad actually operated until recent times, but is out of commission because there is extensive maintenance work needed, and it is going to be tough to get spare parts and fix something that is not a mainstream product these days. Here is a guy who has taken off his shirt. The temperature was below freezing! 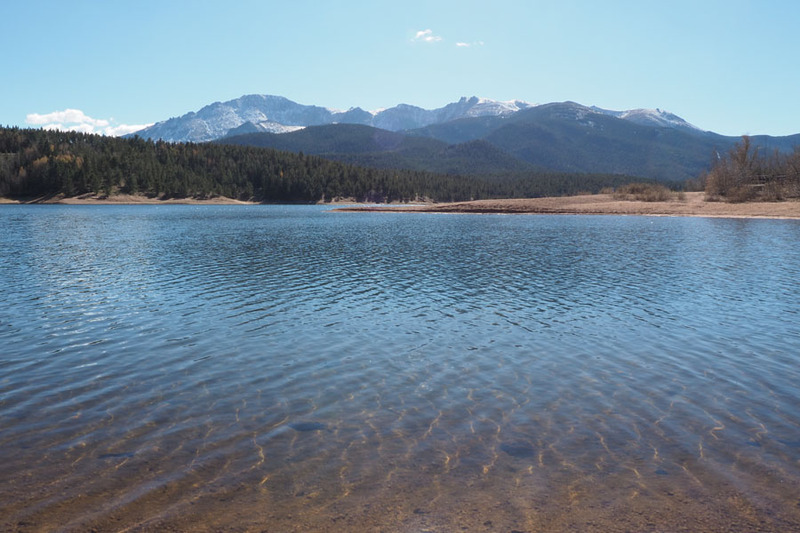 The lake blow is called Crystal Reservoir. It serves the city of Colorado Springs close by. We will stop by this lake on the way down the mountain. You can walk the trail down the mountain. 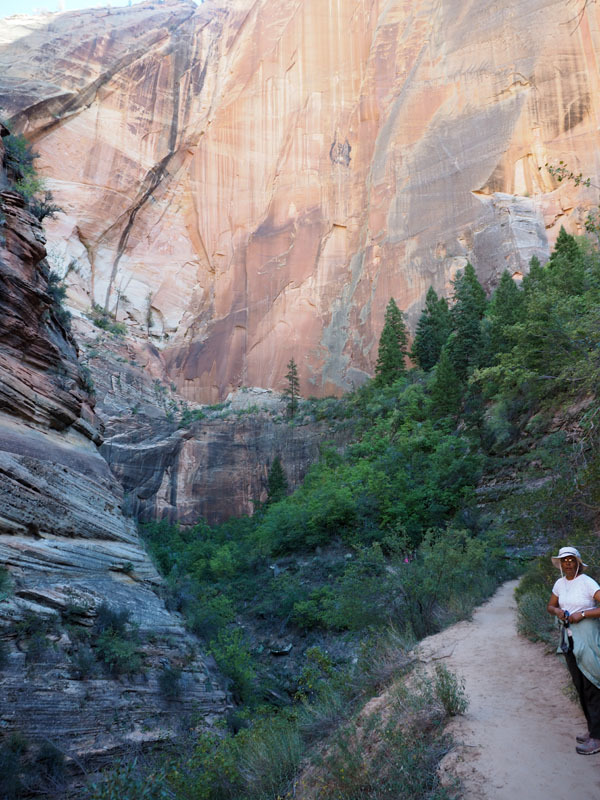 In fact, there are supported bike rides you can do down the mountain on the road. Can you imagine how hot the brakes are going to be as you proceed downhill! We made a few stops on the way down. Here is a picture of the road at one of these spots, of the direction we had come from. This car looks like it is too close to the edge! Here is a picture of the road going down the mountain in one of the steeper sections. This picture was taken from Crystal reservoir, where we stopped for an extended break. 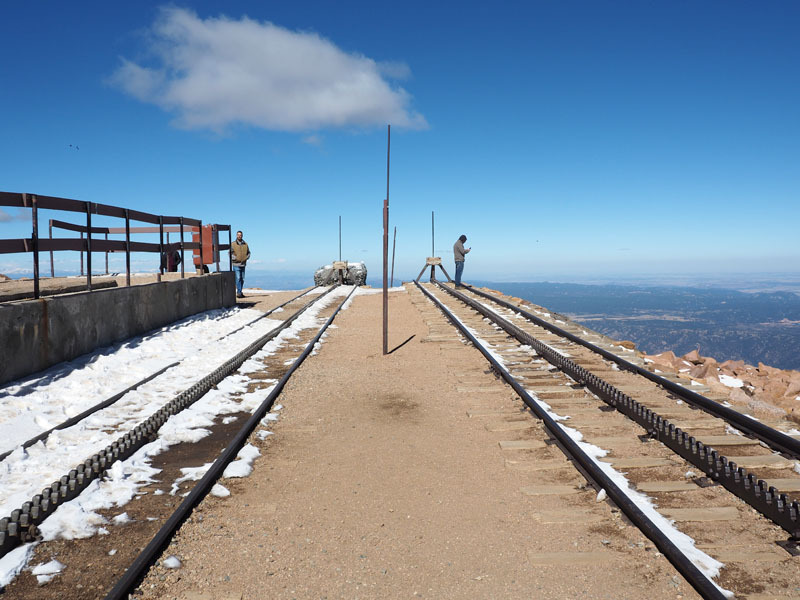 You can see the building at the top of Pikes peak. The blue color of the clear water was remarkable. 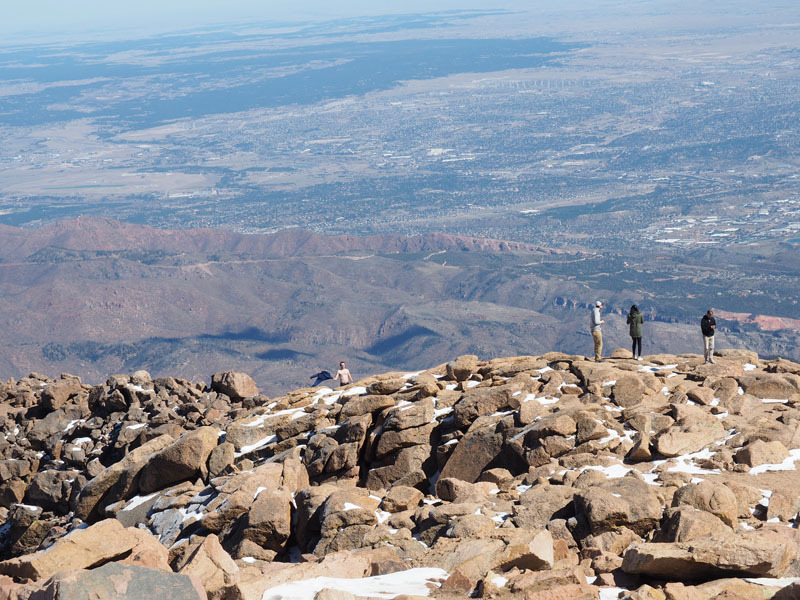 Pikes Peak is to the left of the picture below. The ripples in the water stopped at some point, and I could take the following picture. 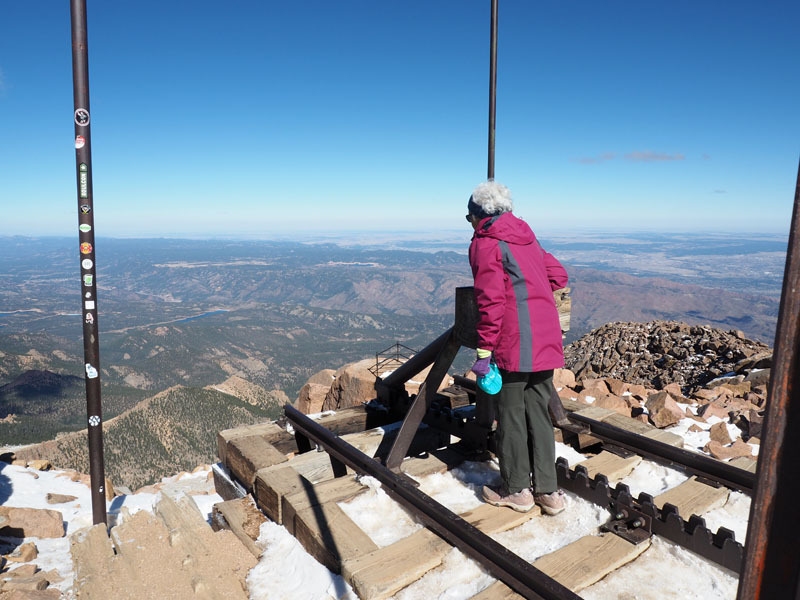 We realized that we had taken much less time to explore Pikes Peak than what we had been led to believe would be needed. The evening was still early, and we had to figure out what to do next. 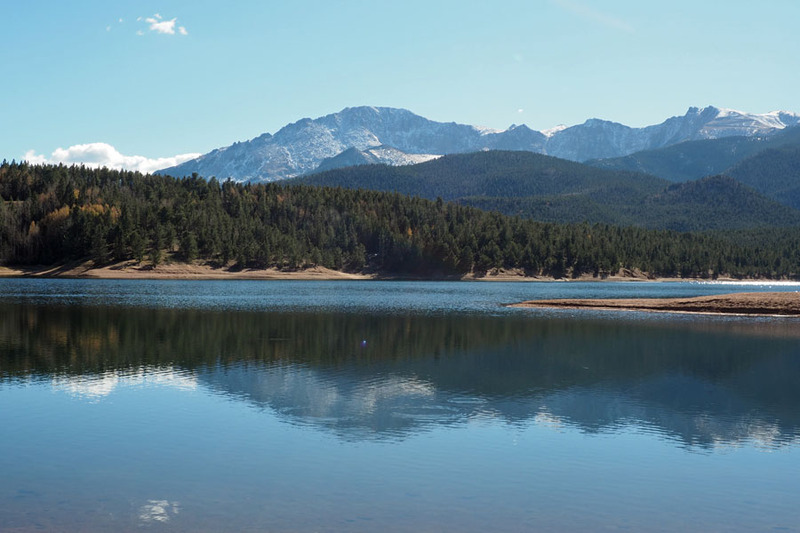 We opened up the AAA tour guide book to the pages for Colorado Springs. 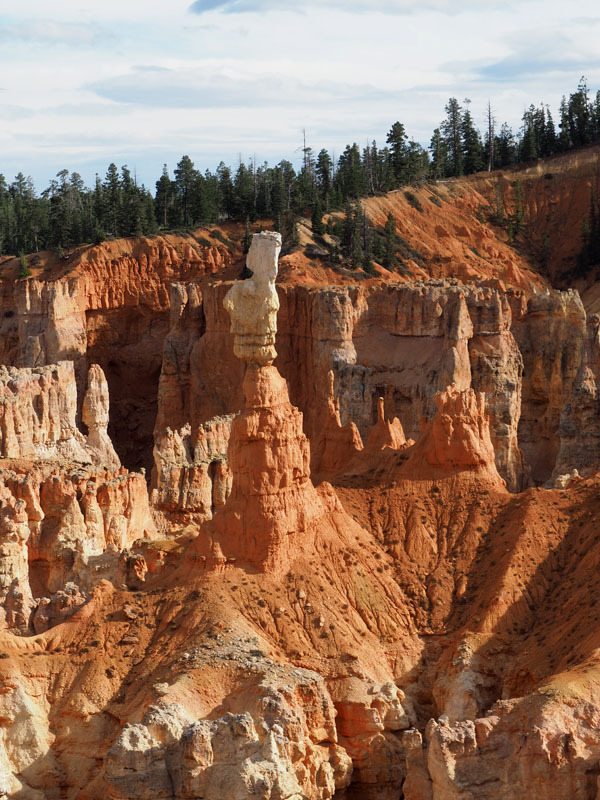 It seems like The Garden of the Gods was the topmost on the list of things to see. That was where we headed. The GPS device told us to go in one direction to get to the park, whereas the instructions on the city streets gave us a different direction. We followed street signs. It was the wrong decision. Instead of the Visitor Center, we ended up at the Trading Post. 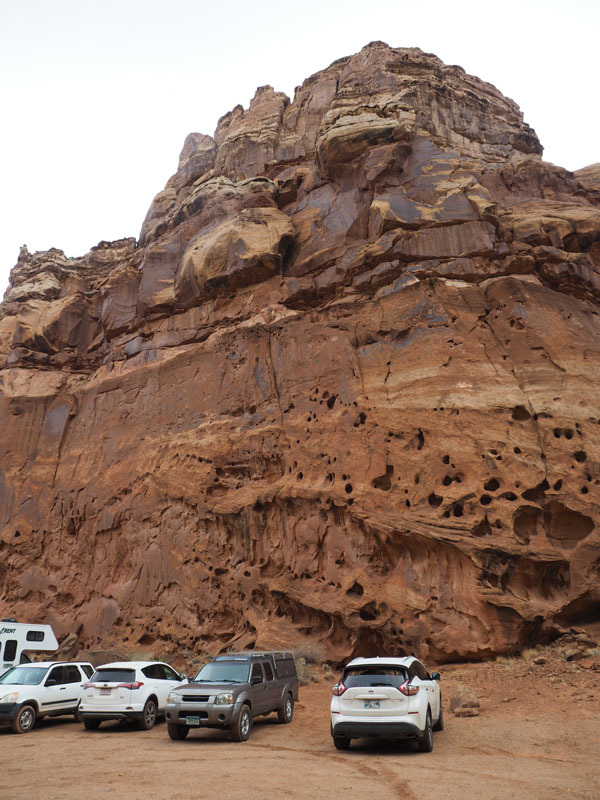 We parked there anyway, thinking that there might be a visitor center hidden somewhere. It was at this point that an overwhelming sense of tiredness overcame me. I was running out of energy. It was time for a Clif bar. We went in to get directions for hiking and were given a map and some somewhat vague directions. We decided that we wanted to head for the Siamese Twins. We headed down a trail that seemed to be the right direction. A park ranger who had been driving on the road next to the trail stopped and gave us us an official trail map of the park (which was different from what we got at the Trading Post). We had been going in the wrong direction. We did make it to the Siamese Twins. Here is a picture of the Trading Post as we walked back to the parking lot. We had initially wanted to also walk in another section of the park, but I realized that I was too tired. It must have been all the driving. We decided to head out to our hotel in Denver right away. On the way out, we passed the place where we had initially wanted to also walk after seeing the Siamese Twins. 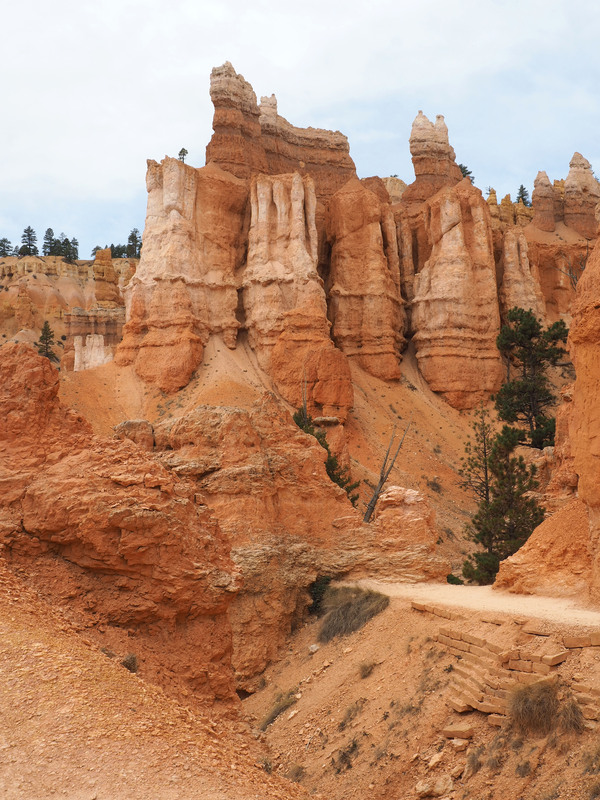 It was actually the more interesting part of the places in the park, with its huge rock formations. It was the place we would have ended up in if we had stopped at the actual Visitor Center. That is the way it goes. We joined the traffic heading north on Interstate 25 towards Denver. It was rush-hour time on a Friday evening, and there was construction on the road. Welcome back to the trappings of civilization. We went out for dinner soon after we checked into the hotel. There was a Thai restaurant within walking distance. The food was good, except that the chef had probably mixed up the dishes that were supposed to be very spicy, and I got more than I had bargained for. Some Chang beer from Thailand helped cool things down. Back at the hotel, I downloaded pictures from the phone to the computer, but that was as far as I got before an overwhelming urge to sleep overtook me. I conked out the minute my head hit the pillow. It was around freezing temperatures when we woke up, but the light breeze made it feel colder. My fingers froze the moment I stepped out to take a morning picture. We were down for breakfast as soon as the place was open. The food was the standard fare, but it was very good in spite of that fact. The bread and the pancakes were outstanding. 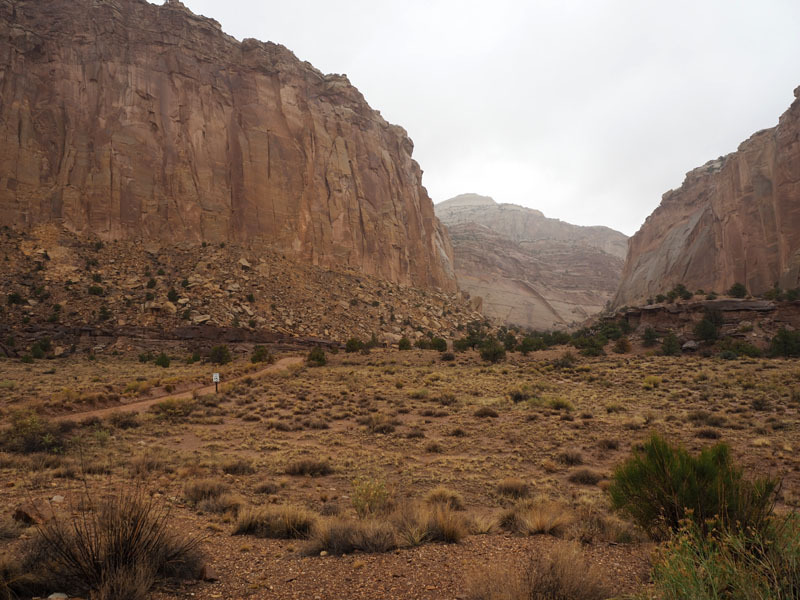 And then it was off to the Capitol Reef for a morning of hiking. 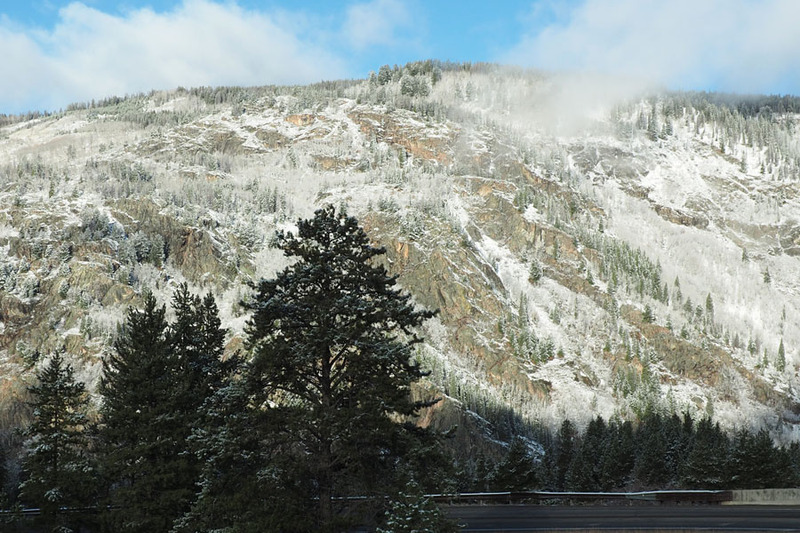 We would be leaving for Red Cliff, CO, as early in the afternoon as possible. The cold weather would not stop us hiking, but there was the slight chance of rain that could. This picture was taken from the car as we started descending from the rise in the road. 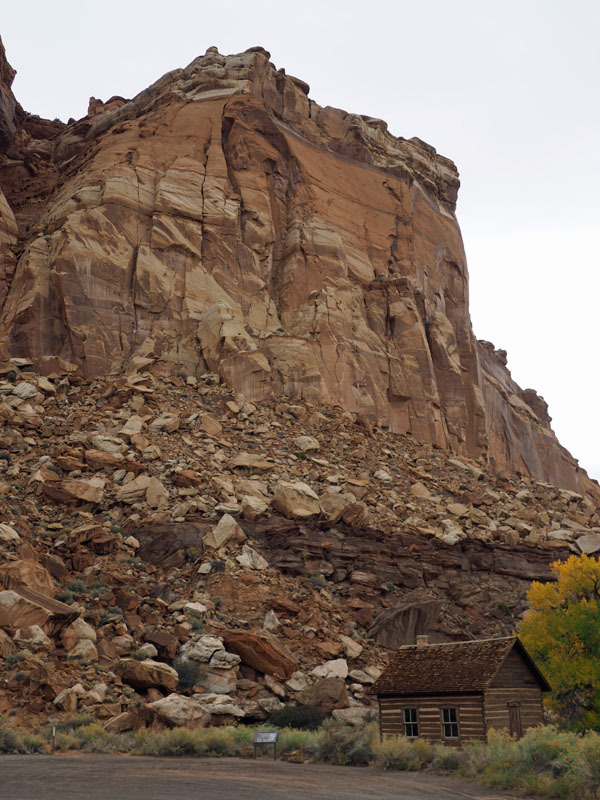 We drove past the Fruita schoolhouse. The next stop was at a roadside display for Petroglyphs. What we saw here was not as impressive as the one in Newspaper Rock Historic State Monument. We also passed a few orchards along the way. We finally arrived at the trail head for the Grand Wash Trail that we were planning to do. For those who do not know, a wash is a path that water flows through naturally only when there is excessive rain and flash flooding. 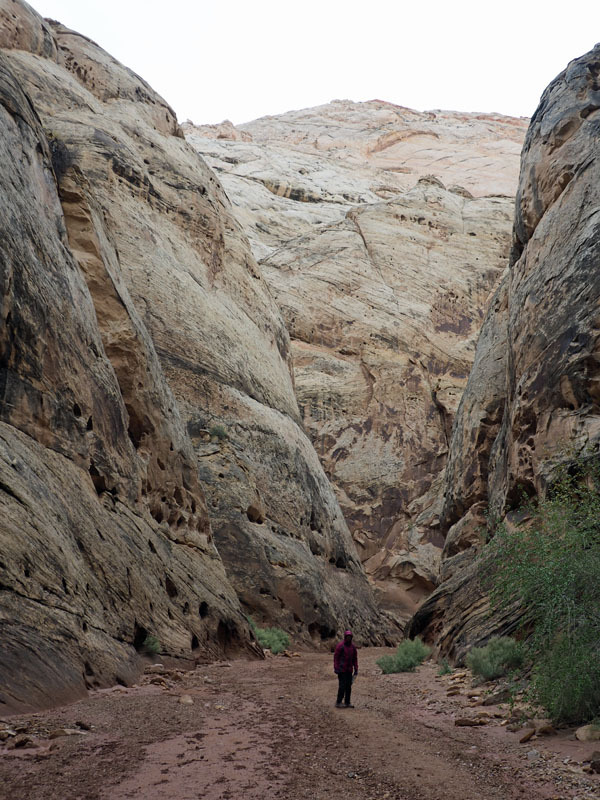 We had never walked a trail in a wash before. 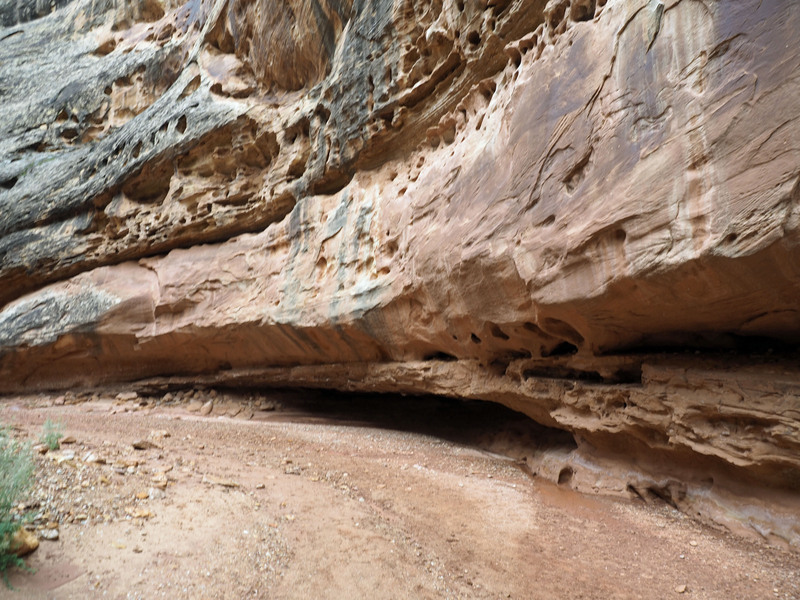 This particular wash was a path for the water flowing between cliffs of mountains. 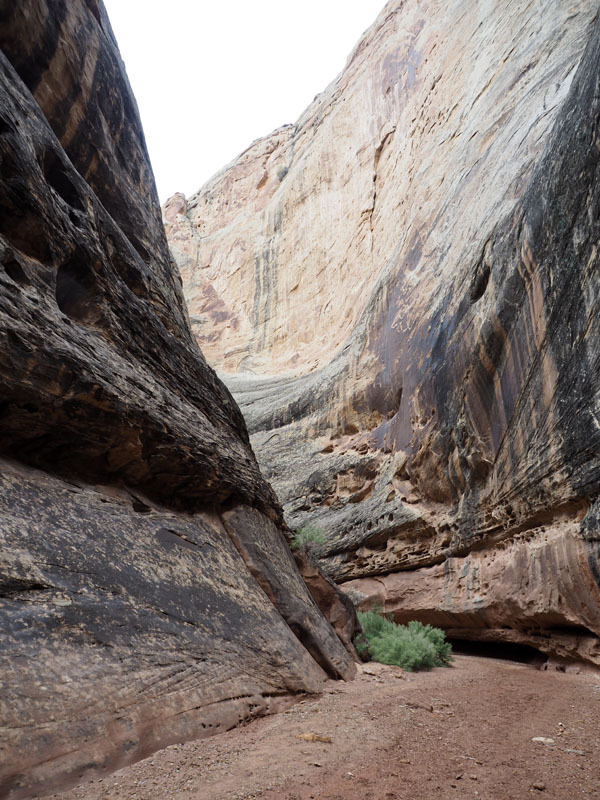 Essentially, the wash was in a canyon, and the path of the water depended on the nature of the canyon. An obstruction in the way because of the presence of a mountain would cause the wash to change direction. This picture was taken near the beginning of the walk. 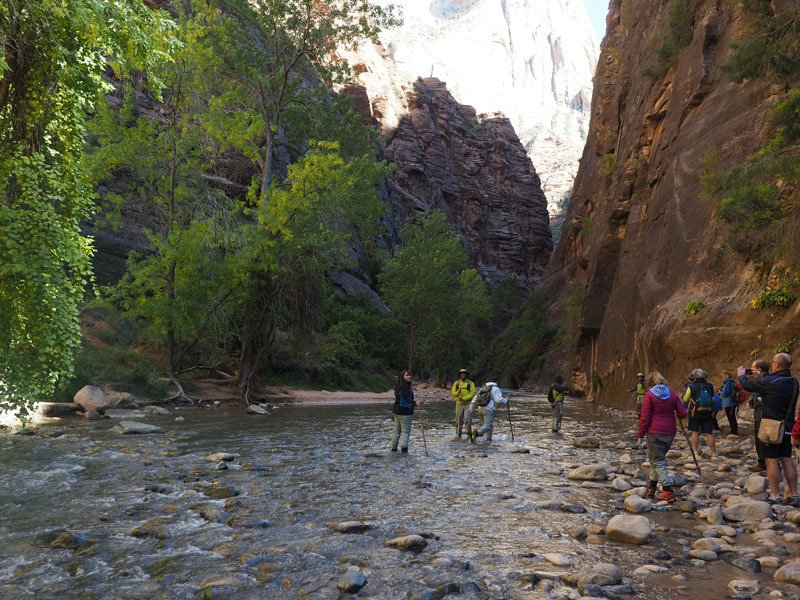 For the purposes of the hike, you could walk anywhere in the wash. The surface was covered with small rocks of all kinds. It was also muddy because of the rain the previous day. It began to drizzle as we started our walk, but we continued. There seemed to be no danger of flash flooding. When the water encounters a barrier and changes direction, it actually eats into the rock and weakens it. You can see this happening in the picture below. Eventually the rock will have to collapse as more and more of it is eaten away. This is the way of nature. Nothing lasts forever. 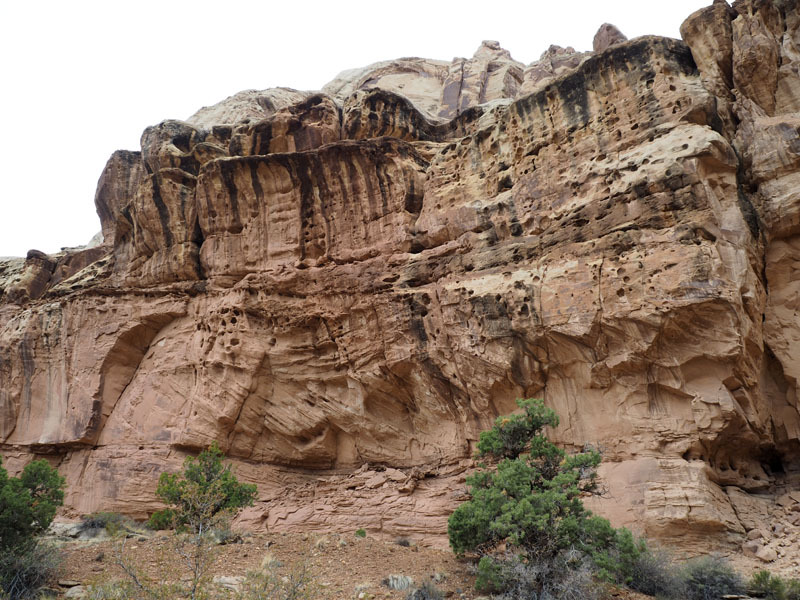 This picture shows how the position of the mountain changes the direction of the wash. 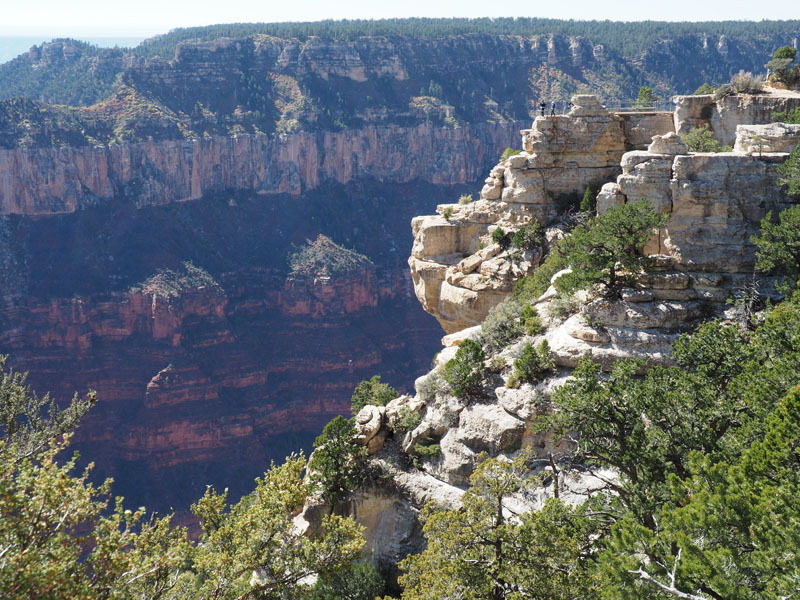 The tall cliffs in front are a barrier to water flow. The wash changes direction to the left of the picture. The direction of this wash kept changing direction every few hundred yards. The distance between the cliffs got reduced significantly in the narrows section. Imagine the waters of a flash flood encountering these sections. The water has cut deep into this rock as it changes direction here. In the narrows section of the trail. The wash did widen out after a while. 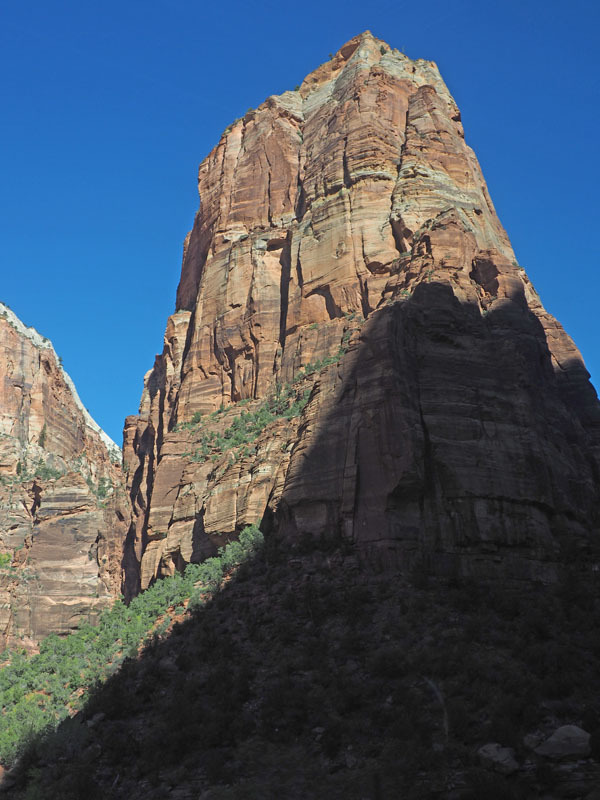 The rocks had interesting shapes and towered over you, all around you. The depression in the rock in front was huge. I am not sure what caused it, but it is in the way the water changes its direction. It could be that a slab fell out. It looked like an amphitheater to me. We saw rocks of all kinds of color in the the bed of the wash. I did not get a picture of the orange ones. All of these pieces are carried by the water when there is a flash flood. We reached the other end of the trail. You can drive on a dirt road to this point on the scenic road that I took pictures of in the previous blog. There is even a basic restroom here. These pictures were taken on the way back. 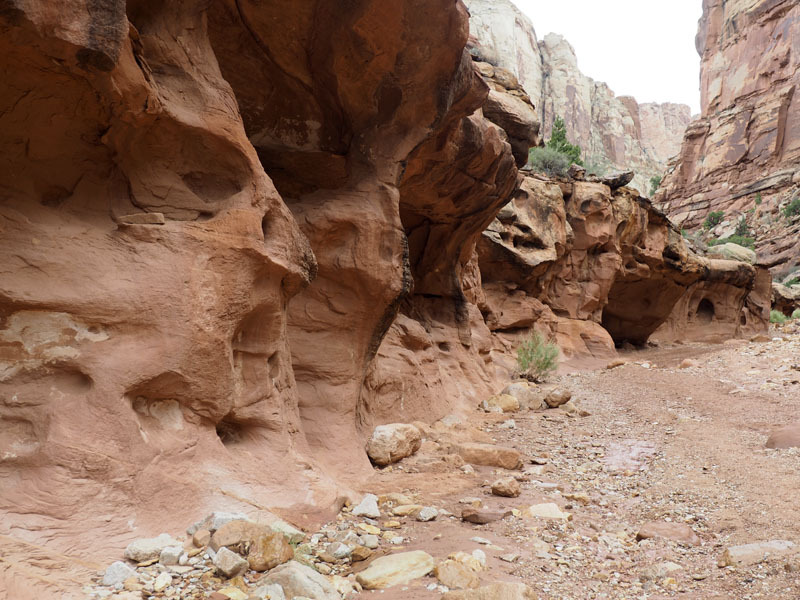 Look at the shapes that the water has carved on the rocks near the canyon floor. 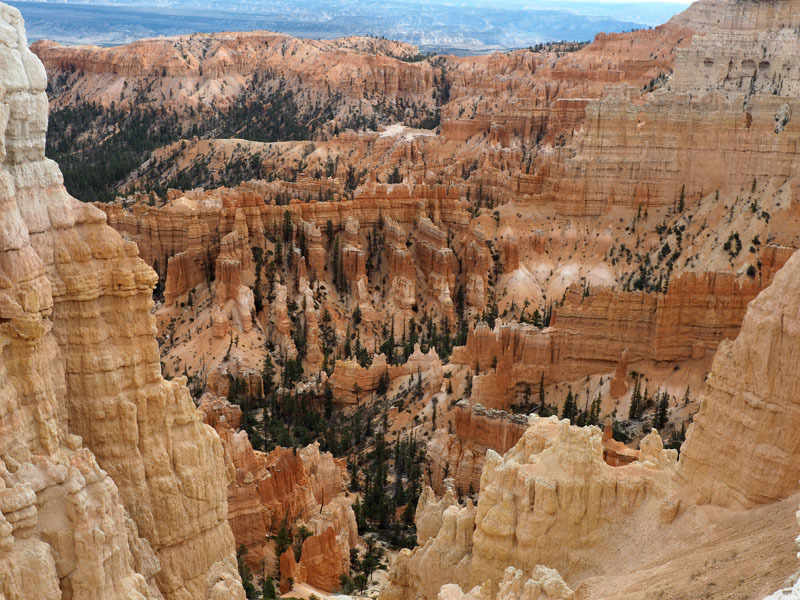 I took this picture just to capture the beauty of these massive rock formations. You can see that this mountain is a barrier to the flow of water and changes the direction of the wash. This is all created by flowing water! 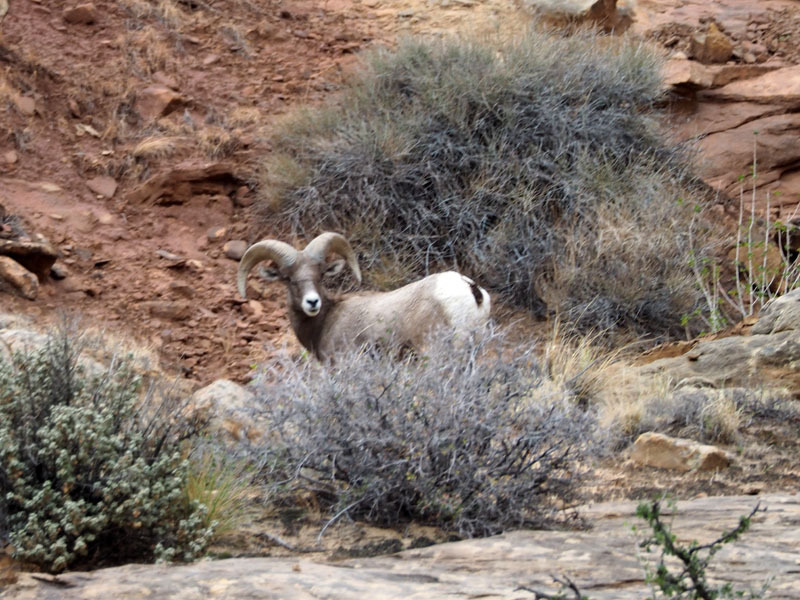 And then we had the sighting of the bighorn sheep! We had been waiting for something like this all through the trip, and it finally happened on our last day in Utah. You should have seen this guy navigating the rocks. They are very surefooted. 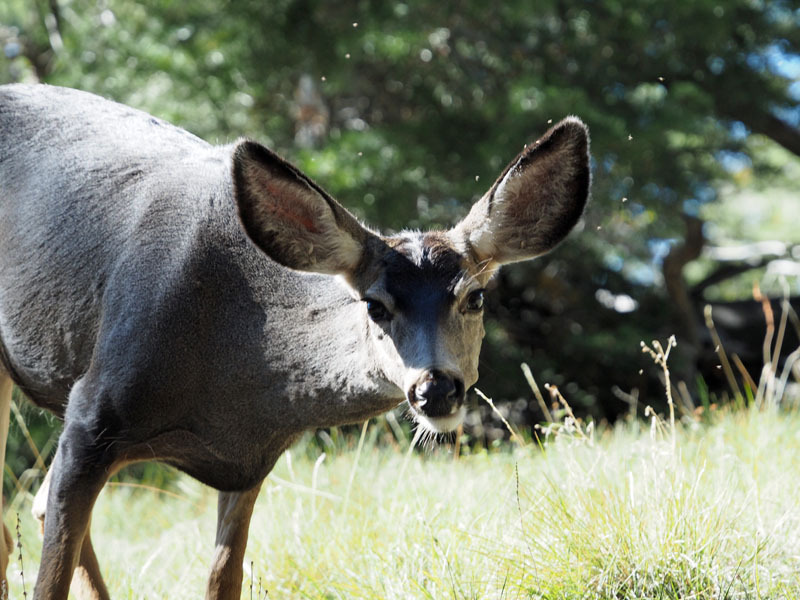 We have to thank the couple who were hiking in front of us for directing our attention to the animal. We could have missed it completely! I took this picture just because I was imagining what this rock face looked like. There are a lot of faces in pain looking down on you! We reached the end of our walk in the wash after a couple of hours. It was around noontime. My not-so-trusty GPS said that we had walked 6 miles, while the sheet of paper in my hands said that we should have actually walked 4.4. miles. I think the distance we covered is closer to what the GPS device says. We stayed on the bed of the wash even when there were shortcuts beside it. 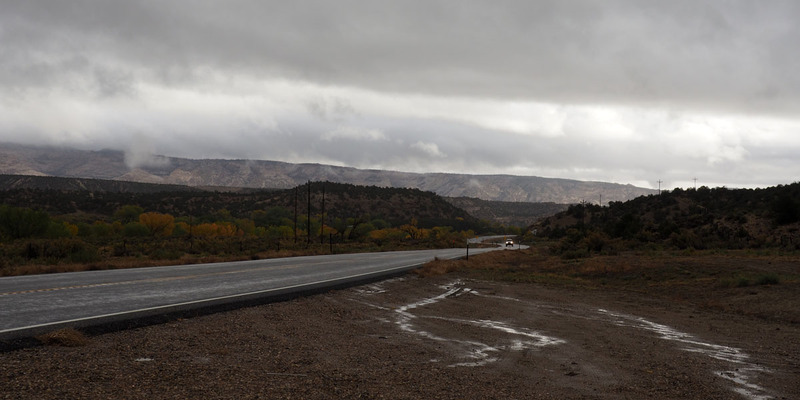 And then we continued our drive through the park to head out of town, and on to Red Cliff, Colorado. We had a long drive ahead of us. 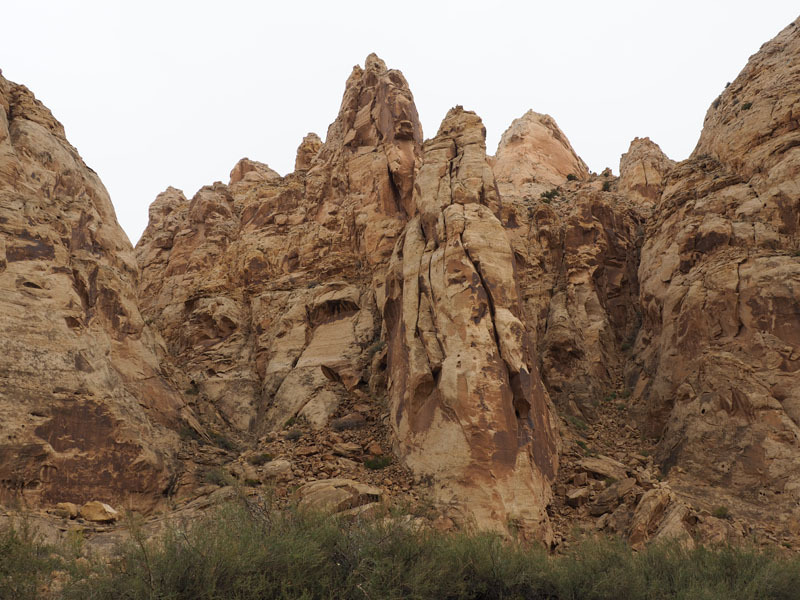 As we hit the east end of the park we encountered some very dark rock formations that were also quite pretty. This picture was taken from the passenger seat. We drove on Interstate 70 for hours with only a short stop to use the restroom. A lunch of trail mix and apple were consumed as we drove. 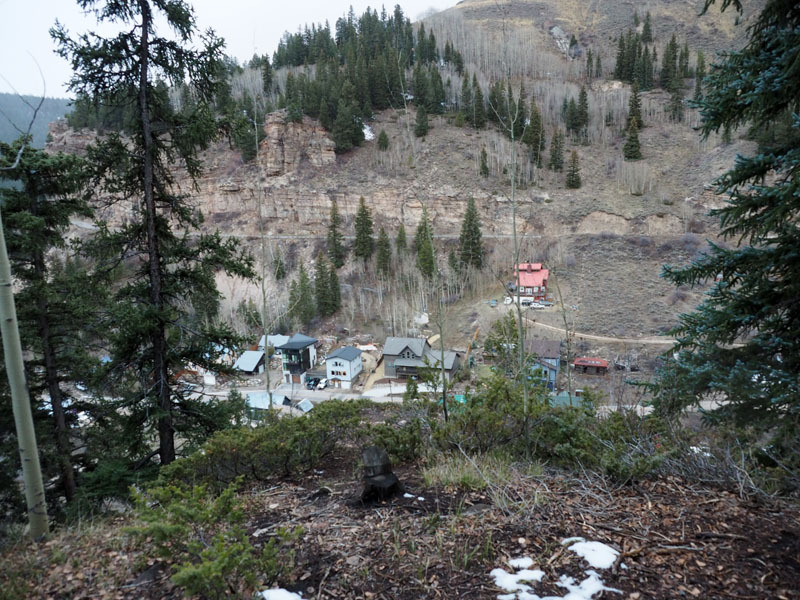 Anyway, we passed a small little town called Minturn, quite cute, soon as we exited the highway, and then the narrow road that we were on began to climb through woods along the side of a mountain. 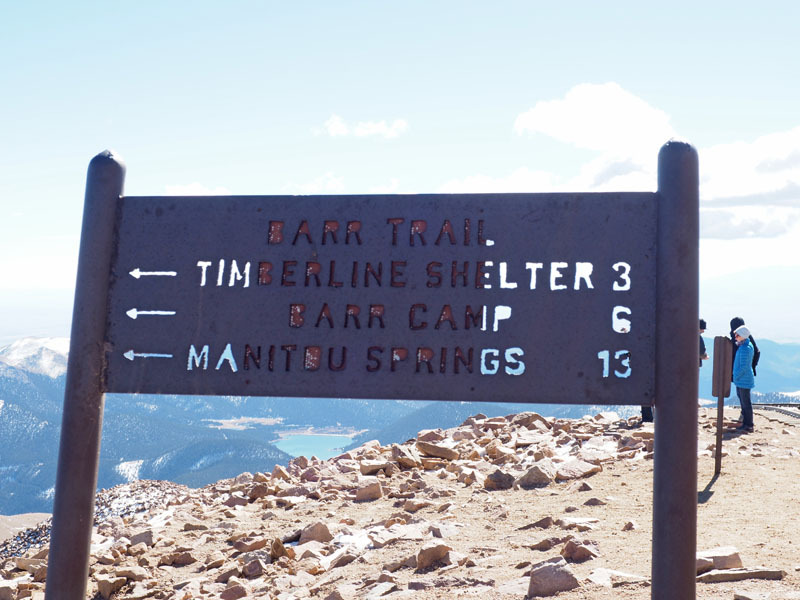 We climbed and we climbed for a while, until we crossed a marker that said that we were about 13,000 feet! It seemed that we had been driving on this road for a while and, with no signs of civilization around, I was beginning to get nervous. There were other vehicles on the road behind us who seemed to be surer of themselves. The road was descending rapidly at this point. I decided to pull over to the side so that we could get our bearings. 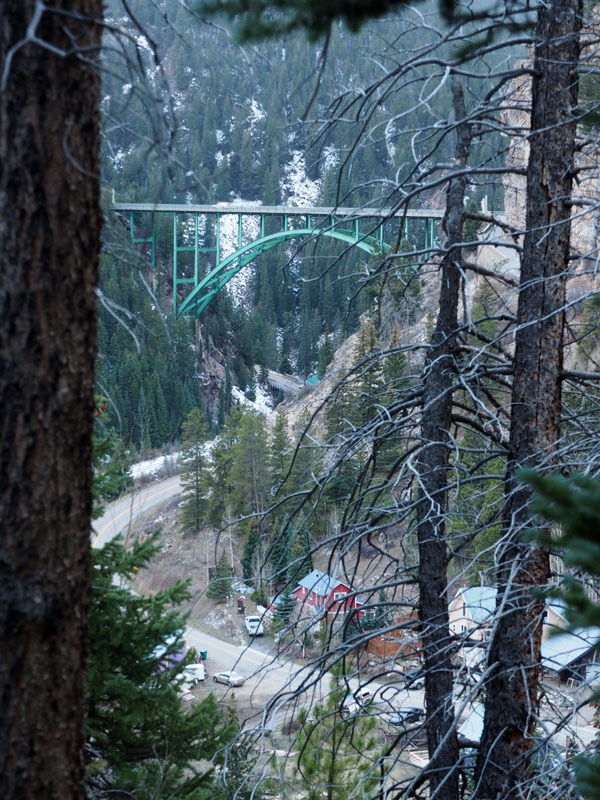 I took this picture of the green bridge crossing the valley below as Teresa turned the GPS device on. (You could not use a smartphone with GPS in these parts because there was no signal!) She told me that we were a couple of hundred yard from our turnoff for Red Cliff. Sure enough, when we reached the bridge, just before the start of the bridge, off on the left side, was this narrow road to Red Cliff. You can almost make out the marker in the picture below. 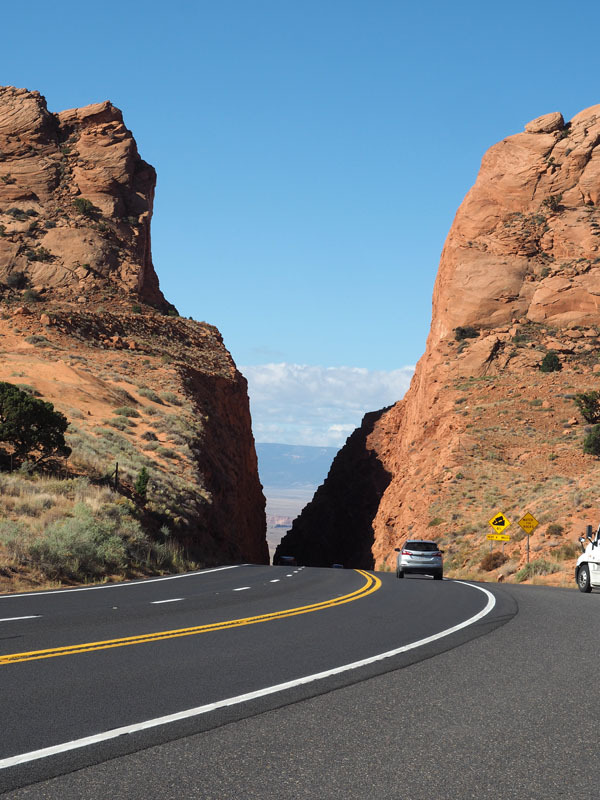 There was barely place for two vehicles to pass on this narrow road set against the cliff. It was descending rapidly. 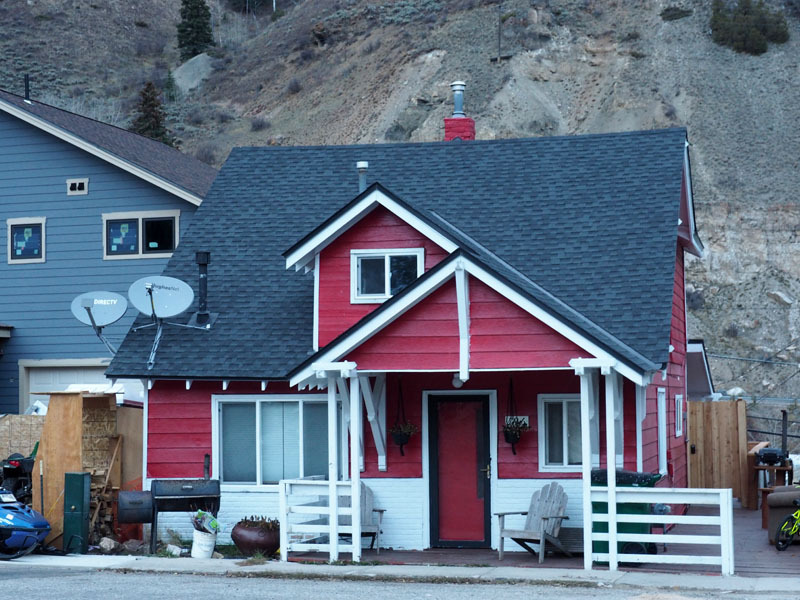 In the valley you could see a little town with old houses and even a railroad track. There was no way to pull over to take pictures. The village below us was Red Cliff. We had arrived. This is the Green Bridge Inn that we are staying at. This is a view from outside our third floor room. The room was very nice, with all the modern fittings, but it also had its own character. Rooms like this are much more enjoyable that the cookie-cutter rooms of the big hotel chains. I was taken by the look of this small village. When checking in, I asked the girl at the counter questions about the place. She was from that town. She gave me a small slip of paper with some information about the village. It was at 9000 feet! 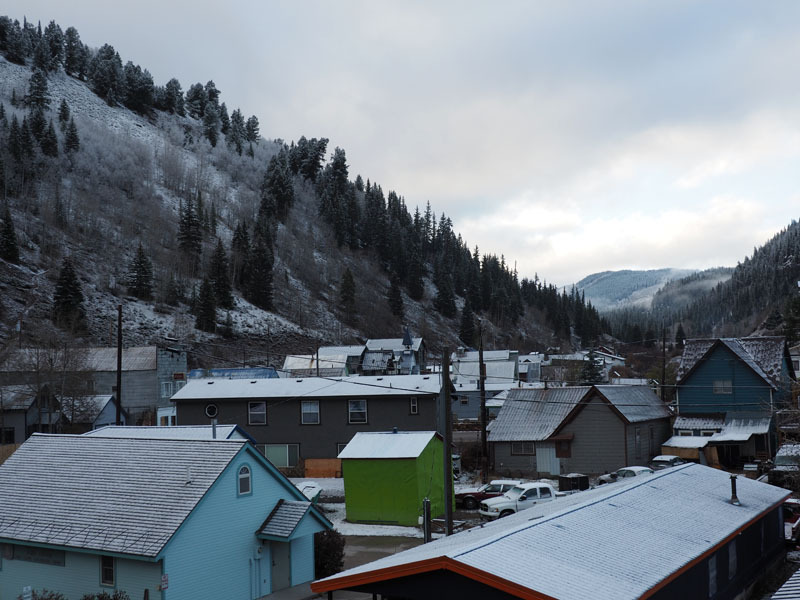 It is the oldest town in the county, formed in the late 1800s, when silver was discovered locally. 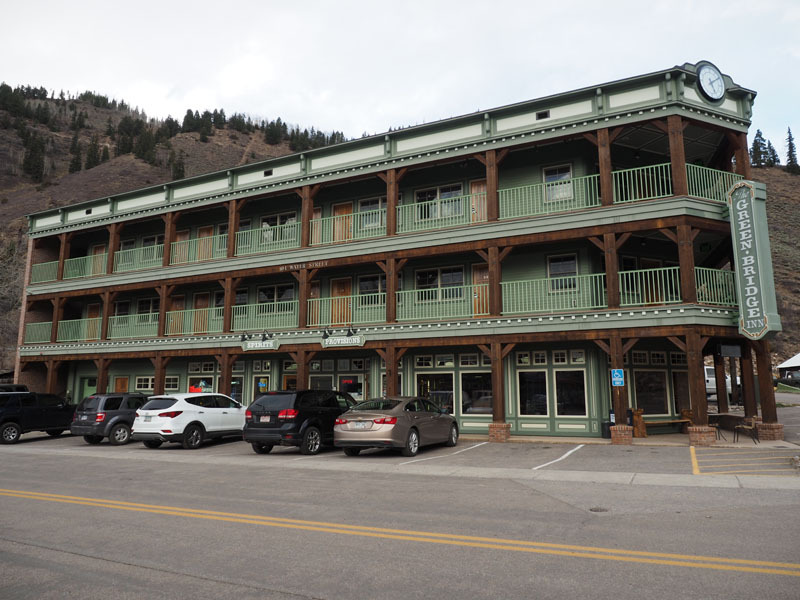 At the turn of the 20th century, it boomed as a mining town, with saloons, brothels, bank, sawmills, and even an opera house. 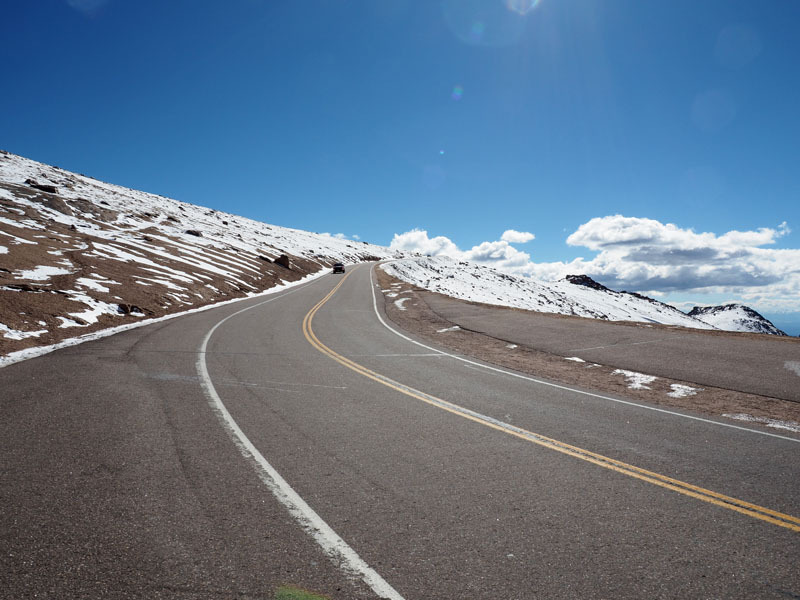 The girl at the check-in counter also told me about a road from the village that went over the Shrine Pass, at 13,000 feet. She said it was a dirt road in parts, and that we could turn back and return to town any time we wanted. There is a small sign in the village pointing to this road. I wish we had time to do this drive, but it is not going to happen. We have places to go. There was a walking tour one could do, and the two of us set out on a walk after putting our stuff away. I was told that you could get a good picture of town from the cemetery on top of the hill. That was where we went. We were breathing hard in the thin mountain air as we climbed, but we did get there. You can see how high we had climbed above the village from the picture below. The pictures of the village itself that were taken from the cemetery were not clear because of things in the way. The houses in this village were all different from each other and they looked like they were all in different conditions. Some of them were pretty. I don’t think there is a concept of zoning. Here is a picture of one of the houses. People have to depend on satellite signals to connect with the outside world. We saw people taking walks with their dogs. The dogs were usually running free. We could hear people talking to each other outside the homes. 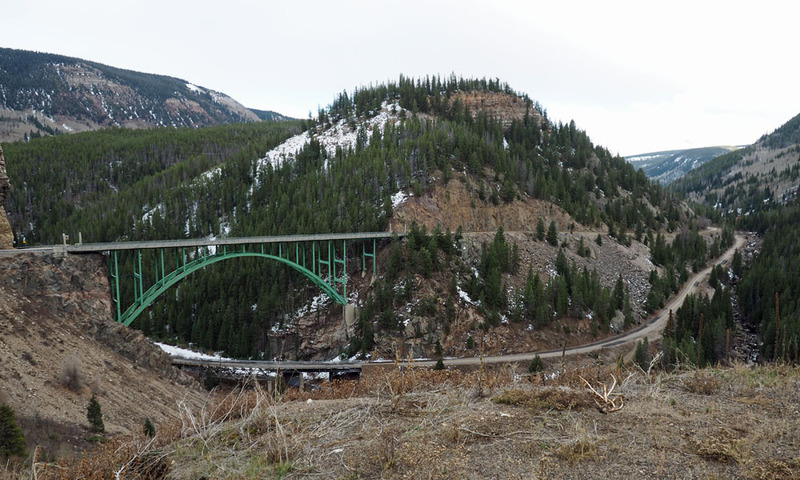 You crossed a bridge to get from one side of town to the other, and below the bridge you could see a stream and the abandoned rail tracks of the old Denver and Rio Grande Railroad. The trains ran through the valley in these parts during its heyday. It snowed lightly when we were walking up on the hill. It also felt very cold but I did not know how cold it actually was. Being up in the mountains, I imagine that temperature can be really low. We had to find a warm place when we returned from the walk. We walked into the only eatery in town. It was called Mangos. This place is not open every day of the week. We were fortunate about the day of the week we had arrived. The inside of Mangos turned out to be very modern. It was primarily a bar and most folks were at the counter, drinking and watching American football or hockey on the big screens. Our waitress/bartender was very nice and the food was excellent. In general, we have been very fortunate about the food we have been getting for dinner during this trip. It had turned dark by the time we were done. Other than a few lights in the houses, the only big source of illumination were the lights from our hotel across the road. There were no street lights and it felt dark. I had a slight headache when I went to bed because of the altitude. We have been taking diamox for the last couple of days to adjust to the altitude. 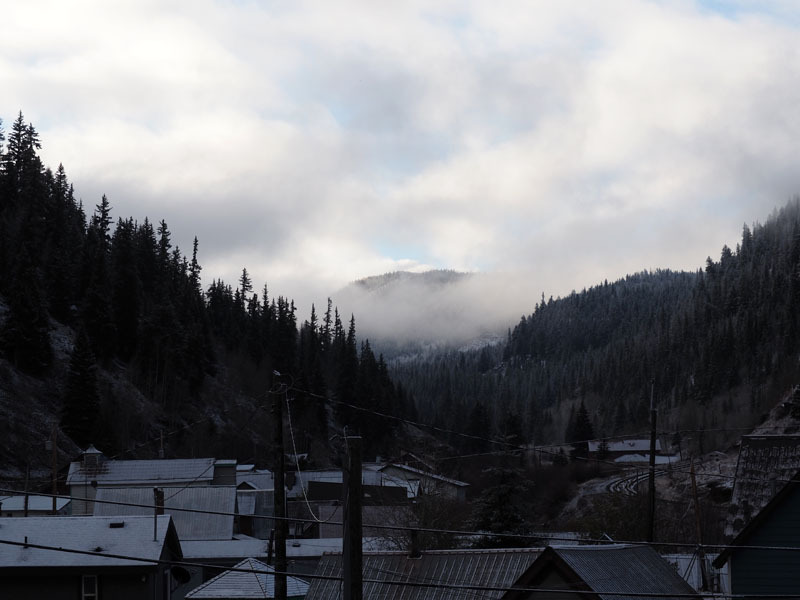 Our overnight stay in Red Cliff turned out to be a somewhat unexpected treat. Today we go to Pikes Peak. 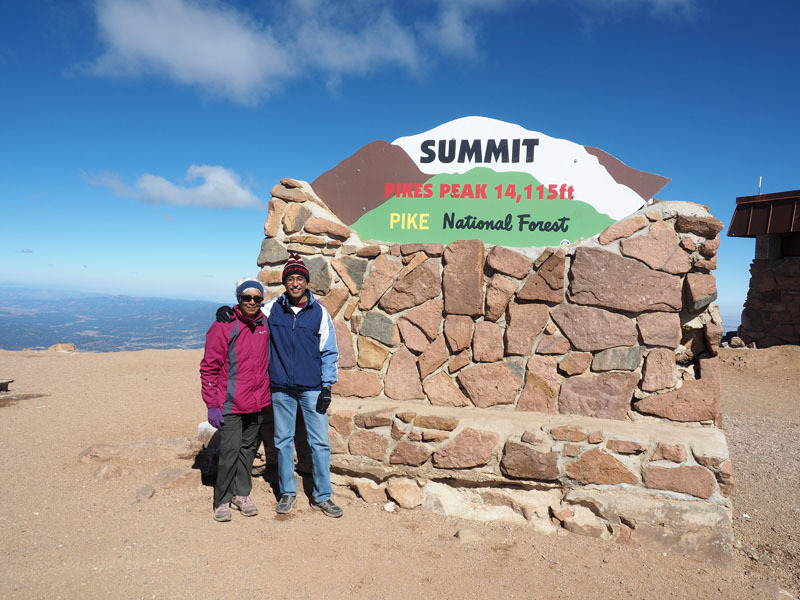 It is at an elevation of over 14,000 feet. It was raining when I woke up, and it would occasionally rain heavily enough that you could hear it quite loudly. This part of the ride had been planned carefully. 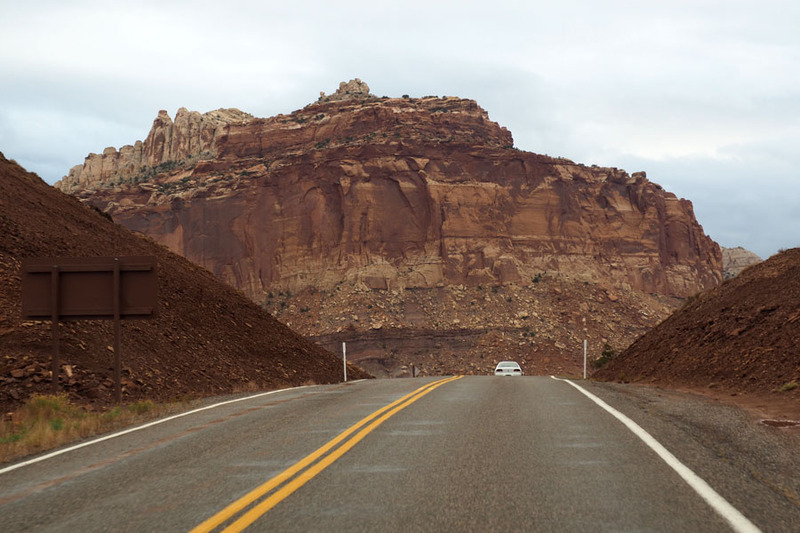 We had been told that the drive on Utah Route 12 to Torrey and Capital Reef was especially beautiful, and that we should drive this stretch in the morning. It seemed that all this planning was going to come to naught. It did not look like a promising start to the day. 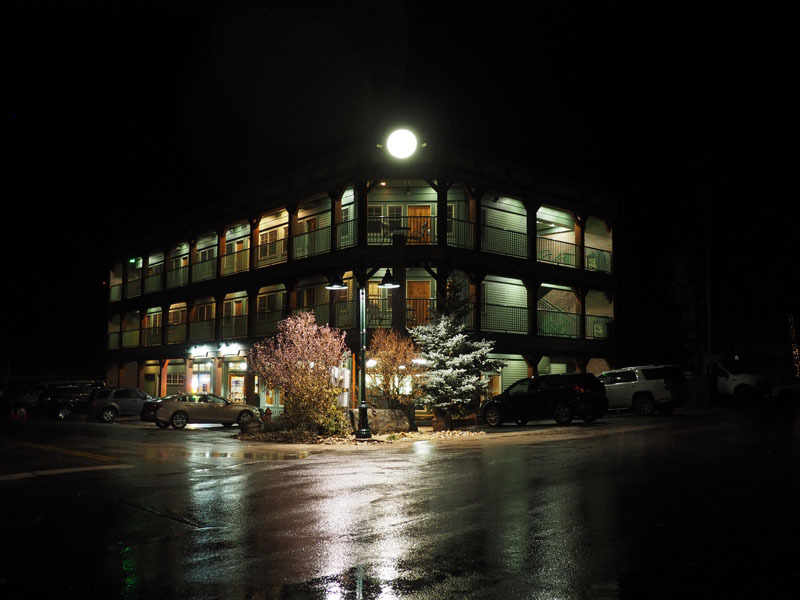 I took some more pictures of the Grand Staircase Inn before we departed Cannonville. It was raining as I crossed the highway to take a few pictures. In a short while we began to see snow on the mountains in front of us. 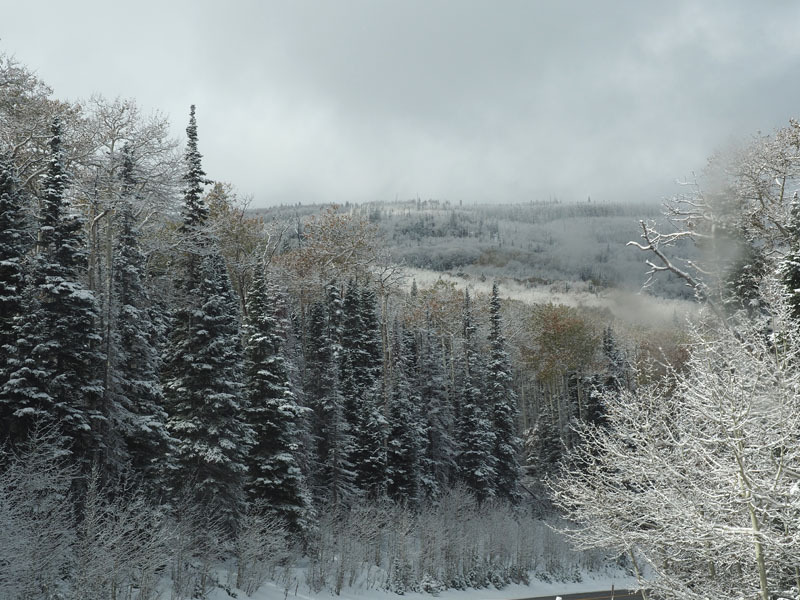 As we climbed into the mountains, the temperatures began to drop, until they were below freezing, and the rain also changed to a steady snowfall. The snow continued for a while. We even passed a snow plow. 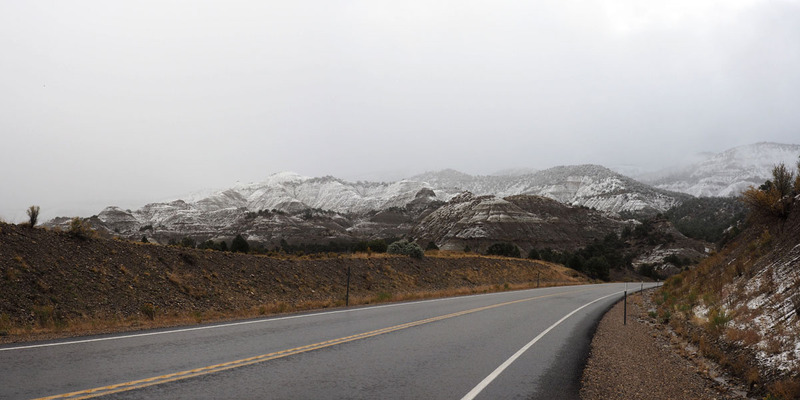 After a while, as we were driving through a valley between mountains next to a dry desert wash, the snowfall stopped. We could even see the sky brightening up in the distance. 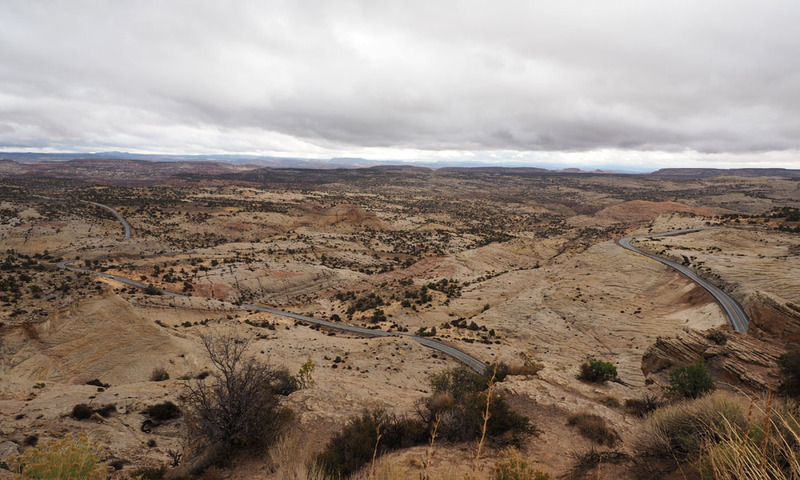 All this while our drive had been alternating between the lands of the Dixie National Forest and the Grand-Escalante National Monument. 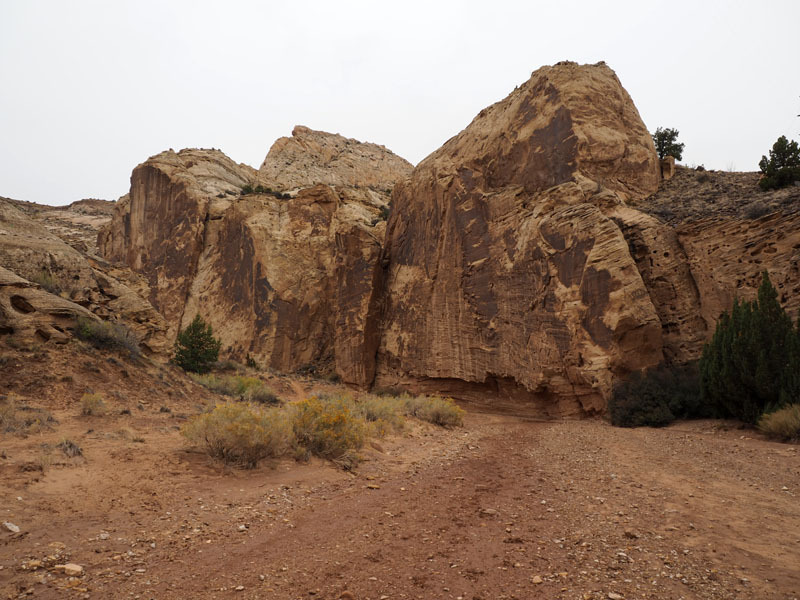 In a short while we arrived at the town of Escalante and the offices of the Bureau of Land Management (BLM), a division of the US Department of the Interior that runs Grand-Escalante National Monument. They had a museum dedicated to the National Monument. Although it was a small museum, there was a lot of interesting information to be found. 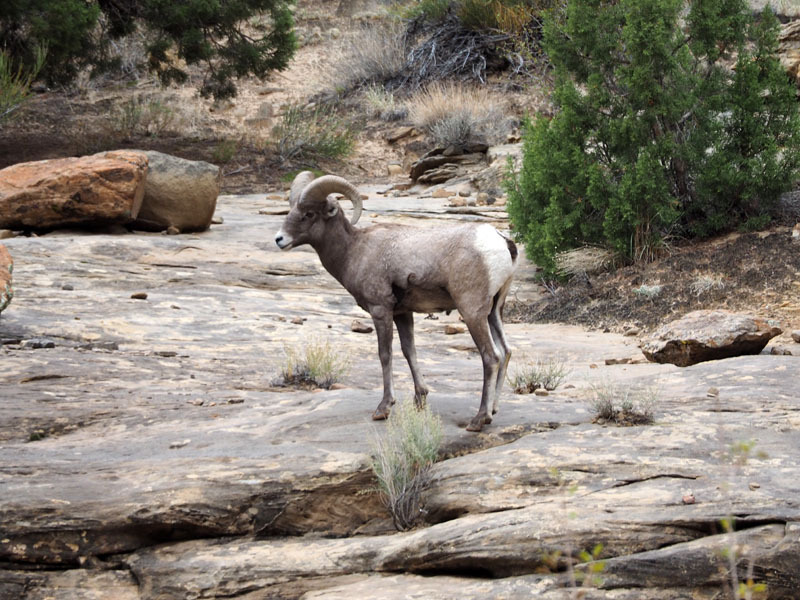 The mission of the BLM is to preserve the land and the environment of the National Monument, and to do research and learn more about the land. There are scientists of all kinds who go out looking for, and cataloging, the natural wonders, and the plants and the animals of that region. They study the geology of the land, and do archeological studies. The Hopi and the Paiute Indians used to live on this land. Ancients artifacts of life from their times are discovered and catalogued. And then they look for fossils. They are finding fossils of animals from really old times, including that of dinosaurs, some of them new types of dinosaurs, and some of them of really huge animals. I thought that the movie that they showed in this museum was the best we had seen so far during this entire trip. 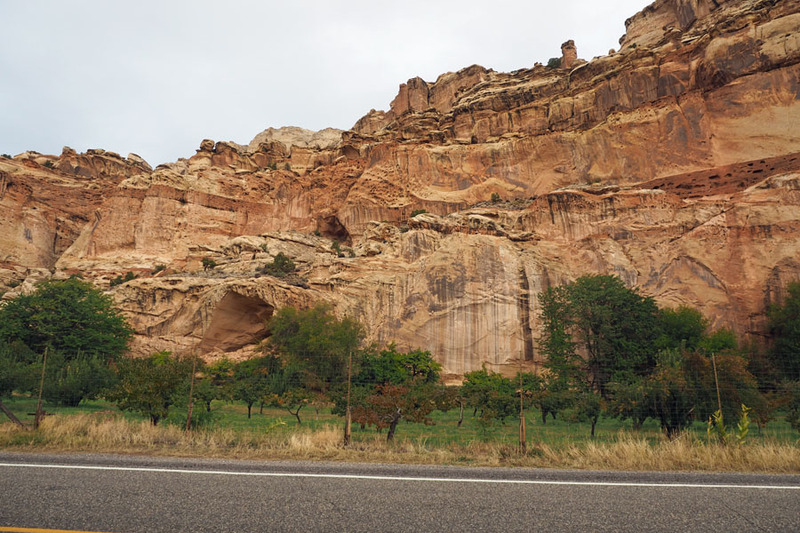 We drove through the town to Escalante. It seems to be a developed place with a lot of amenities of modern life, but it also felt like we had stepped back in time when one looked at the setup of the town, its buildings, and its decor. We even passed a motel called the Prospector Inn. It also looked like the place where people who are interested in the outdoors use as a base for activities like hiking and biking. I wonder if this is a place we would think about coming to for an extended period of time some day in the future. It did not take too long to drive through the town. It was still raining as we drove into the wilderness again. 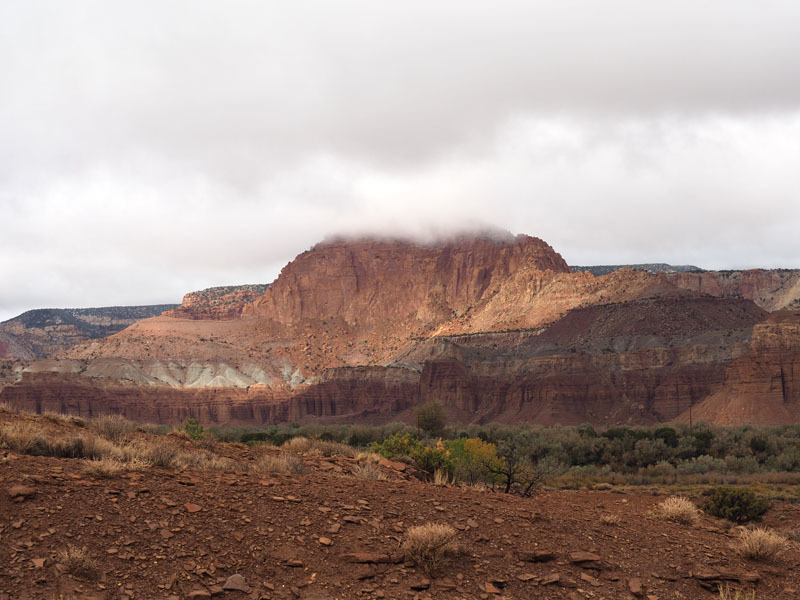 We arrived at an overlook into a valley where we, once again, saw clearing skies in the distance. Below us, we could see the road that we were about to take into the valley. 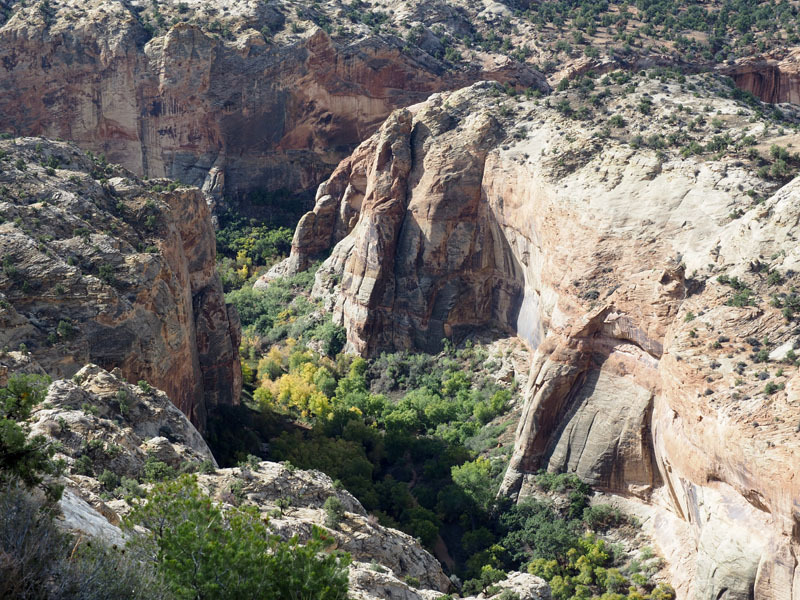 As we crossed another mountain range you could see the green trees below us where the Escalante river was flowing. We are going to get to the road you see in the valley! The road dropped to the level of the river before starting to climb again. Soon the road was running on a high mountain ridge with steep drop-offs on both sides. It was a little scary. Fortunately, there were pullouts where one could stop to take pictures like this. The skies had cleared by this point. The presence of the trees between the mountains showed that there was water flowing at the bottom between these mountains. 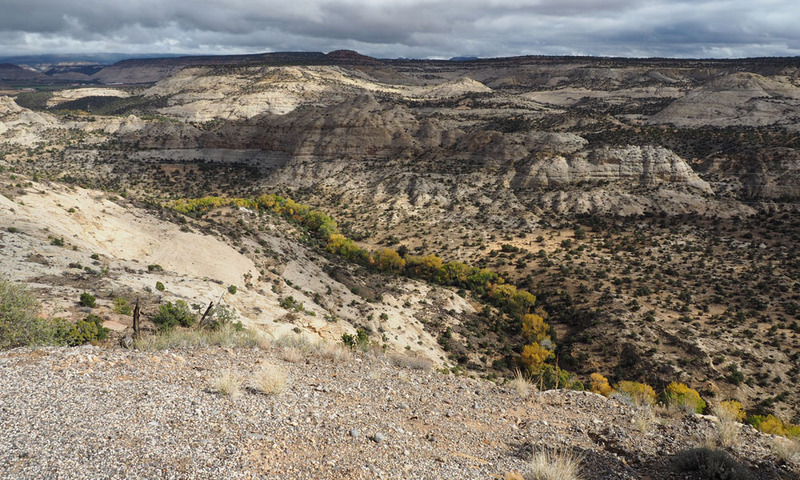 One of these flows is of the Escalante river. We descended from the mountains into a lower area where Boulder was located. And then the road started to climb once again. We started to see cows wandering beside the roadside. Apparently, they are free to graze in the open in these parts. 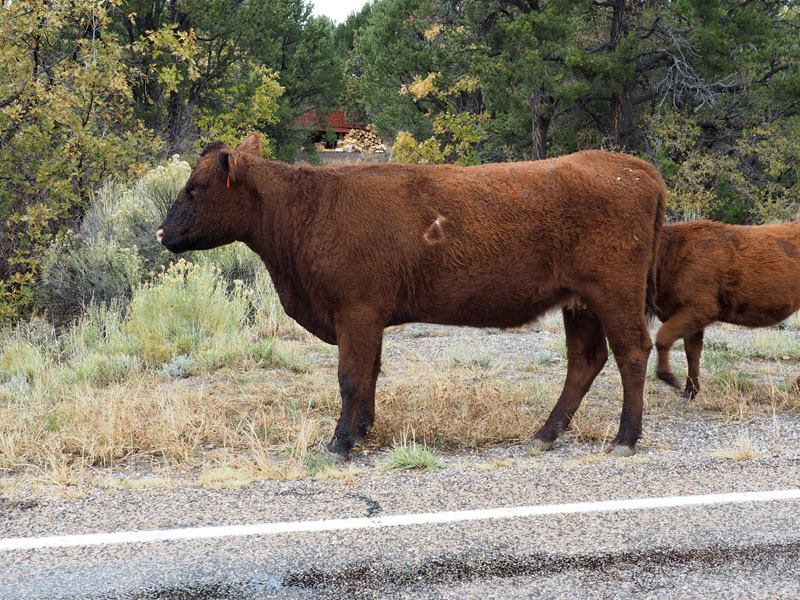 I think this was mamma cow waiting for her little one in the picture below to cross the road and join her. 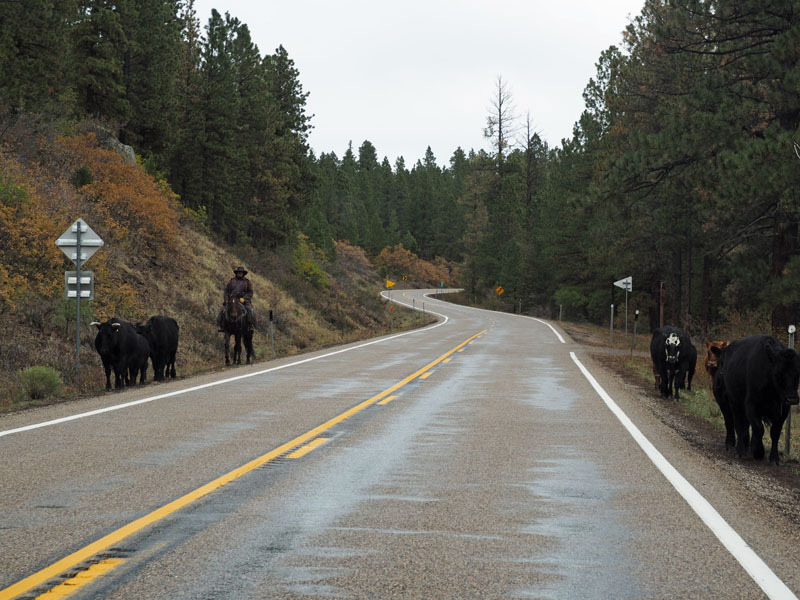 And then we saw the cowboys herding the cattle on both sides of the road. We slowed down to let them pass. It is quite clear that we are in a part of the west that was captured in the western movies of a time gone by. This is John Wayne country! The towns that we are passing through, the local hotels that we are staying in, the food, and the way of life here is from another time and place. Wow! The road continued to climb until we reached a point where we began to see snow on the roadside. It had snowed recently. 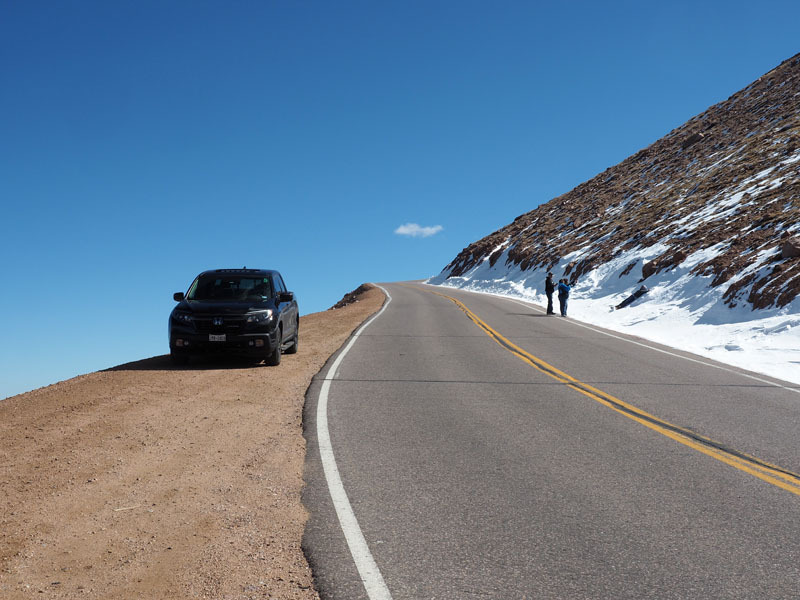 We crossed the summit of the road at an altitude of 9600 feet. 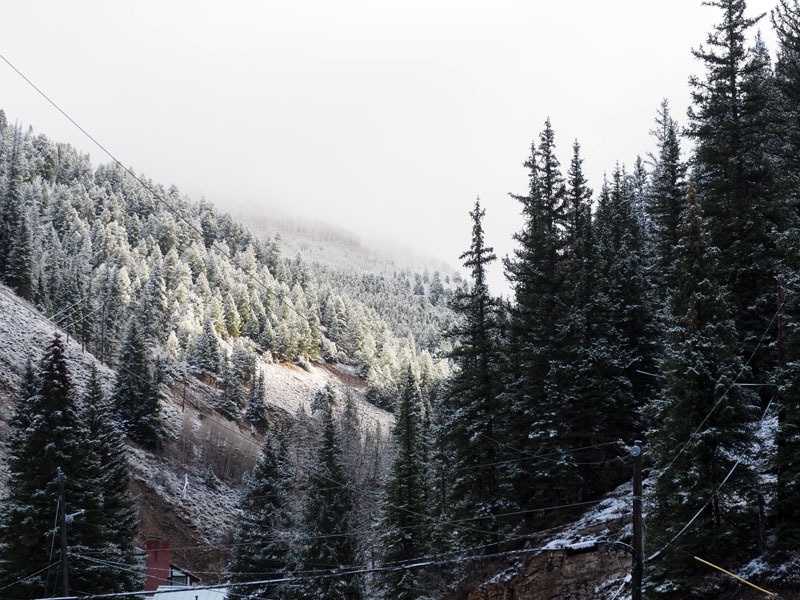 We then started descending through a winter wonderland. 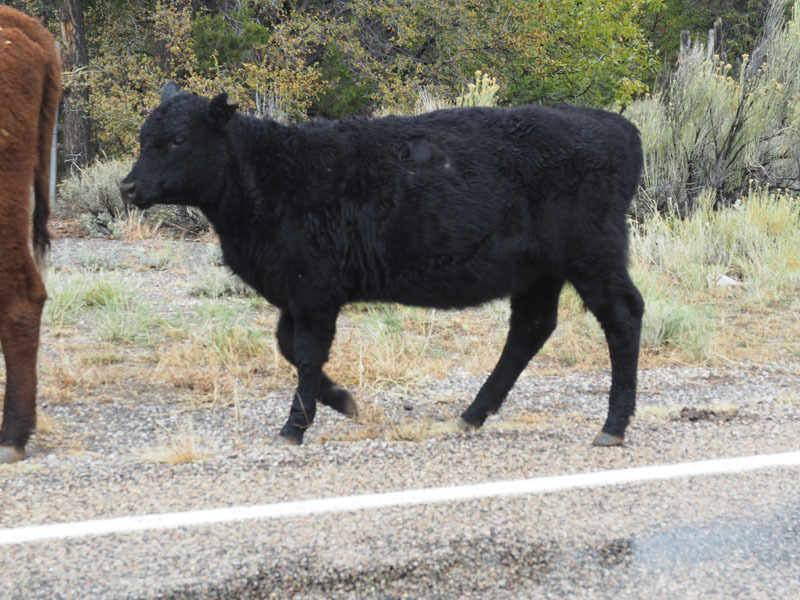 That was when we encountered this cow that looked lost. I wonder if the cowboys had lost one of their cows. 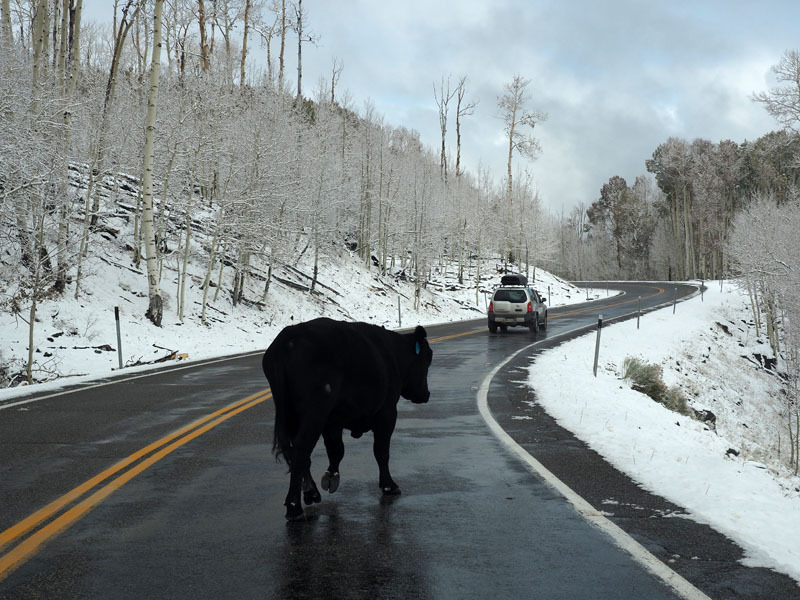 The cow actually crossed the road in front of us to the side with a drop-off that looked somewhat steep. We think the cowboys lost one of their cows. Hope it made it home safely! There was more snow on the way down. In a while we dropped below the snow level. 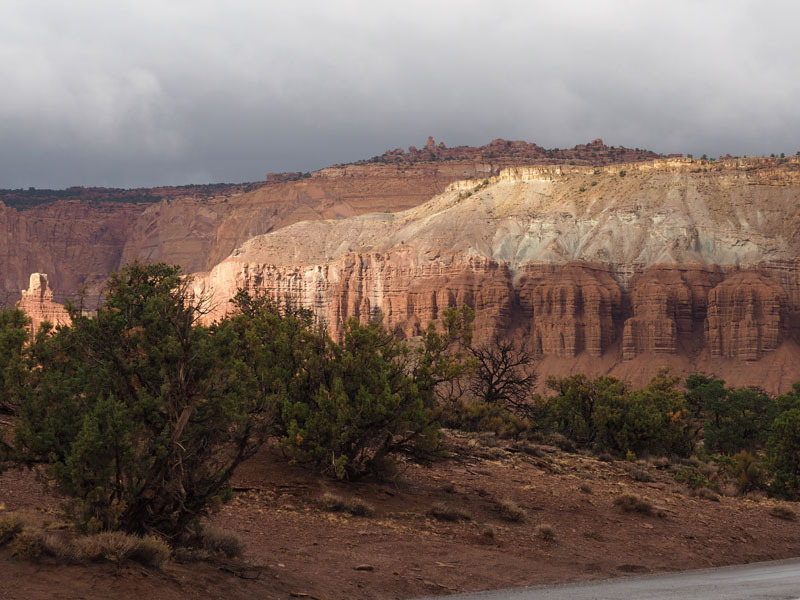 As we approached the town of Torrey near the Capitol Reef National Park, we could see the distant mountain cliffs with sections lit up by sunlight. 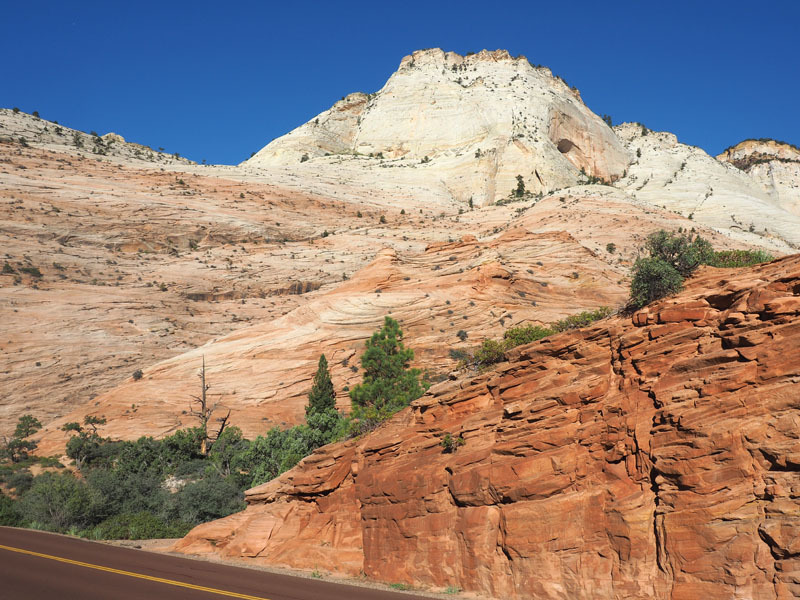 We ended our unexpectedly eventful and exciting drive on route 12 at this point and turned east on to Utah Route 24 to head into the park. This part of the drive had taken much longer than I had anticipated, but we had thoroughly enjoyed the experience. In fact, one is tempted to dedicate an entire blog to that topic. 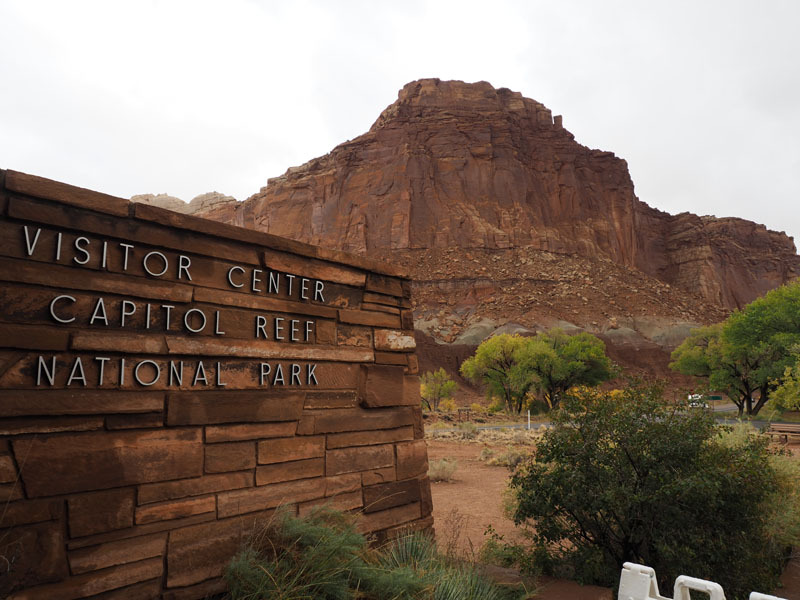 Capitol Reef is quite close to Torrey. 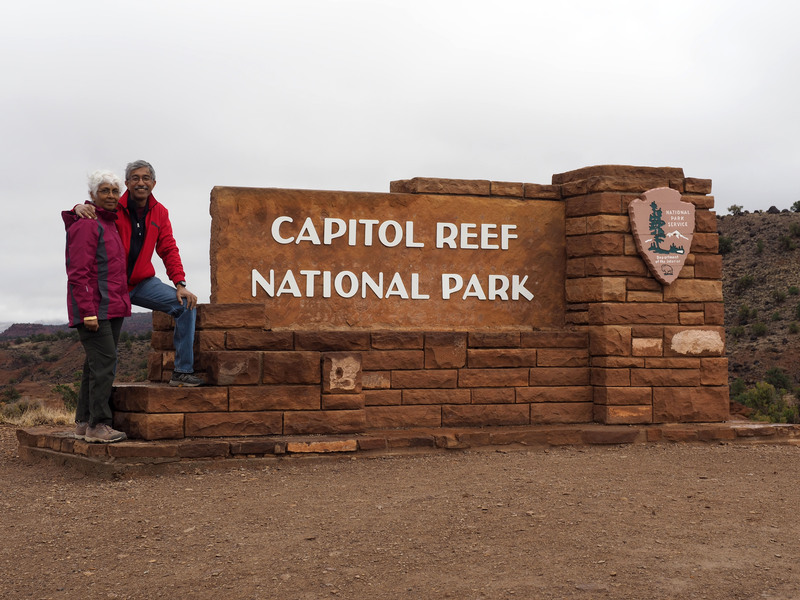 It was afternoon by the time we arrived and it was raining as we went to the visitor center. We drove to a picnic area for lunch after watching the movie at the visitor Center. Because of the weather, we were not sure what we were going to do the rest of the day. 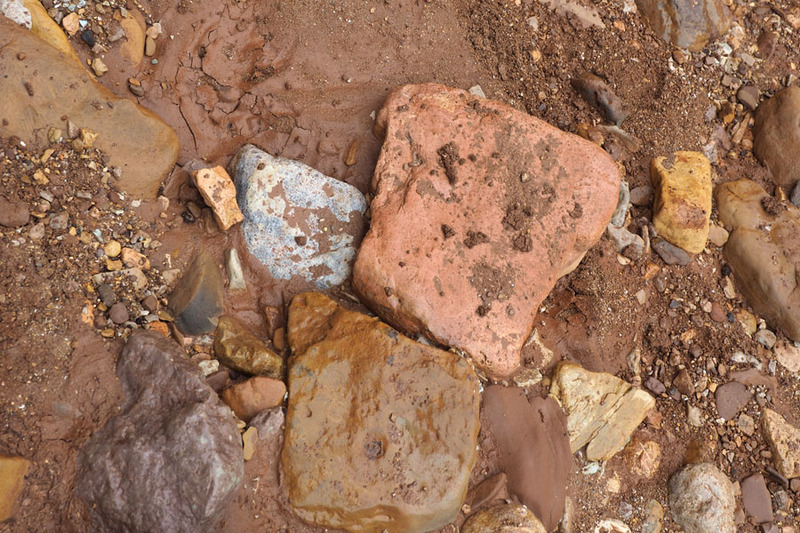 With all the water on the ground, the red sandstone mud was becoming sticky and slippery. It stuck to your shoes and tracked into the car, and any other place you walked into. We decided to drive to the end of the scenic road in the park, and follow the dirt road at the end of this paved road for a couple of miles to a trail called the Capital Gorge Trail. 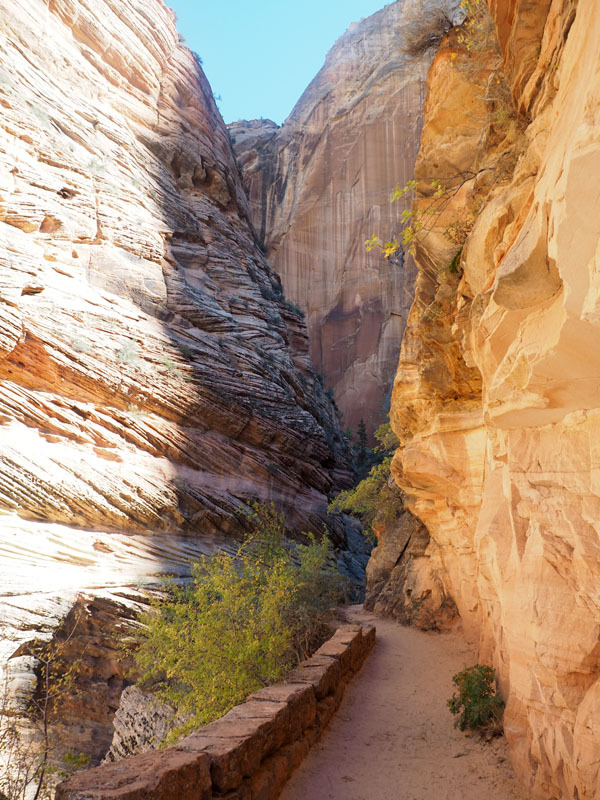 The unpaved road ran through a narrow canyon between two mountains. 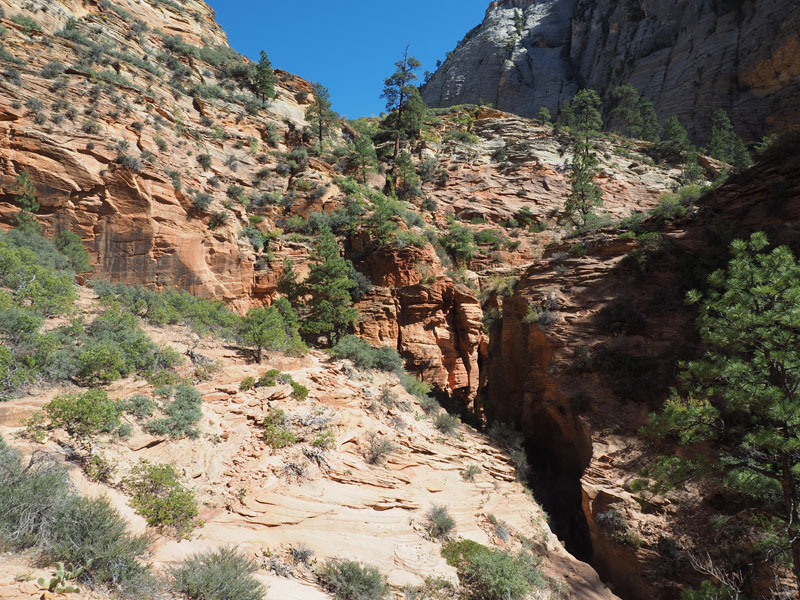 The trail was into a deep canyon. It started raining somewhat heavily as we were driving on the paved road. 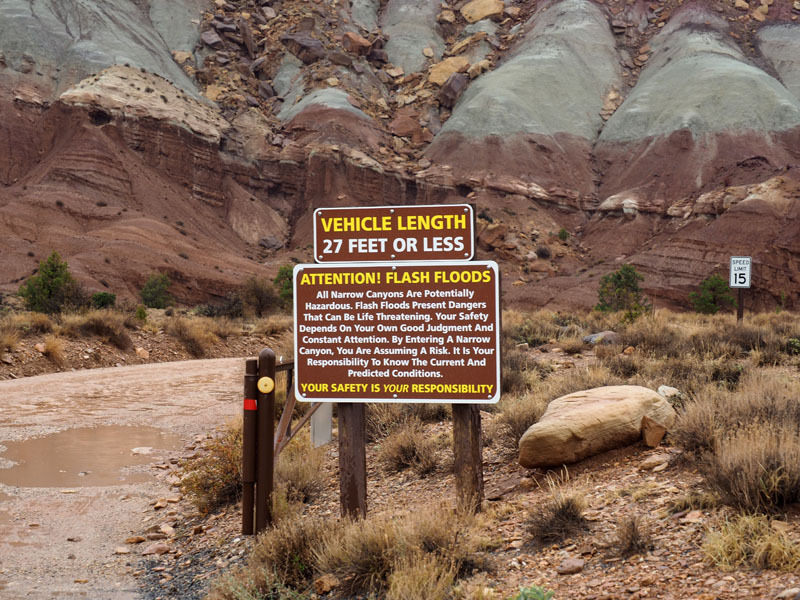 An interesting aspect of this road was that it crosses a large number of desert washes that fill with water when there is flash flooding, and that the roads did not use bridges to cross these washes. You essentially forded the washes. You had to keep off the road if there was flooding. It was raining somewhat heavily when we got to the end of the paved section of the road. 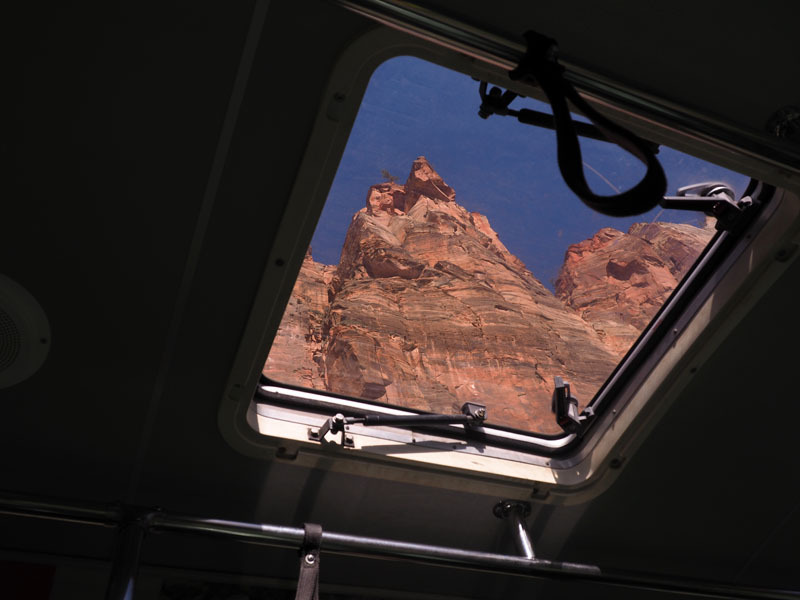 There was some nervousness about entering the canyon under these conditions. So we turned to head back towards the Visitor Center. There was nothing to do but to take it easy the rest of the day. 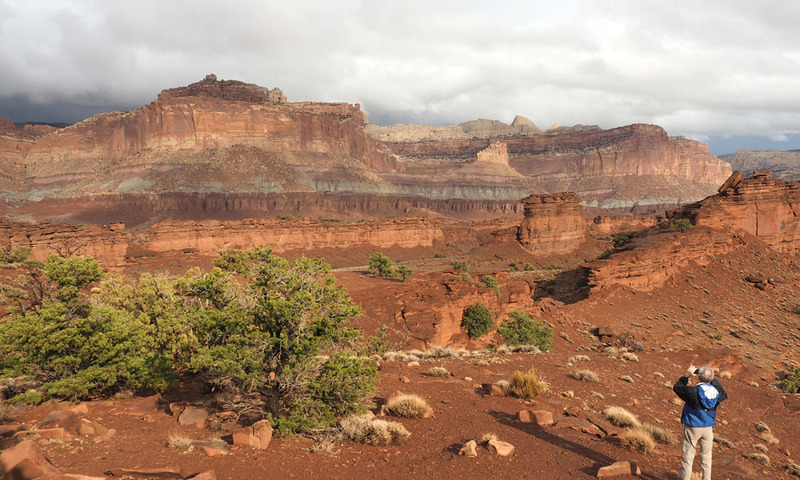 On the way back, we crossed another dirt road that led to the trail head for a different canyon walk. The vehicle in the picture below sped its way past us on to the dirt road, splashing through the red muddy water that was already pooling on its surface. This park seems to be a somewhat laid-back place. 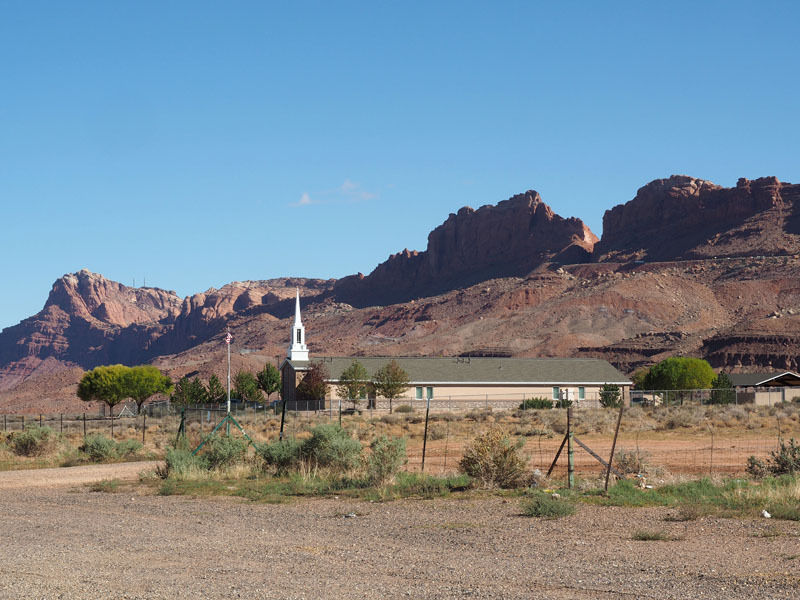 At the center of the park is what used to be the town of Fruita, a place that was occupied by the Mormons in the first half of the 20th century. They used to farm the land. Some of the artifacts of life from those days are still around, and some of them are still used. They still have fruit tree farms and produce canned goods like jams and jellies, and have other items for sale. You can buy some of this stuff at the Gifford House. We consumed some locally made ice cream while sitting in our car. It was too damp ans cold to sit outside. 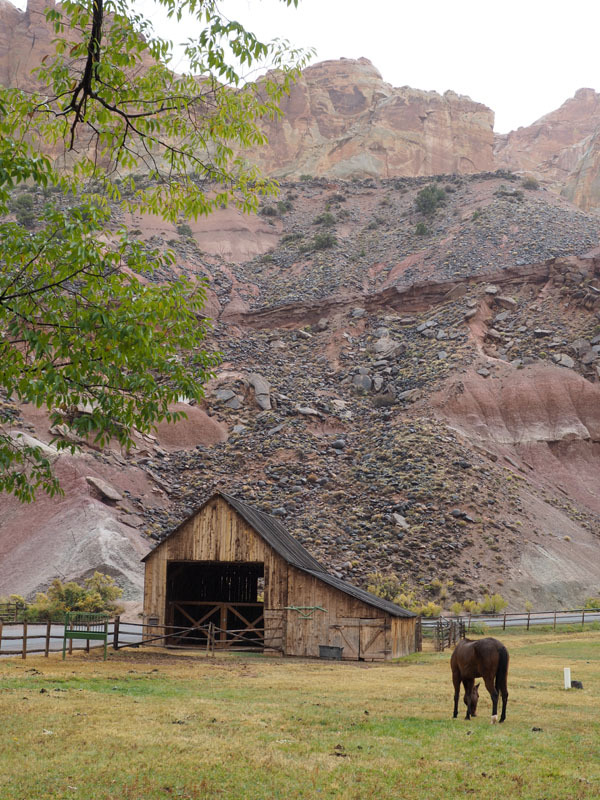 The barn in the picture below is what you will see in a lot of articles about Capitol Reef National Park. We were going to leave the park and check into our hotel early because of the weather. 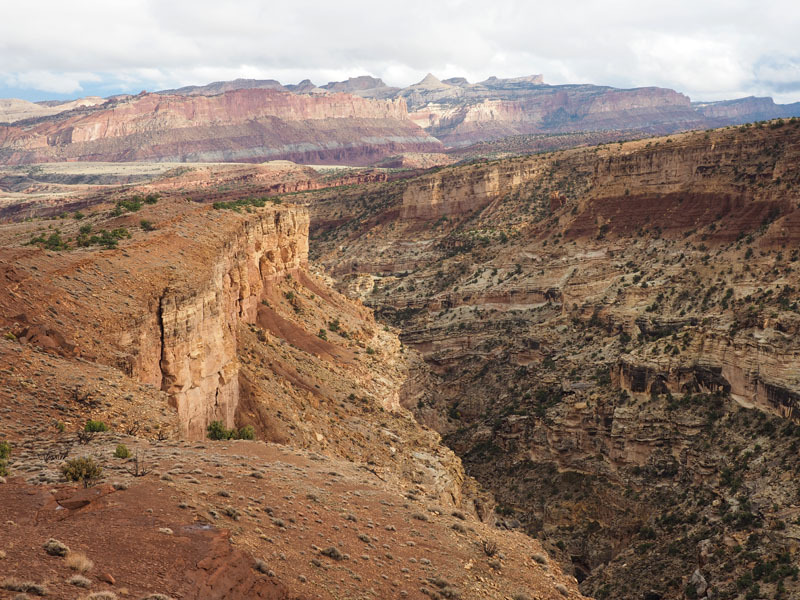 We decided to stop at the Goosenecks Overlook, and also take the Sunset Point Trail at this location, on our way back. This turned out to be a good decision. The skies actually began to clear up in the distance as we approached the viewpoints. 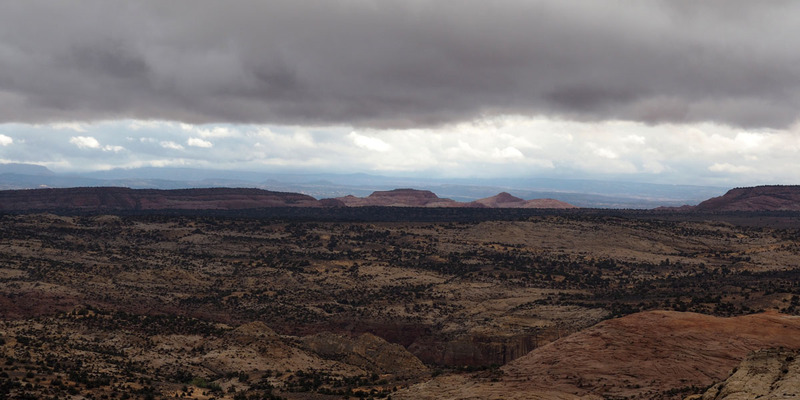 The next picture is from Goosenecks viewpoint. You can see why this name was chosen. 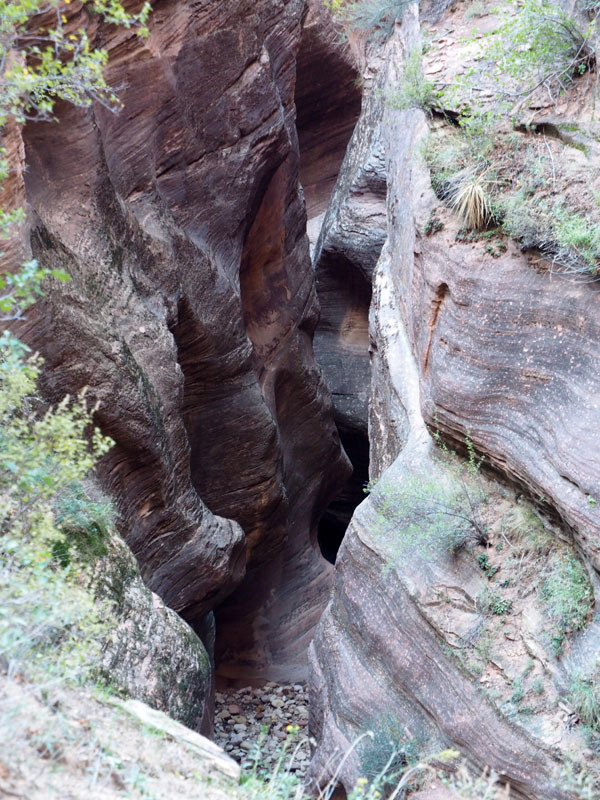 The Sulphur Creek flows at the bottom of this canyon. 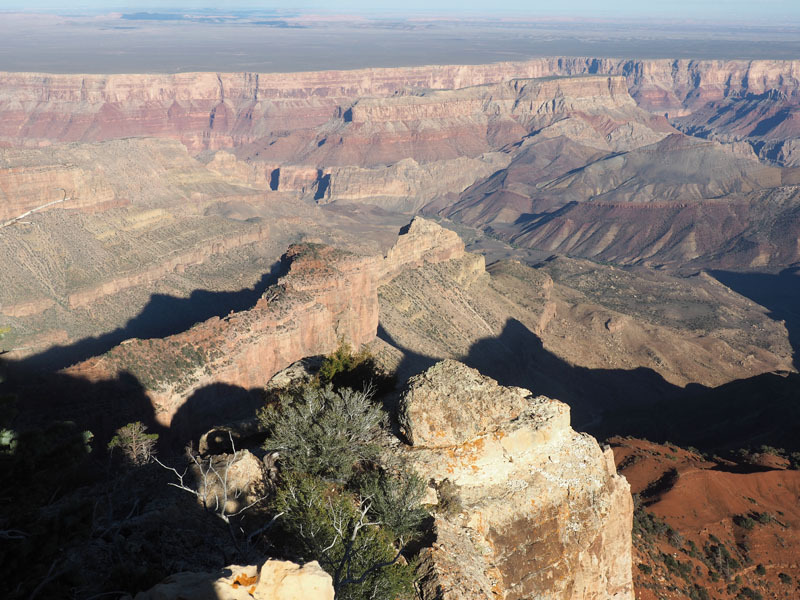 These are pictures of the canyon from the Sunset Point trail. I thought the green layer running through the mountain range was striking. 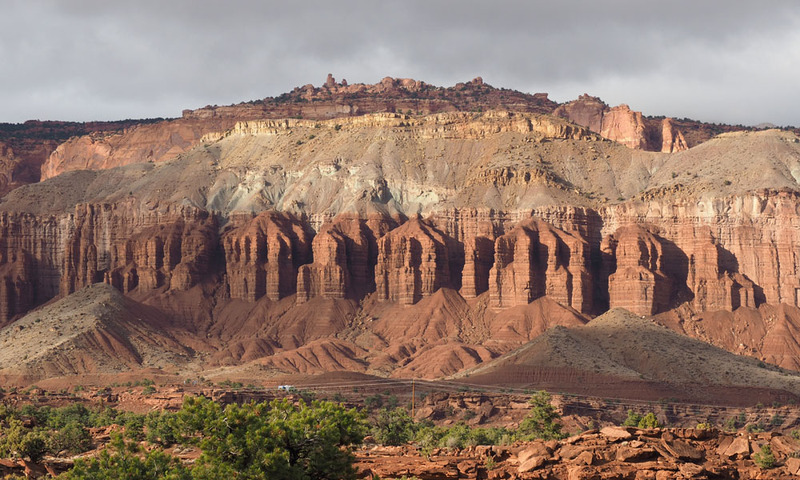 Here are more pictures of the mountain range that dominates Capitol Reef National Park. 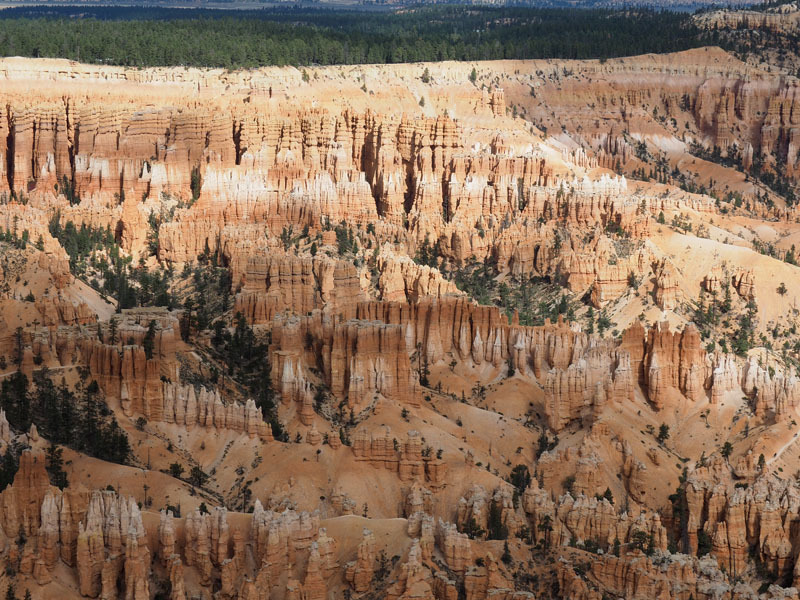 These are also taken from the Sunset Trail. (Click on the picture!) This is a close up of one section of the range. 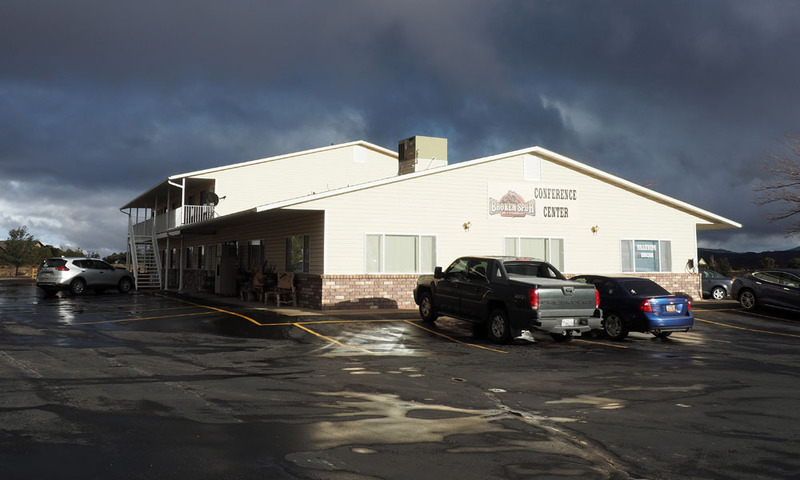 The sun had popped out of the clouds by the time we arrived at the Broken Spur Inn and Steakhouse, the place that we were staying. 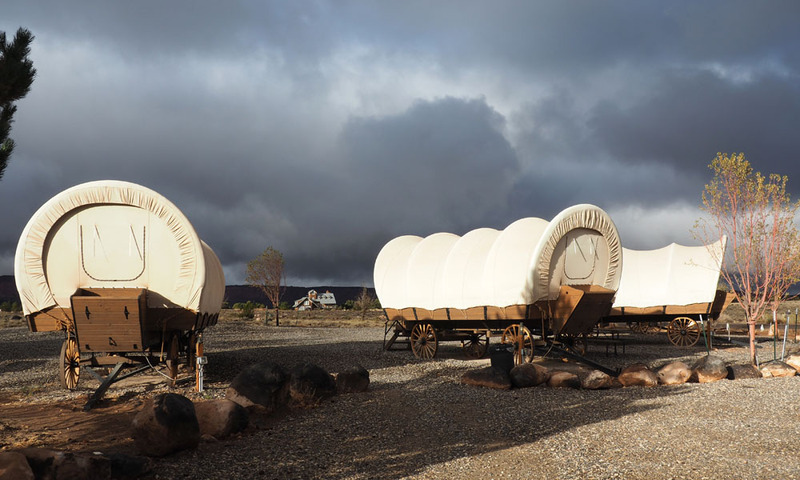 The property also includes a section where you can spend the night in a covered wagon. We did not do that! It was an early dinner at the steakhouse. The place was quite busy. Beef dominates the menu list here. For dietary reasons, we generally do not eat beet. We were able to find something else. The food was top-notch! I have to note that I have been drinking only the local beers during this trip. Many of them seem to come from Salt Lake City. They are pretty good. We plan to spend the morning today in the park if the weather holds up. We then head east towards Colorado. We are headed towards the tail end of our trip! When we went down for breakfast at about 6:30am, we were greeted by a crowd of Chinese tourists finishing their breakfast. They had their luggage with them. They were about to board their bus and be on their way to their next destination. They all looked sleepy. They must have arrived at the hotel after us. In fact, the lady in Luo’s Cafe had been preparing the dinner tables for about 30 tourists the previous night as we left. It might have been for these folks. 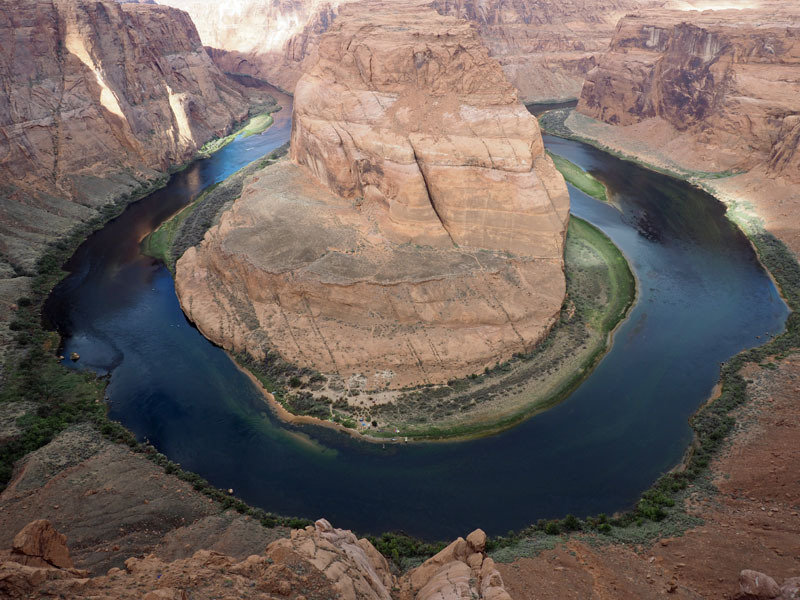 I was wondering if it was the same noisy crowd we had encountered at Horseshoe Bend the previous day. 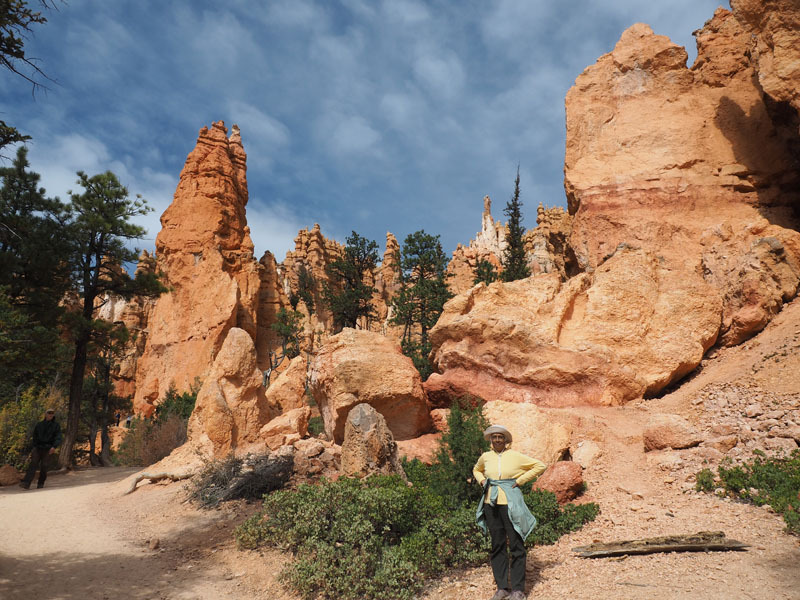 And we did encounter another noisy crowd at Bryce Canyon that evening, shattering the quiet of the evening with their constant chattering and rushing hither and tither to take all kinds of pictures. 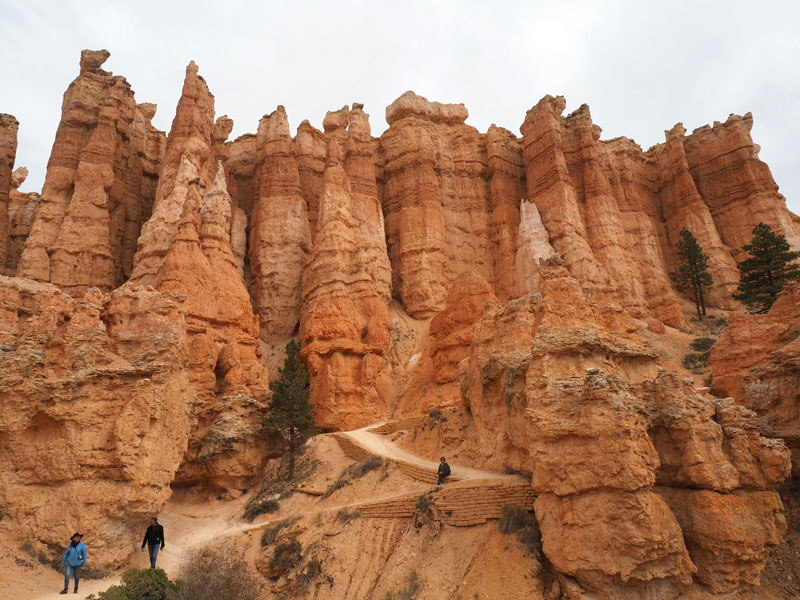 We left Kanab for Bryce Canyon National Park by 8am. It was a relatively early start for us. We had a somewhat long drive of an hour and a half before we reached our destination. According to the thermometer in the car the temperature outside was around 20 degrees Fahrenheit, below freezing. It was cold! The drive was uneventful. 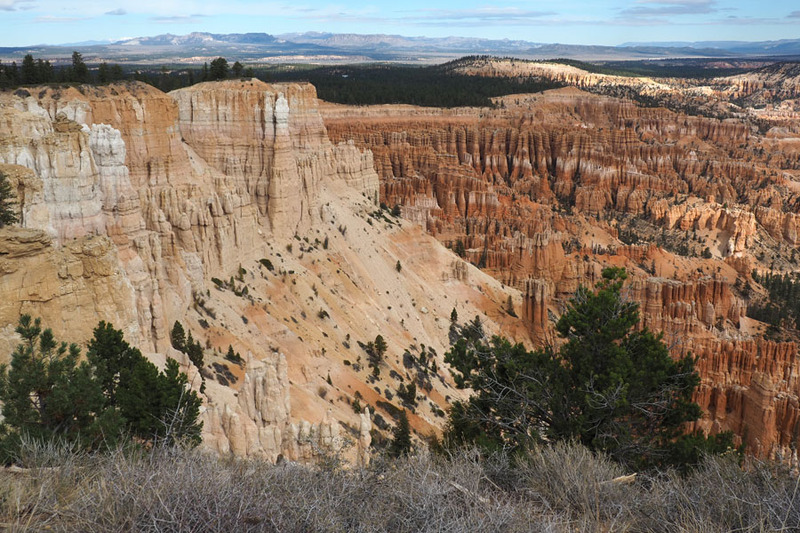 On our way we passed Dixie National Forest and Red Canyon. 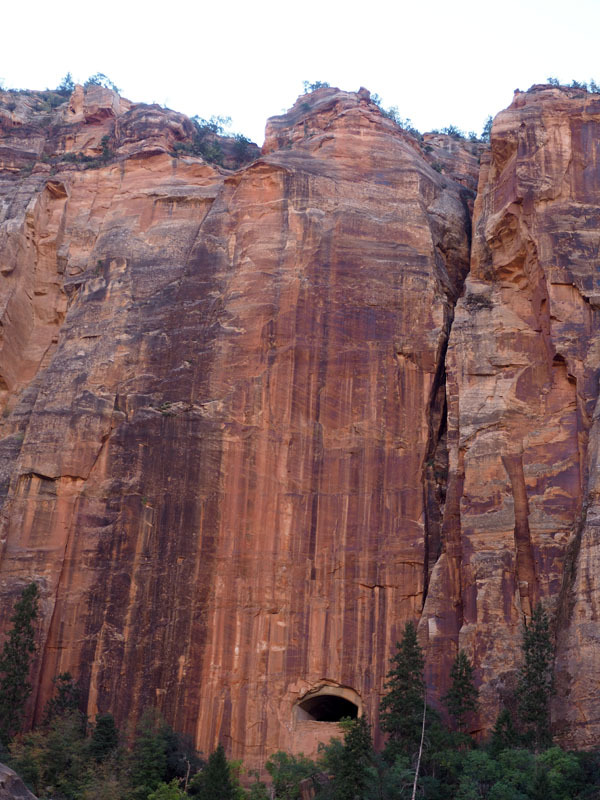 We drove through this tunnel of red rock. 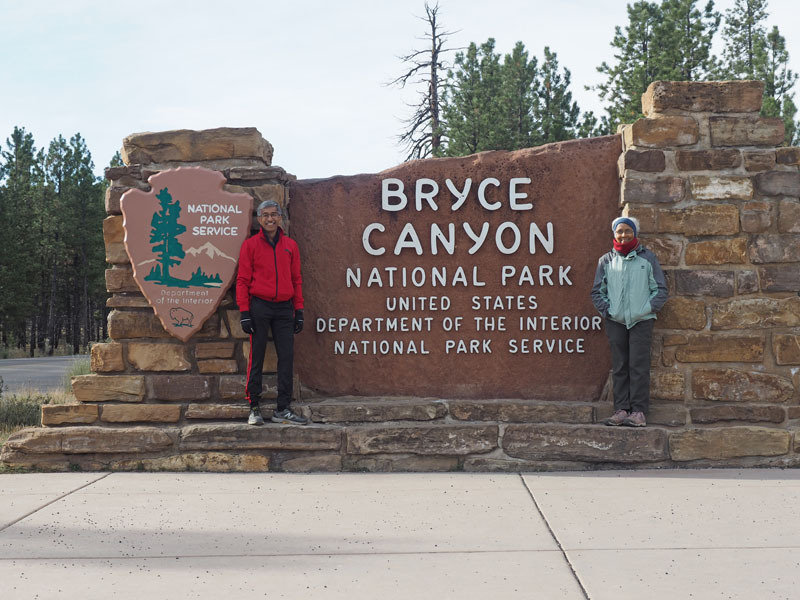 When we reached Bryce, after the obligatory picture at the entrance, we went to the Visitor Center and talked to the ranger to set up a plan of action. 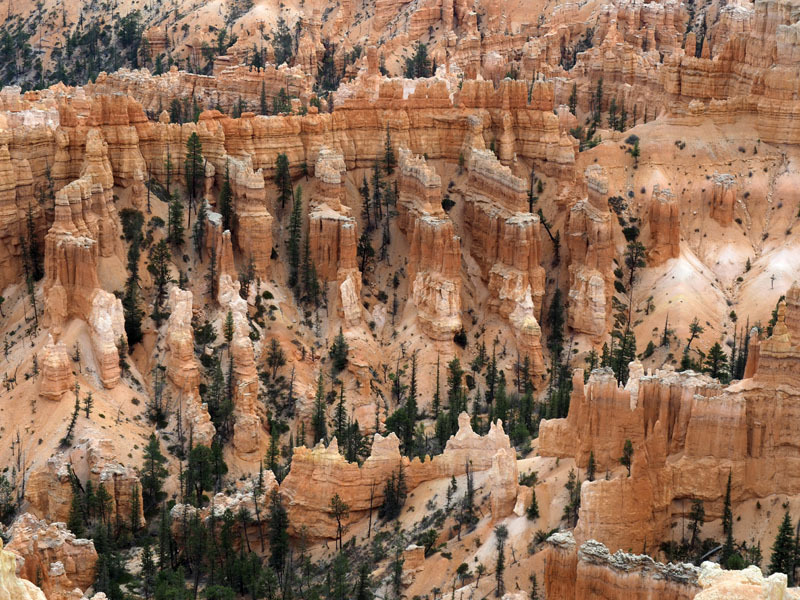 After watching the documentary about Bryce, we took the shuttle bus to Bryce Point for our first view of the hoodoos. (It turns out that we did not need to have used the shuttle. There was ample parking available at the different viewpoints.) It was still cold outside, but in spite of that there were a lot of enthusiastic fellow tourists with us on the bus. It did become comfortably warmer later in the day. 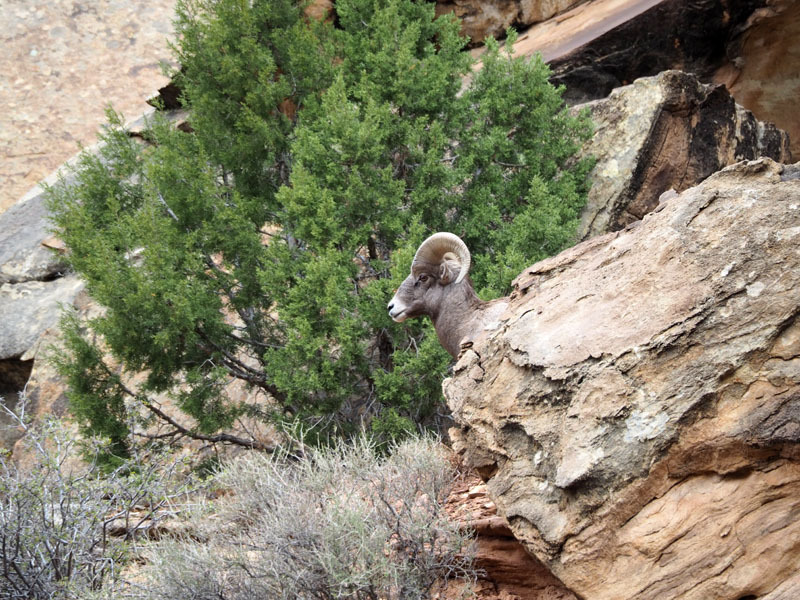 Until you come to the rim of the Canyon you have no idea about the natural wonderland that lies below you. 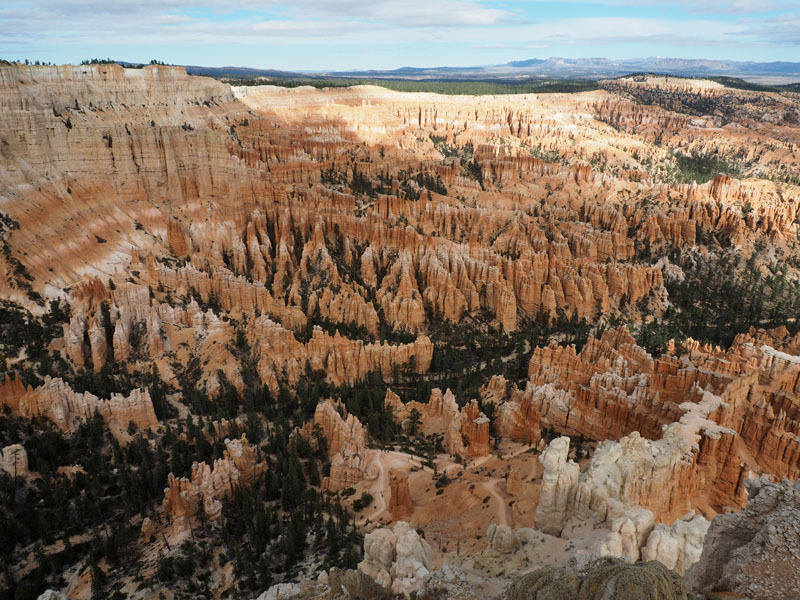 We walked on the trail along the rim of the canyon, stopping at viewpoints along the way, soaking in the dramatic scenery below us. It was like another alien land. Here are some of the many pictures I took. 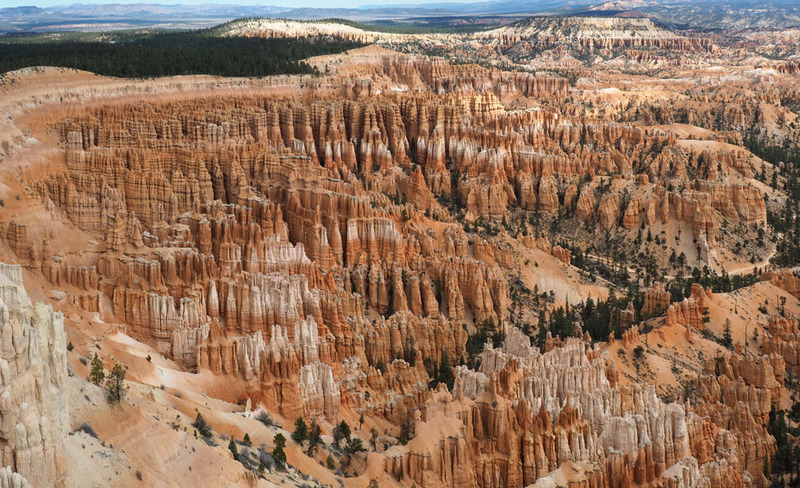 The primary feature of this park are the hoodoos that dominate the canyon floor. We passed Inspiration Point and then stopped at Sunset Point for some lunch. 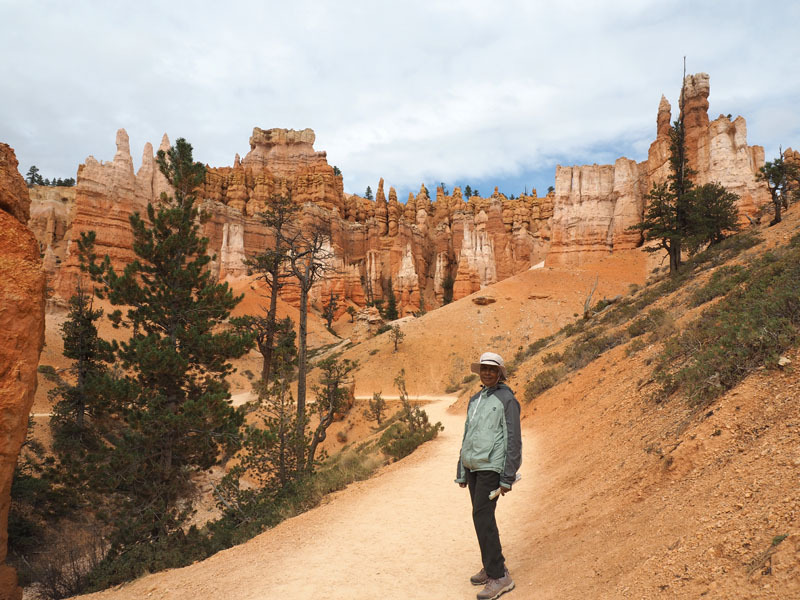 After lunch, we walked further along the rim to Sunrise Point, and then took the Queen’s Garden Trail down into the canyon valley to walk among the hoodoos. The way down was quite steep, and we could see people going the other way having a hard time with their efforts coming up. 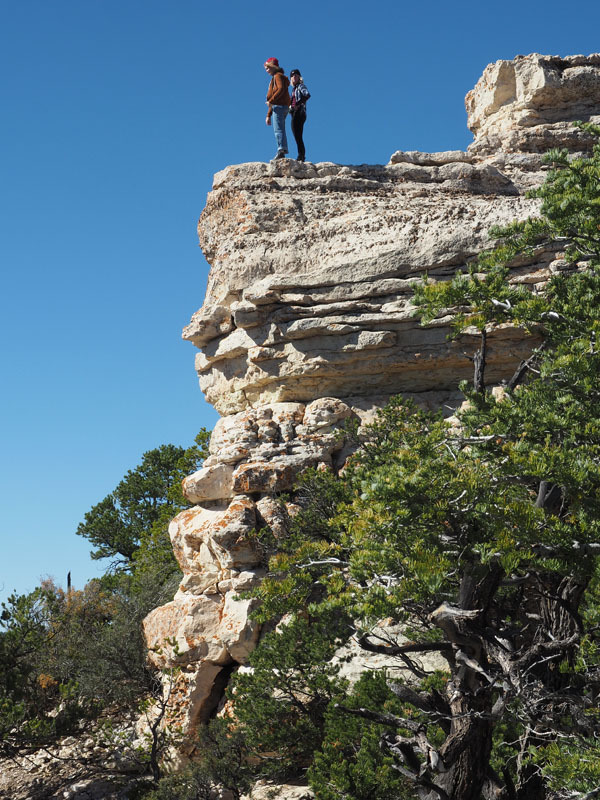 This looked even harder than our climb in Zion National Park, but, fortunately, it was only about 600 feet. 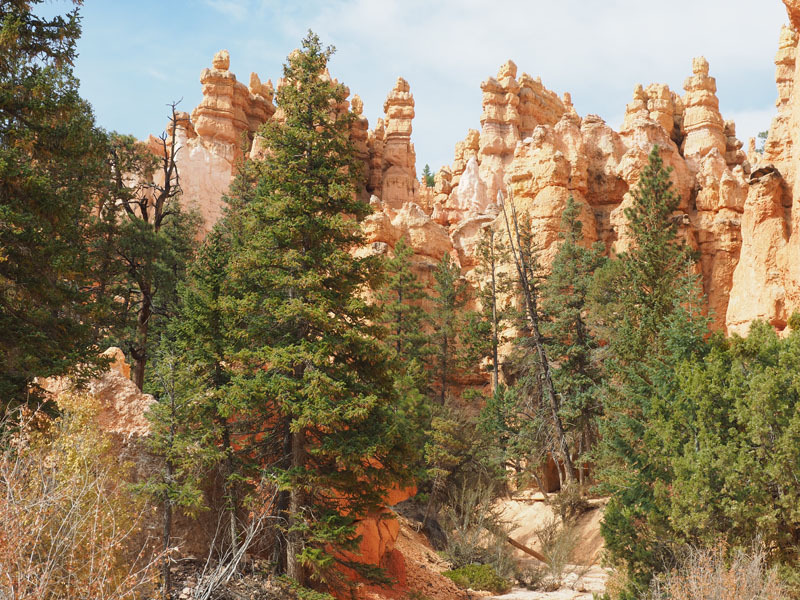 At the bottom of the canyon we walked among the hoodoos and the evergreens. The minerals were a light color when seen closeup. There were lots of signs of heavy water flow and erosion. Birds and chipmunks abounded. We saw people riding horses on the horse trail. There were a lot of people walking on the trails. It was great to see the families with the little kids. 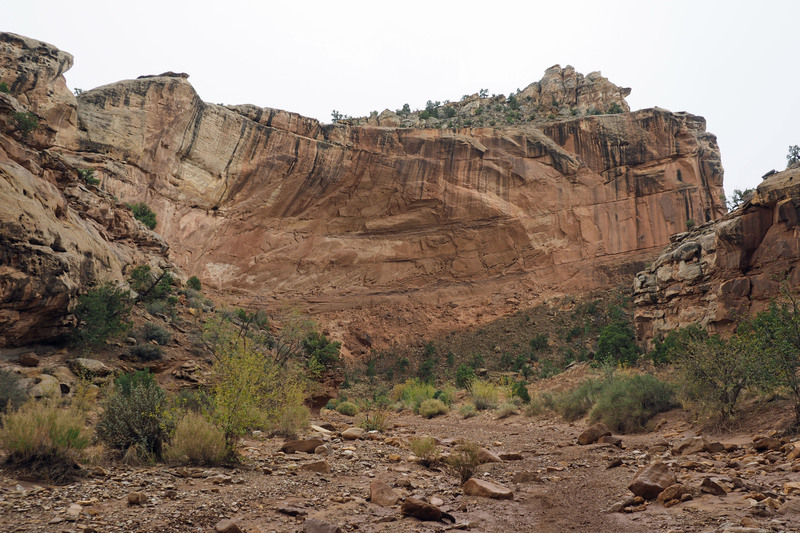 We had gotten on to the “Wall Street” section of the Navajo trail at the bottom of the canyon to make our way up to the top. 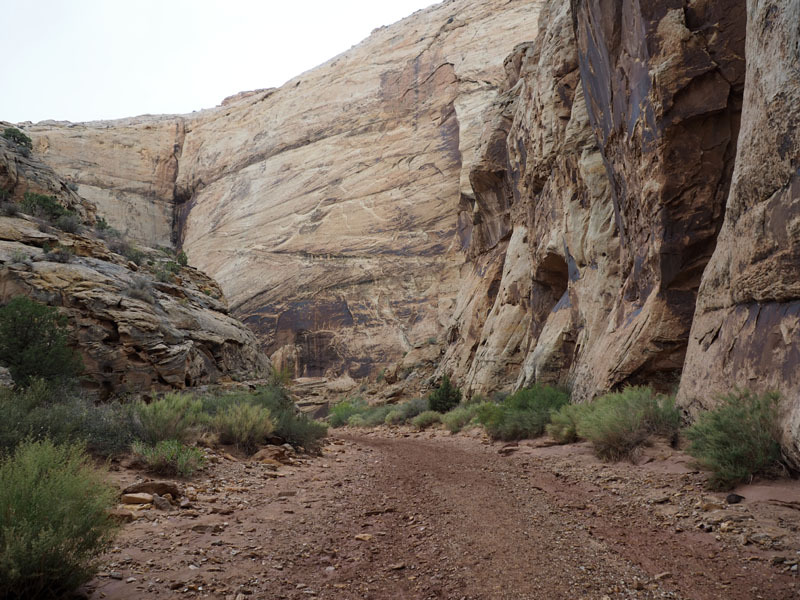 As we walked this trail, we entered a slot canyon. 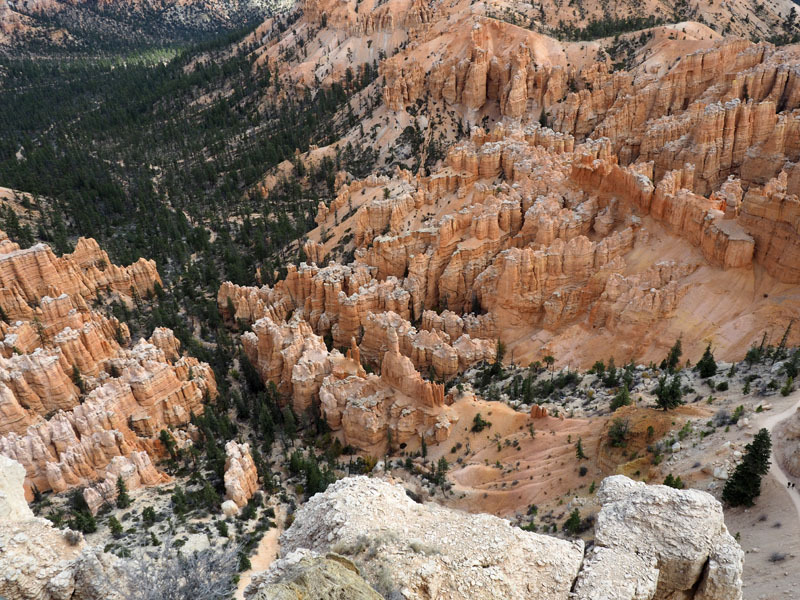 Ahead of us were a series of switchbacks that took you straight up the canyon wall. It was a challenging and fun climb. We were tired at the end of the climb, and this, and the noisy Chinese tourists, were signs for us that it was time to quit the hiking. We had walked over 6 miles, some of it under challenging conditions, by then. We took the bus back the Visitor Center, and hopped into our car for a drive to the viewpoints at the far end of the park. 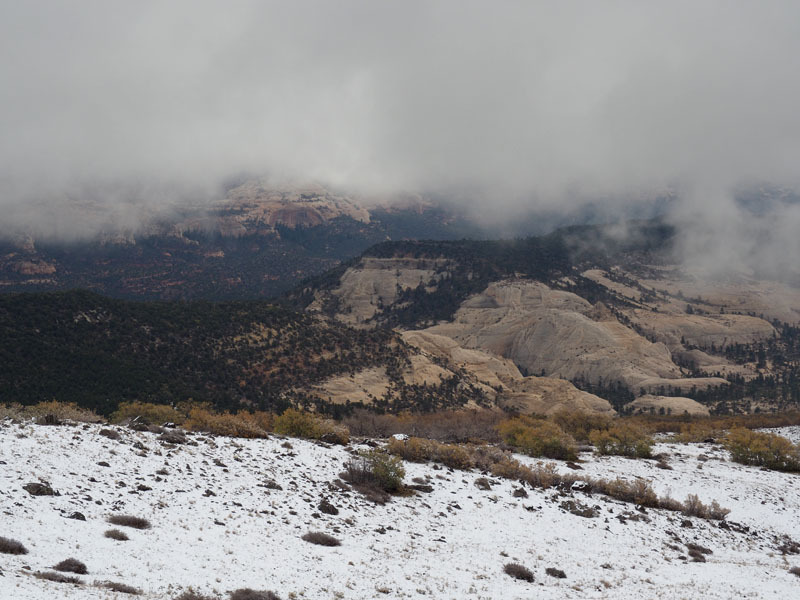 Yovimpa and Rainbow Points, at the end of the road, were the highest parts in the park (over 9000 feet), and the coldest. 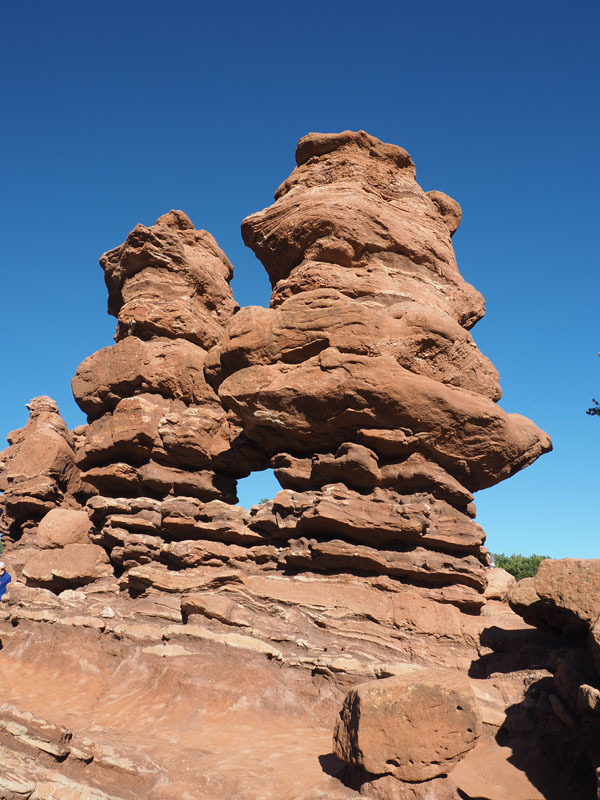 I was not able to get a good picture here, but at the next stop, at Agua Canyon, we saw these colorful formations, including a rock that looked like it was balancing. This is a picture at Natural Bridge viewpoint. Then it was on to our hotel in Cannonville, UT, a few miles away from the park. We were quite tired and left the park relatively early. Cannonville turns out to be an interesting place in the middle of the countryside. To get here, you first pass the little village of Tropic, with its old fashioned General Store, restaurants, gas station, and motels, and with quite a few tourists, perhaps mostly European. 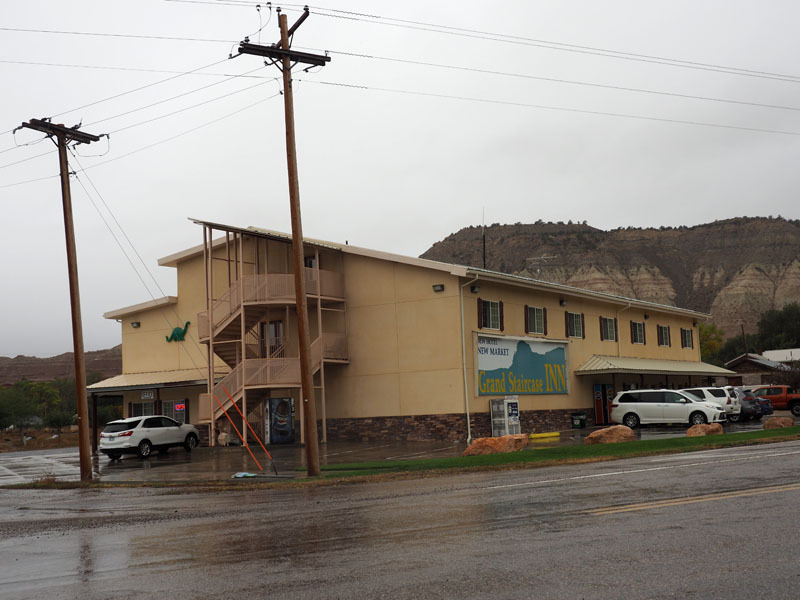 Then you arrive at Cannonville, and this motel is the only big building in town that you see as you turn the corner on Route 12. 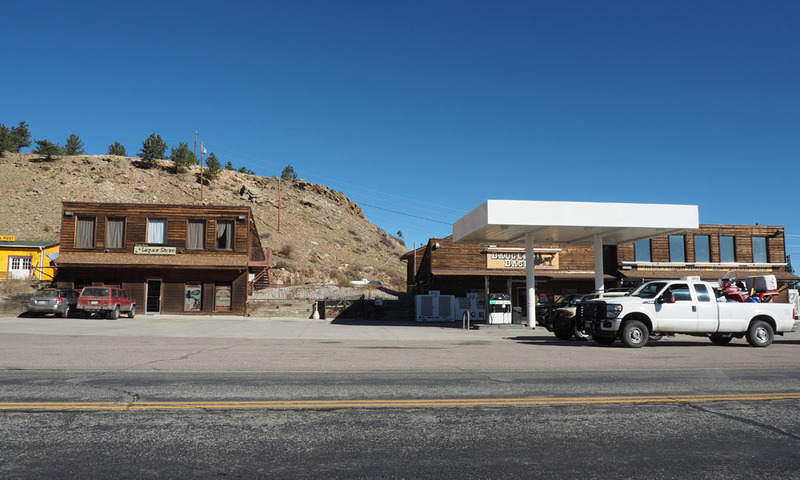 There are gas pumps in front of the building, and you walk into a small country market where the lady who is handling the counter checks you into the hotel. It is all owned by the same people. 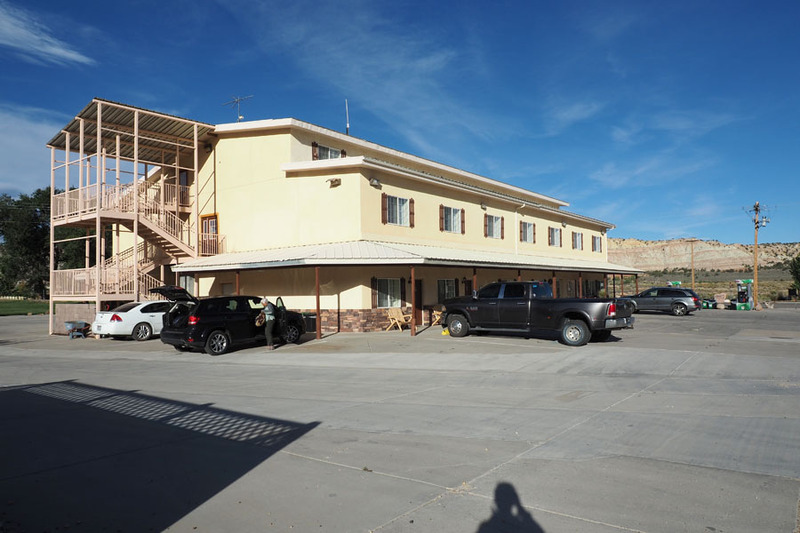 The rooms in this motel are huge and comfortable and have modern facilities, although they have older furnishings. The place is very nice, and it seems to have gained some popularity even though it is in an isolated space. There were a couple of bicycles parked at the front of the building when we checked it. This was a good find! We had dinner last night in Tropic in a small western themed restaurant called Rustlers that was attached to the General Store. The food was good. Everything was fresh. The waitress had an East European accent, which was strange to encounter in a place like this. 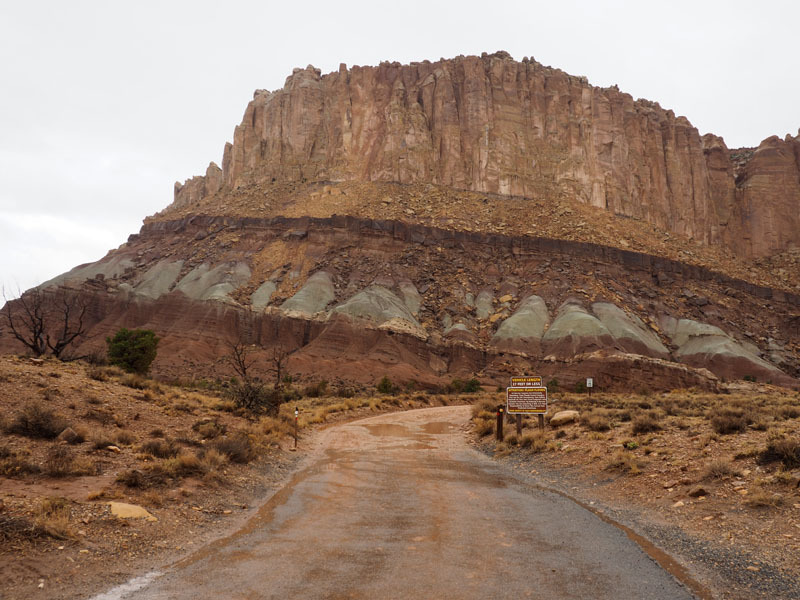 I think it is going to rain steadily today as we make our way up to Capital Reef National Park. Perhaps one should take it easy. 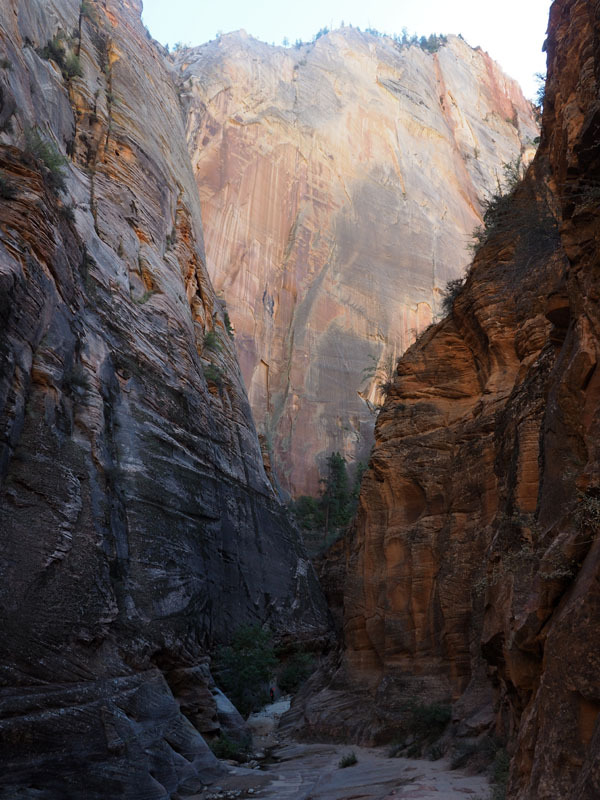 The visit to Zion National Park today was one of the great experiences that I hope to never forget. It was an amazing day! 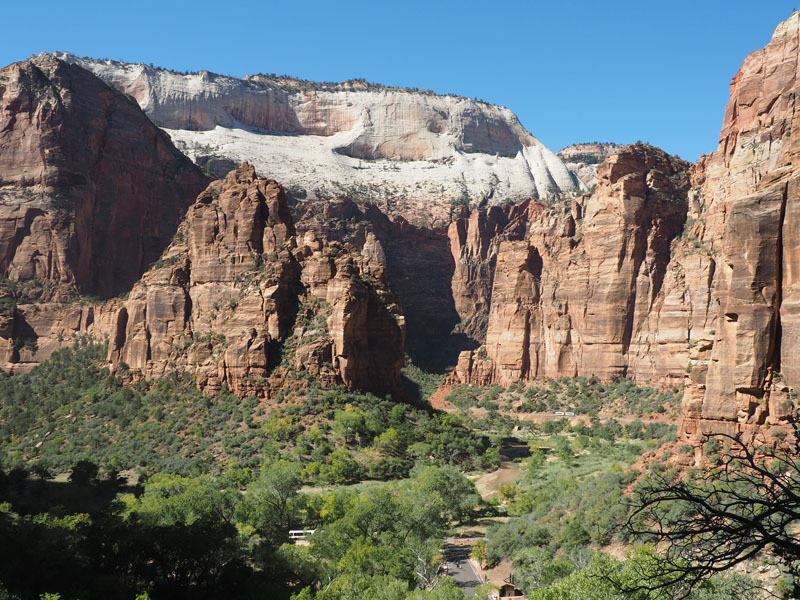 We have a general tendency to avoid the obviously touristy places and their crowds, but Zion was the place that showed me that it is possible to have a great experience even when the place is packed with tourists. 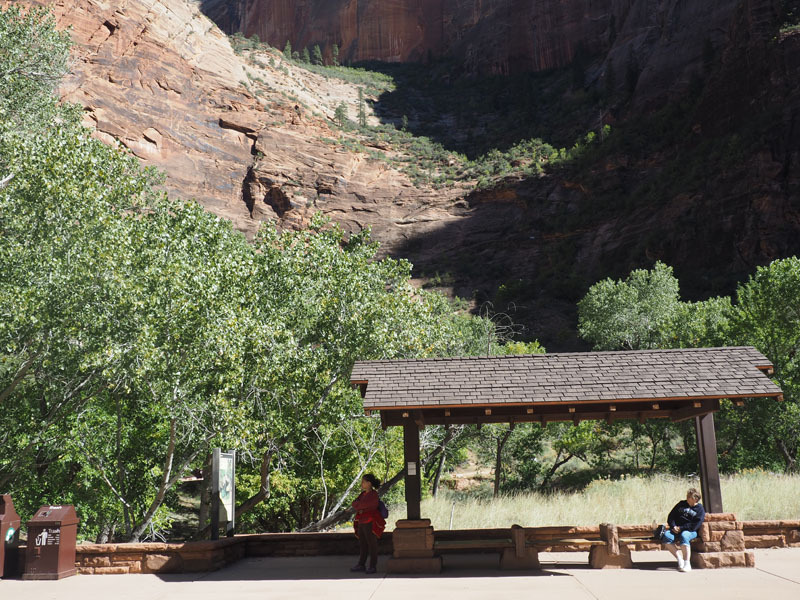 In this case, the park has set itself up to serve the tourists in a very effective way, dealing with the bottlenecks of crowds arriving in large numbers at peak times, and also having most of these tourists passing through a couple of points of entry and through a single visitor center. There is a shuttle bus service which ensures that you do not have to rush through the park in your car causing unnecessary pollution and also frustration in finding places to park during the day. 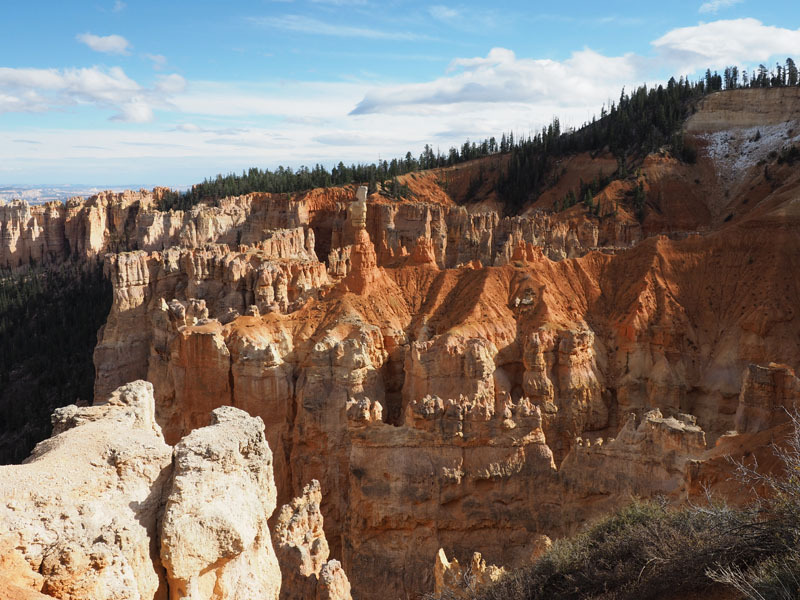 Furthermore, the type of people who come to these places tend to be outdoorsy types, respectful of the space that they are in, and respectful of other people who are visiting. They all also seemed to be well prepared for their outdoor activities with what they were wearing and what they were carrying. 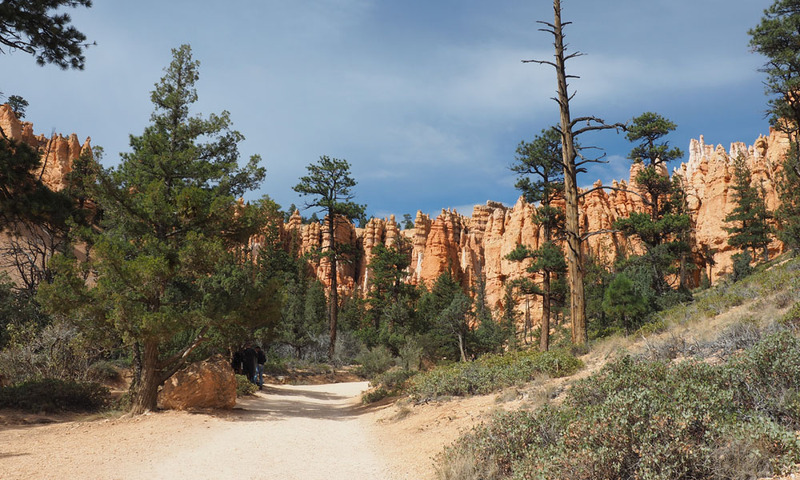 Once people get dispersed to the various spaces in the park and take to the longer and more challenging trails the crowds dissipate, and except for the popular trails, all is good. The system seems to work in spite of the volumes of traffic. The day started out with very cold temperatures. We had packed warmly for the outing. We need not have been concerned about the weather. Once we got to the park and got moving everything turned out well. We headed north out of town on US 89. 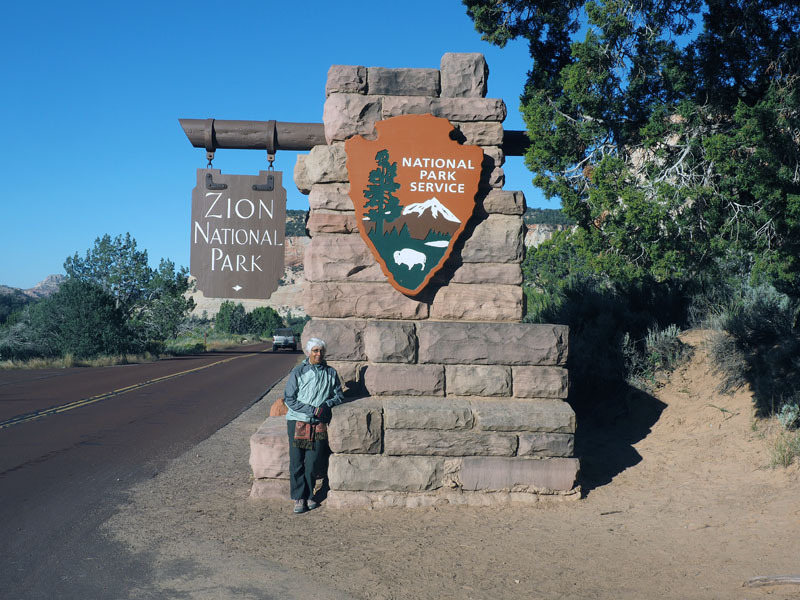 We reached Zion taking Utah Highway9 from US 89. At the entrance to the park the color of the road surface actually changed to a shade of brown. I do not remember seeing such a surface anywhere else. The speed limit dropped as the road began to wind through the hills. We began to see the mountains on the east side of the park. We reached the 1.1 mile Mt. Carmel tunnel that takes you across the mountain to the western side of the park. The tunnel was completed in 1930 and provided a way through the mountains in this section of the mountains for the first time. The tunnel is quite narrow. They were running one-way traffic when we arrived, probably because a bus and an RV were trying to get through. They would take up both lanes. In the picture below you can see one of the holes that was blasted in the side of the mountain to provide a view point from the tunnel. 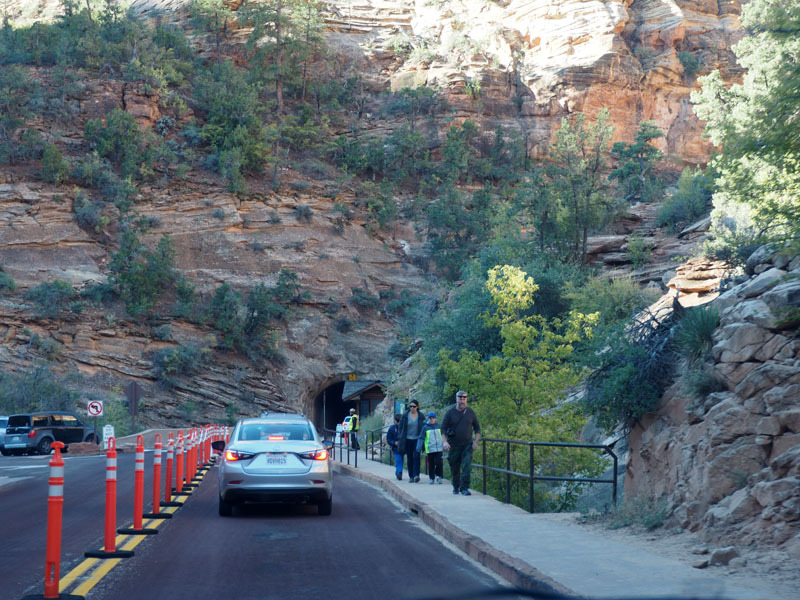 As soon as the road crosses the tunnel, it switchbacks it way to the bottom of the canyon in a very dramatic way. You can pull over to the side of the road in many places and you can get views like this. 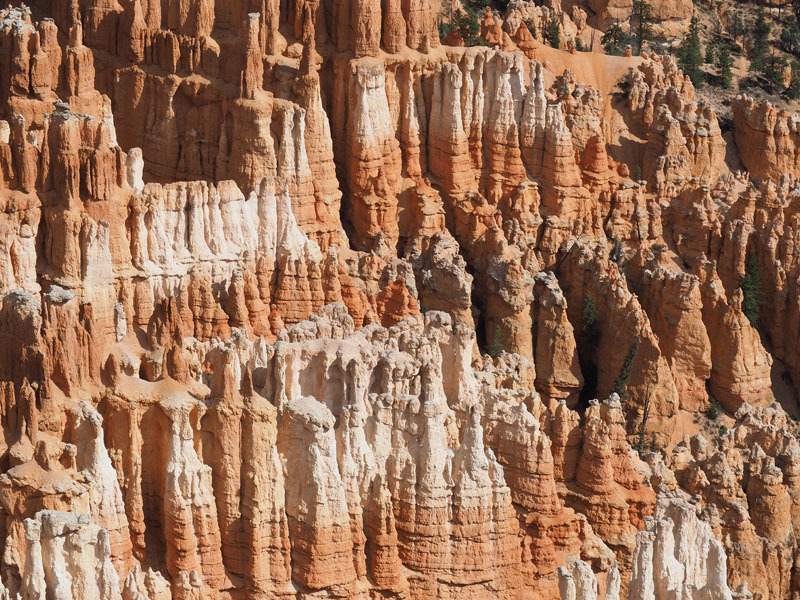 These colorful mountains tower over the narrow canyon. It is awe inspiring. We went to the Visitor Center to get ourselves oriented and figure out where we were going. We decided to take the shuttle bus to its last stop, The temple of Sinawava, to take the Riverside Walk. 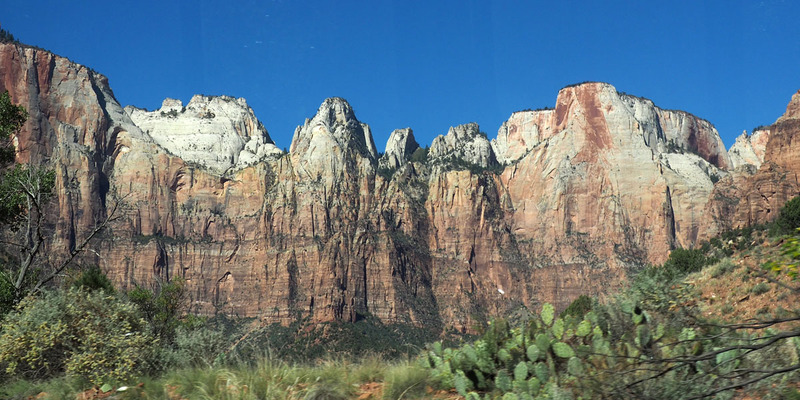 You get a lot of information on the bus during this 40 minute ride, and you can enjoy fabulous views from the bottom of the canyon, including this picture of the mountains called the Patriarchs, including the three peaks, Jacob, Abraham, and Issac. 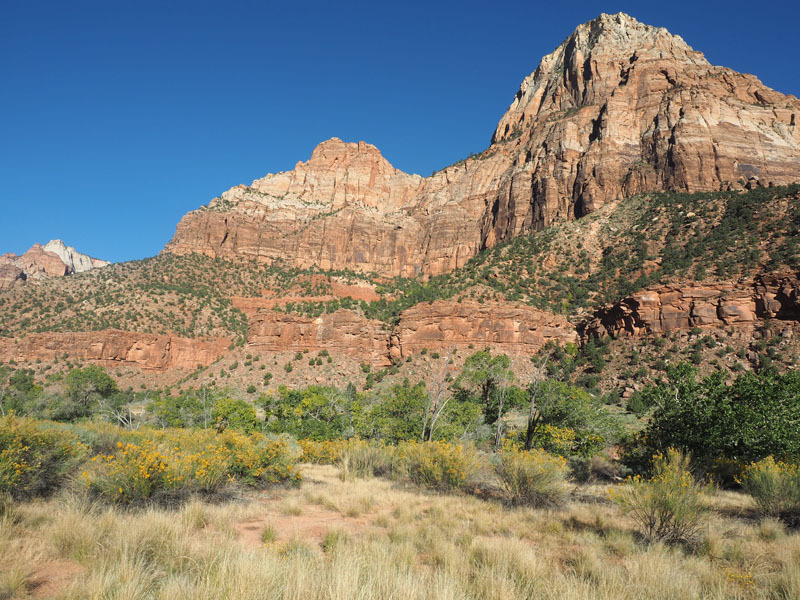 You also pass the a peak that is probably called Angels Landing. 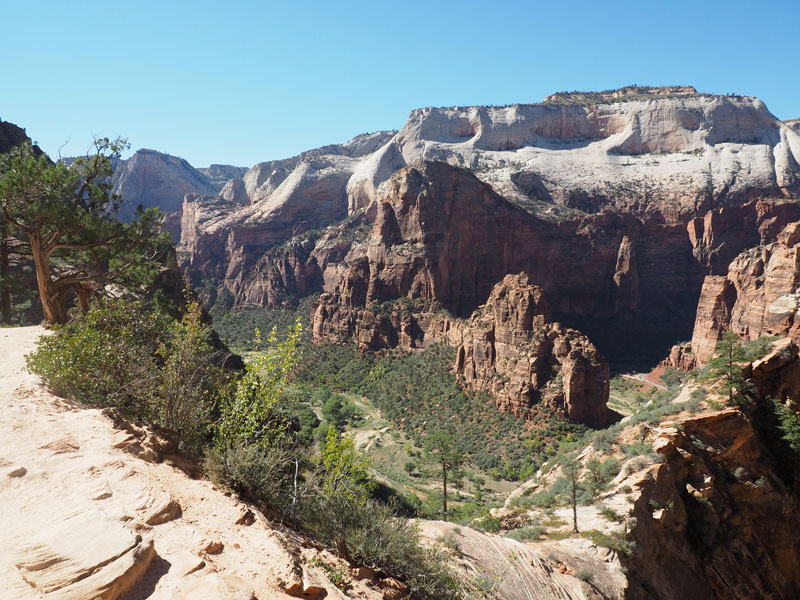 It is the terminal point for the Angels Landing trail, a climb of 1488 feet over really challenging terrain that is not for the weak of heart. A one point you will be climbing and walking on open rock high over this open space, completely exposed, with only a metal chain railing to grab on to. Other younger people in the family have done this trail in the past. 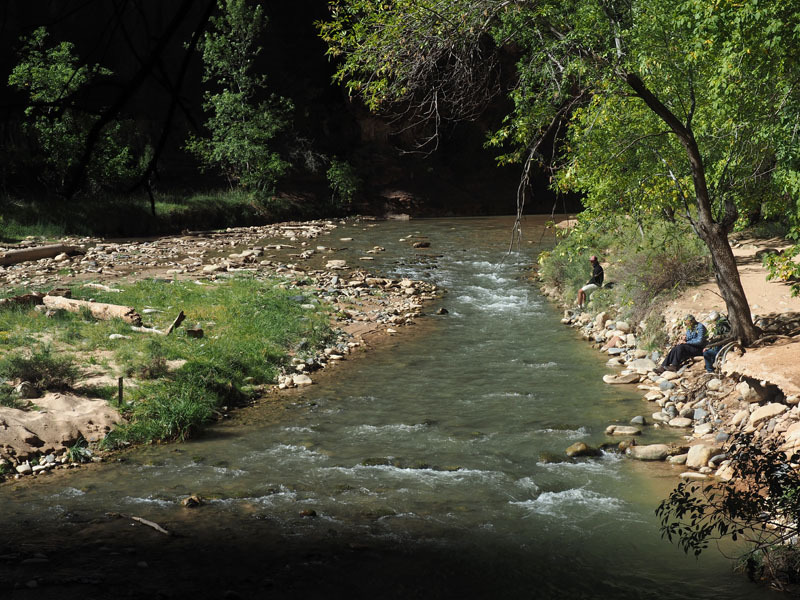 Zion’s canyon was formed by the Virgin river that flows along its bottom. 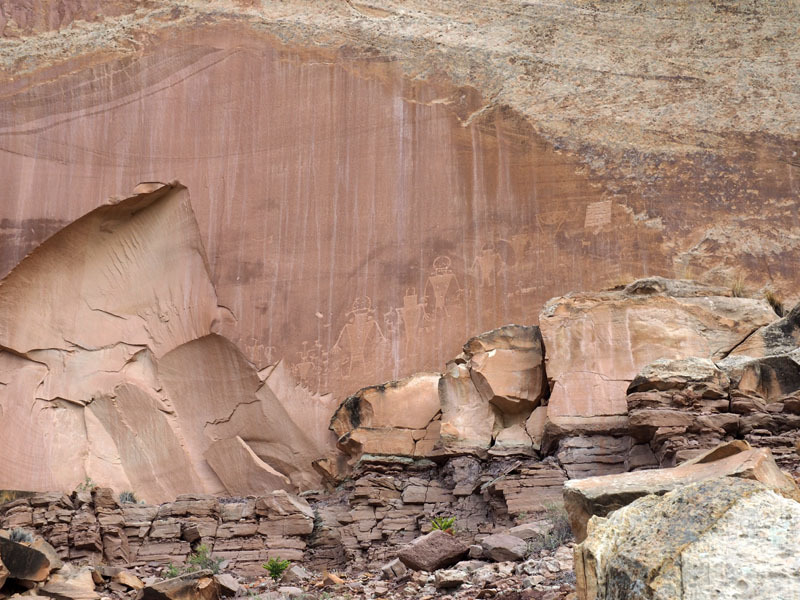 Over millions of years the river has cut its way down through many layers of rock. The place can become dangerous when the river floods. The river was calm during our visit. The riverside walk was very crowded, but there was always the opportunity to go off the trail and find a calm space beside the river itself. 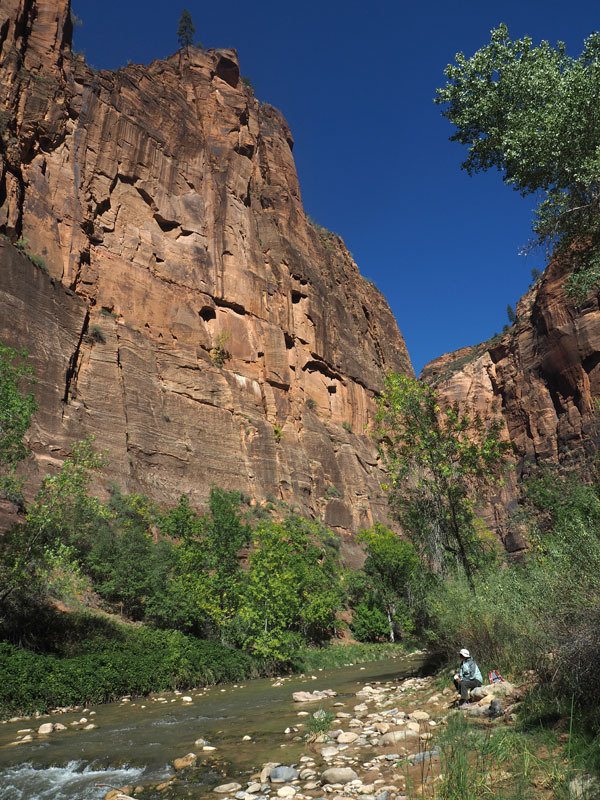 At the end point of the trail, one can proceed further into the canyon by walking in the river itself. You can go for miles, and many young people had come prepared to do this. It sounded like fun, but not something we could indulge in today. We had something to eat as we sat by the river side. After this hike we took the bus to the stop for the hike to Weeping rock. 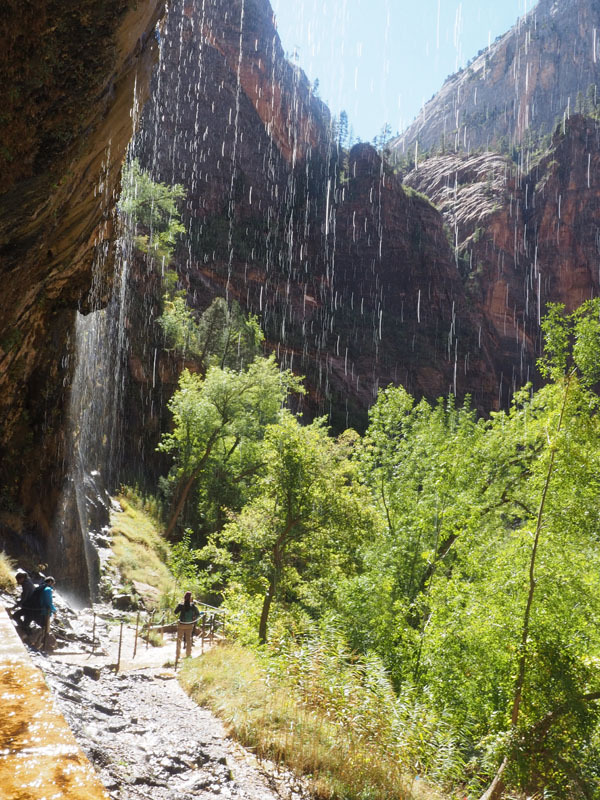 The hike to Weeping Rock was short but it was quite challenging in parts. At the end of the hike you find yourself in a rock alcove with dripping springs. The next hike started at the same place. 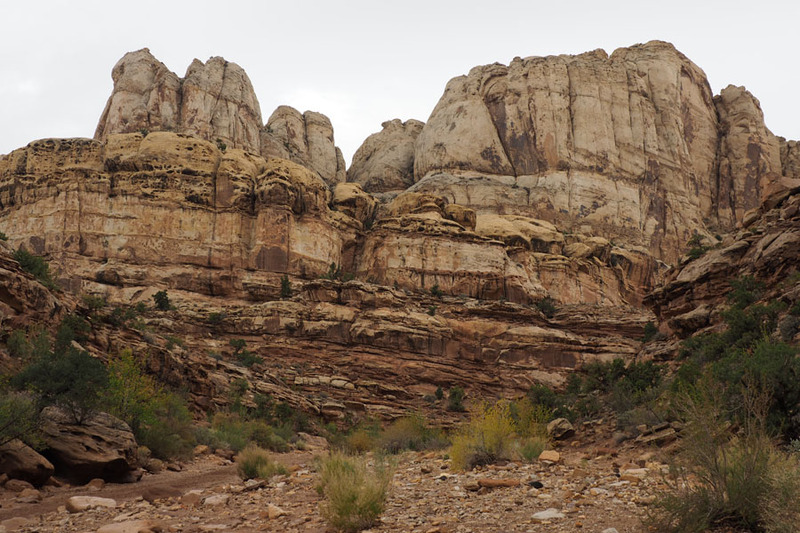 We climbed up the mountain you see in the picture below on the East Rim Trail to Echo Slot Canyon. We had to climb up to the trees that you see in the picture below. Basically, one is going up the face of the mountain that you are looking at using extended switchbacks. You have a view of the valley below as you are climbing. This proved to be a very challenging effort but quite rewarding. We took it slow and easy, with plenty of stops. Lots of young people passed us on the way up, but speed was not the goal here. This is a view of the valley as we started the climb. 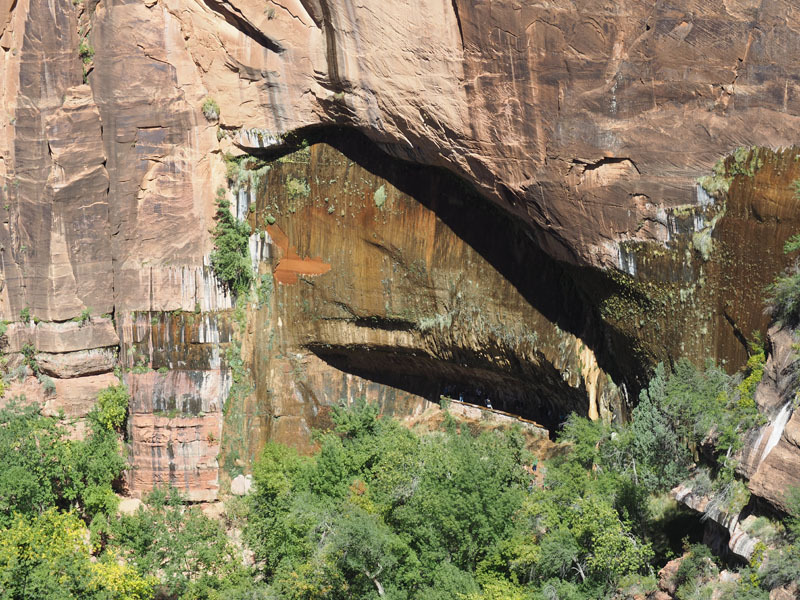 This is a picture of Weeping rock, the place we had gone to earlier, as we climbed the East Rim Trail. This is a view of the valley when we finally reached the top of this section of the trail. 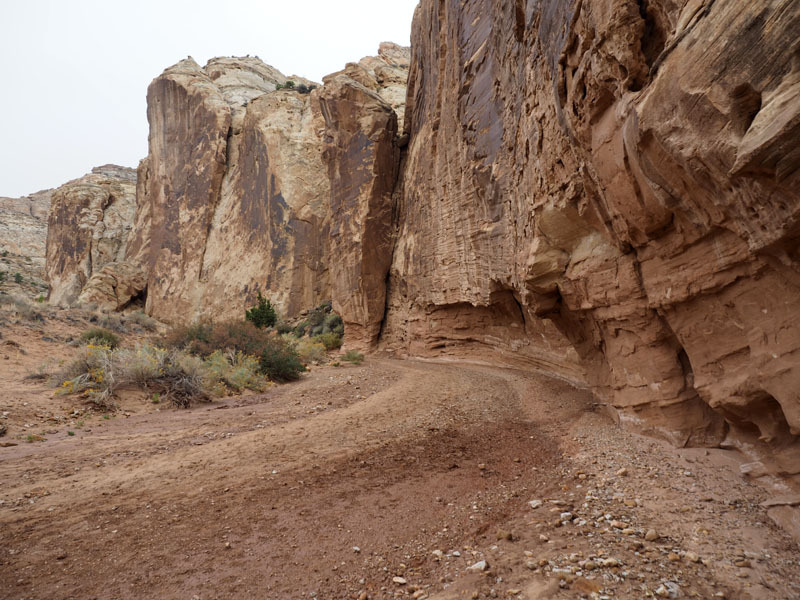 The trail then continued on the other side, behind the open face of the mountain, in an opening between two cliffs. 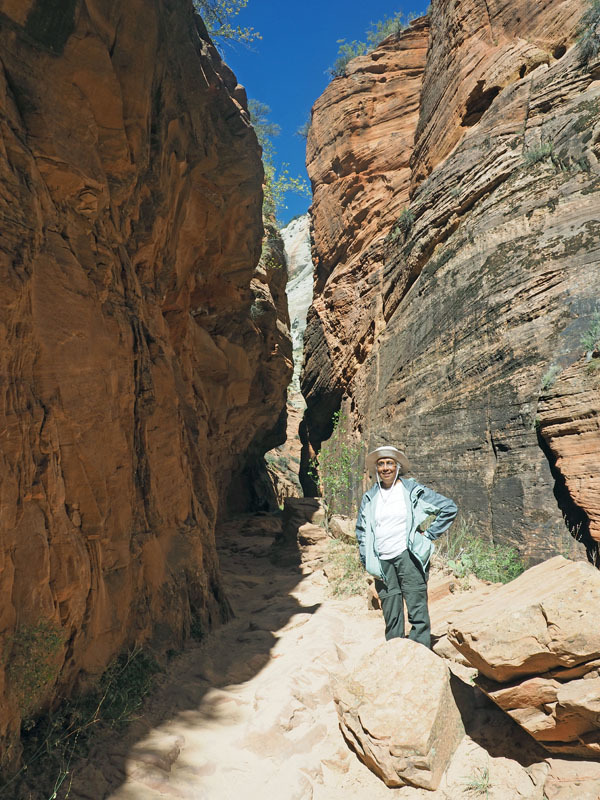 You could see the slot canyon below you in places. They looked difficult to navigate, but it apparently can be done. After passing through the gap in the mountains, you arrive at an open space on the other side. We declared success at this point and turned to head back to the trail head. My GPS device was having all kinds of issues during this climb, either because of the terrain, or because of a bad software download. So I do not know how much ground we covered. The hike took a couple of hours. We probably walked only about three miles in all, but we might have climbed about a thousand feet. We were exhausted after this hike, but it was quite exhilarating to have done it. The rest of our stay in the park was just icing on the cake. The next walk was on the Lower Emerald Pool Trail. It was somewhat unremarkable. The trail was crowded. 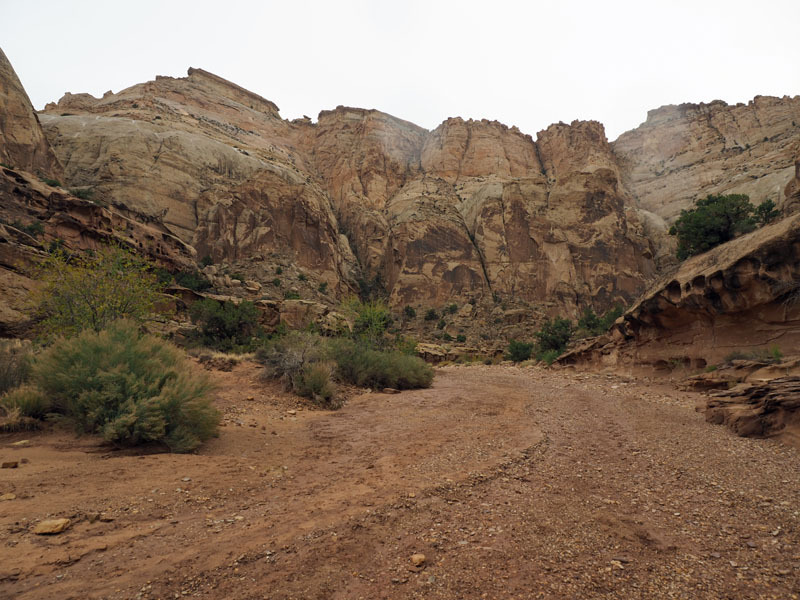 We took the shuttle bus back to the museum to watch the movie about the park, and then walked back to the Visitor Center on the Pa’rus trail that ran along the canyon floor close to the river. These pictures are from the walk. We walked amidst the mountains. 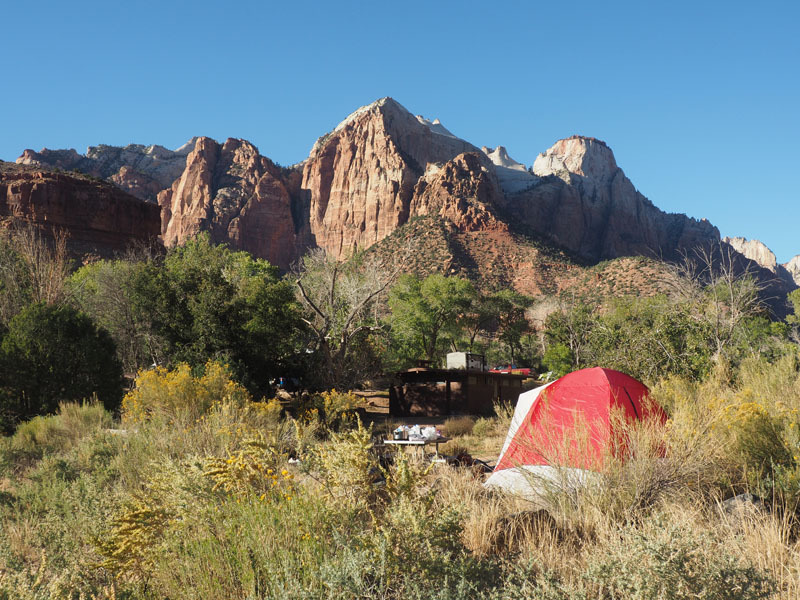 There are plenty of camping sites at Zion National Park, and it looked like all of them were occupied. The last stop was at the gift store to get a replacement light jacket for the one that I had left behind at the security check at Dulles Airport on the way in. 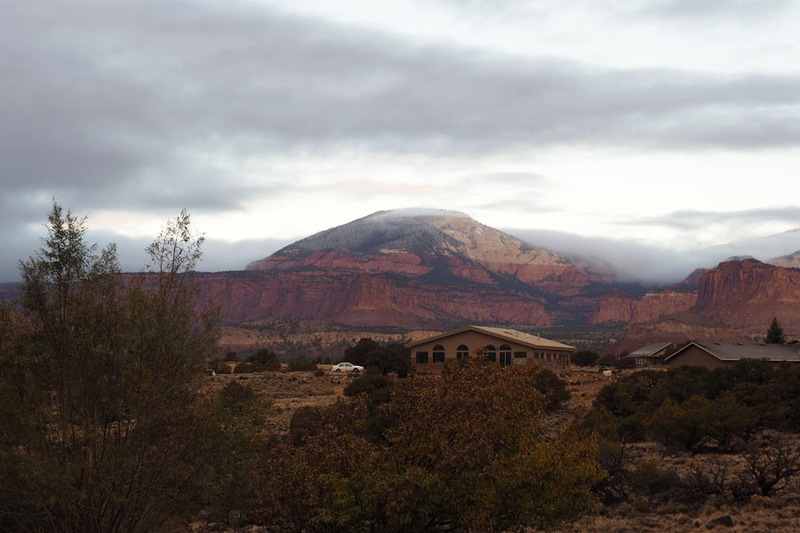 Then it was time to head back to Kanab for the night. It took a long time to get out of the park because we were stuck in a long line of cars, slowed down because of a couple of drivers who did not seem to have the good sense to pull over when they got a chance to let the others through. We walked over to Luo’s Cafe, close to the hotel that we were staying at, for our first dinner of Chinese food during this trip. It all went down quickly because we were very hungry. Back at the hotel, we took our baths and crashed out. I, of course, spent some time processing some pictures for this blog. 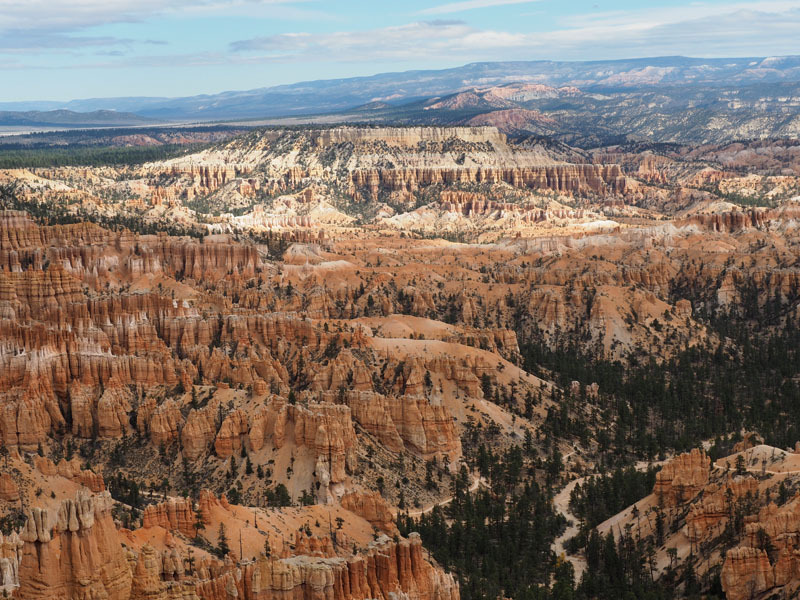 We are heading north to Bryce National Park today. It is going to be colder today than yesterday! As I mentioned before, the hotel we were staying at in Page, AZ, seemed to be brand new. Additionally, they had a good hot breakfast. The breakfast location downstairs was crowded even early in the morning with a lot of tourists who seemed to be getting ready for outdoor activities. Lots of people from other countries! We even saw some people from India who were up early. Page was the first place during our trip when we started seeing a lot of Indians. We got an early start leaving for the location of Horseshoe Bend on the Colorado river, just a few minutes outside of town. Unfortunately the parking lot was already starting to get full that early. Buses seemed to be disgorging droves of Chinese tourists, and of course there were people of all other nationalities, all climbing the hill from the parking lot to get to the spot to see the horseshoe bend. It was a crazy scene. People were stopping all over the place to take pictures of their families. Folks were marching along with selfie sticks in their hand. One guy even had a GoPro video camera attached to his head as he walked. I took my pictures and we fled the scene! It was only then that Teresa realized that we had left our leftover pizza from last night that was going to be our lunch today back in the fridge in the hotel. 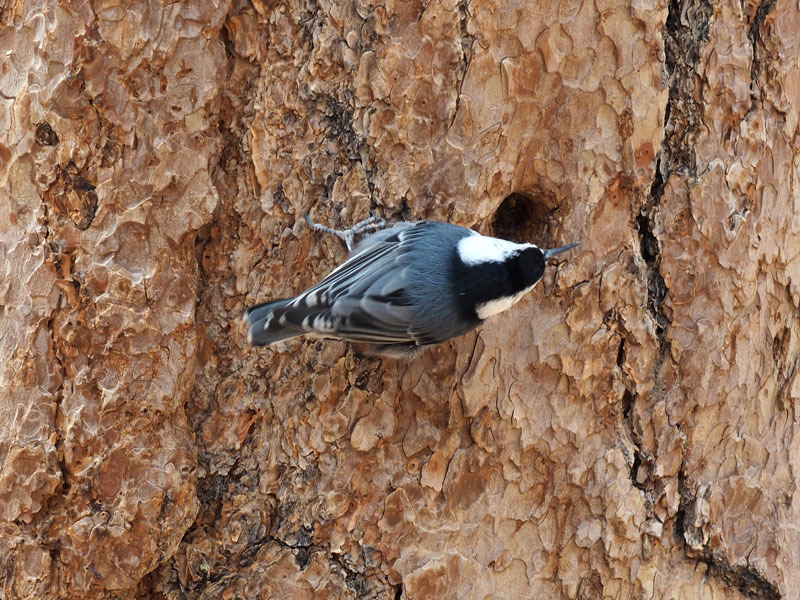 Rather than waste food, we took a quick detour back to the hotel to retrieve the leftovers before we finally began our trip to the northern rim of the Grand Canyon. 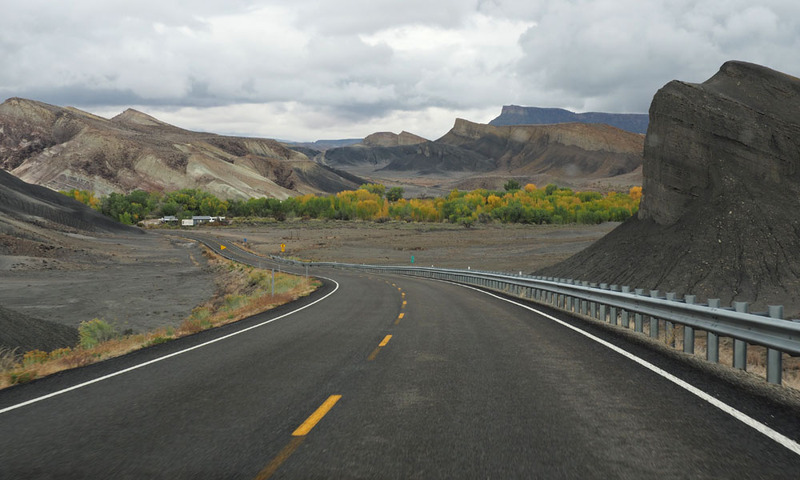 We headed south on US 89. As some point the road dropped from the high plain that we were on to a big valley below through a cut in the rock. 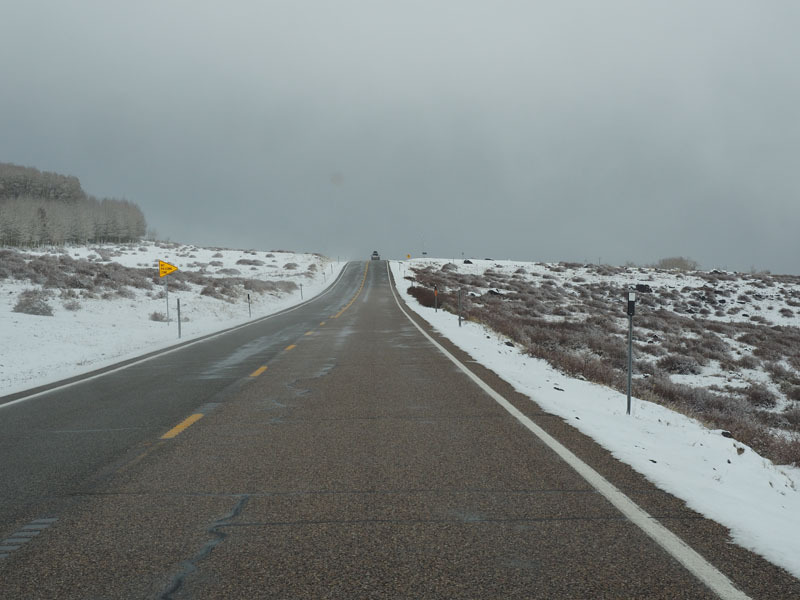 At the bottom of the hill, we turned off US 89 on to US 89A heading north through the valley. You an see the gap in the hillside that we had driven through earlier. 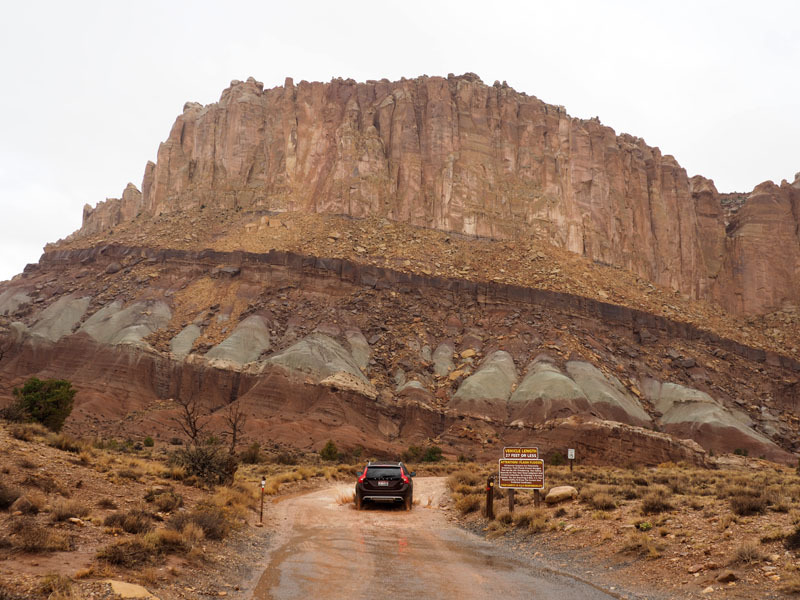 We were surrounded by colorful cliffs as we drove into the valley in a direction that seemed to have no way out of the valley. 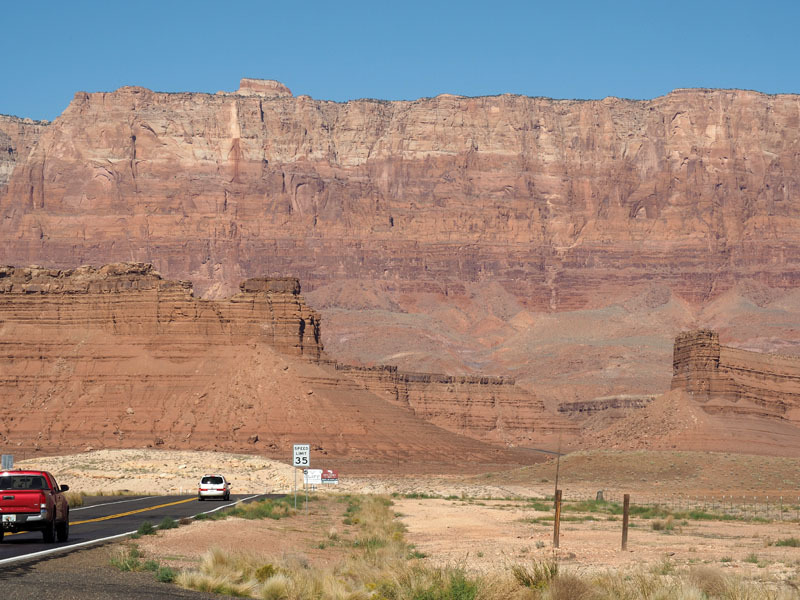 Here are the Vermillion Cliffs that we were driving towards. 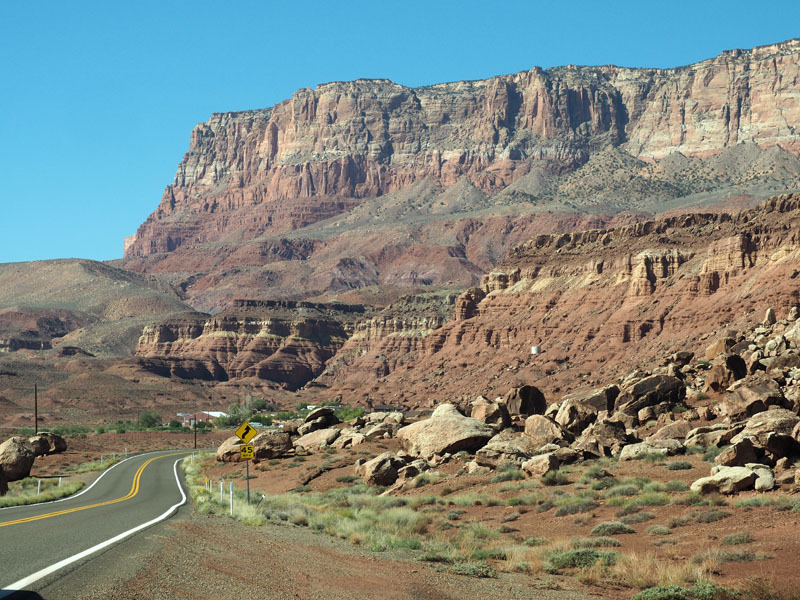 The road started to loop around at the end of the valley, and we crossed the Colorado river at Marble Canyon. 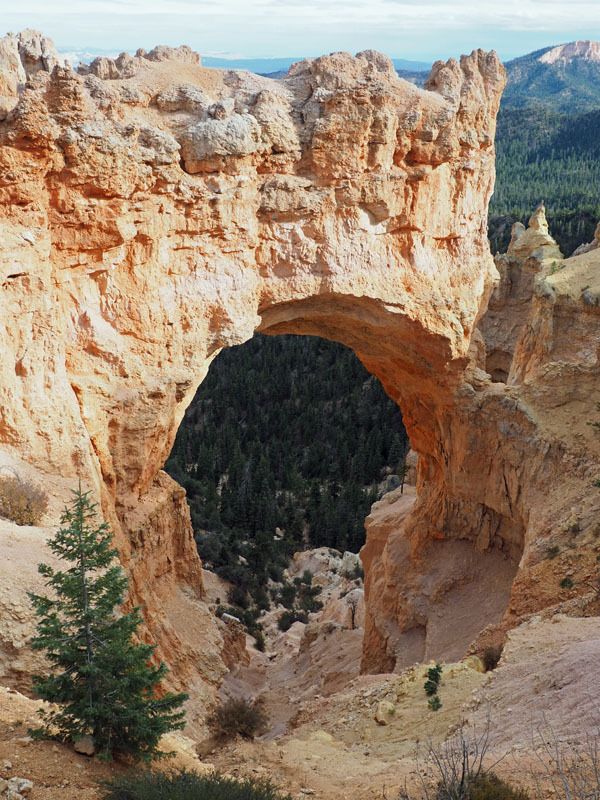 The bridge to the left is called Navajo Bridge. It was built in the 1920s. The one on the right is the more modern replacement built in 1995 for handling today’s traffic. It was deliberately built in the style of the original bridge. 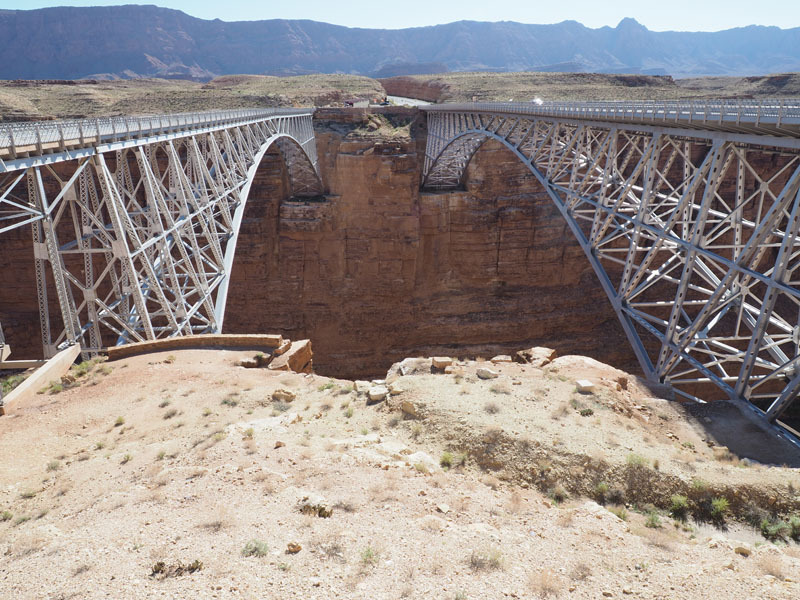 The Navajo bridge is considered the 9th highest bridge in the US. You can walk on the bridge today, and The US Department of the Interior maintains an Interpretive Center beside the bridge, which is where I took this picture from. 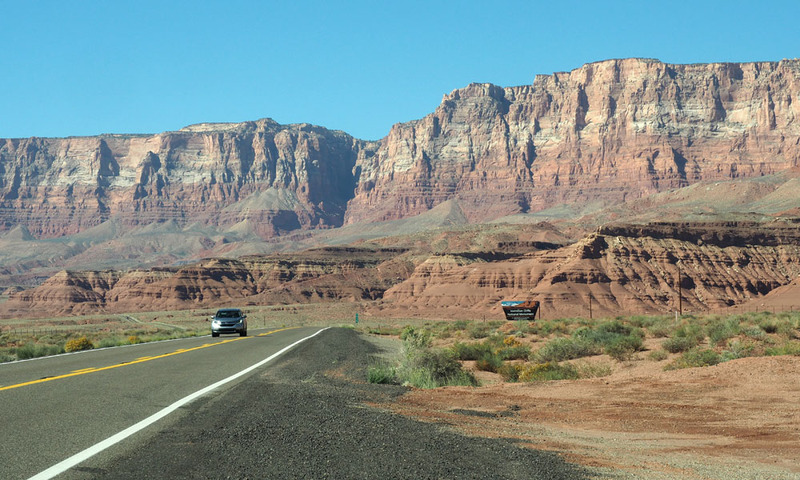 The road now turns south and runs beside Vermillion Cliffs. You pass the small town of Lees Ferry. 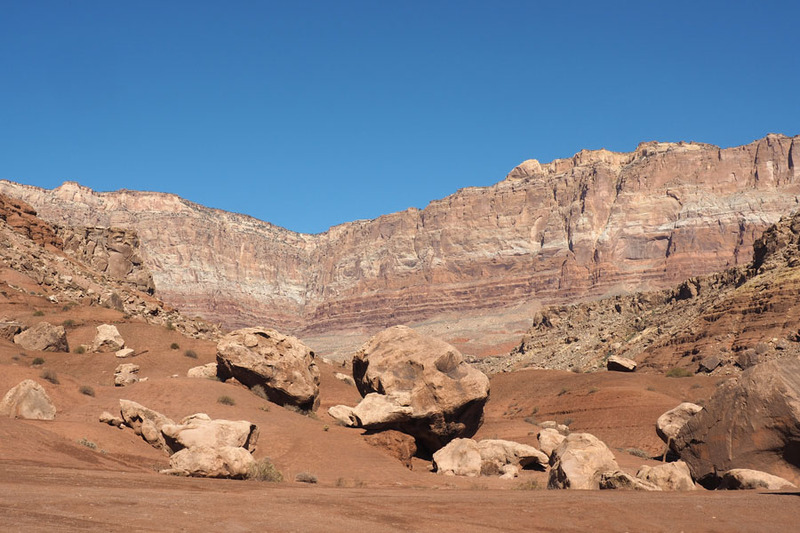 At the southern end of the Vermillion Cliffs you pass by a place where Cliff dwellers used to live. 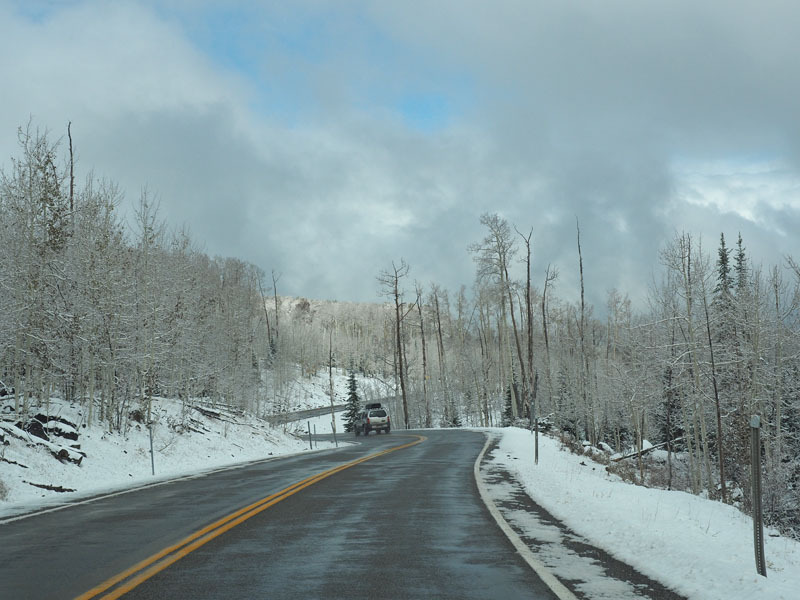 The road then turns right and heads west through the valley towards the distant plateau and the Kaibab National Forest. 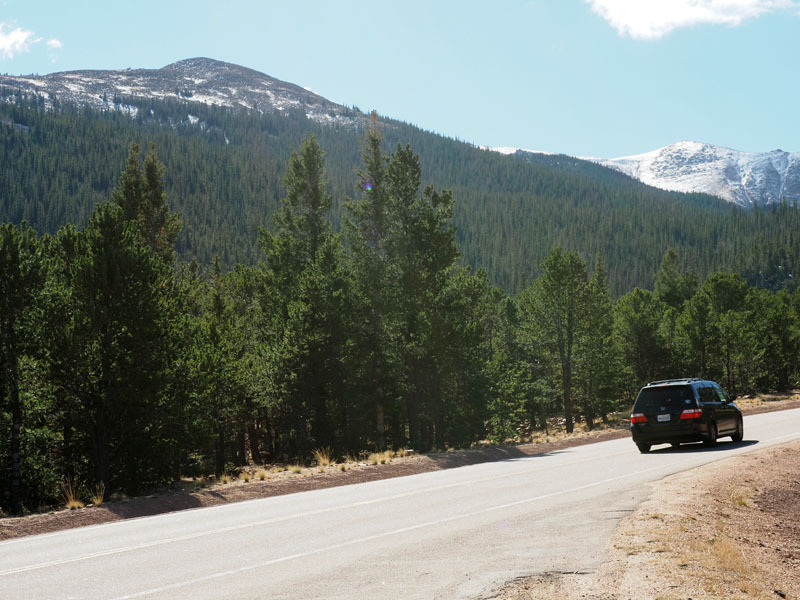 The whole time the speed limit on the road remains at 65 miles per hour, but the moment it enters National parkland and starts winding its way up and into the the mountains on the other side of the valley, it becomes slow once again. The vegetation begins to change as you climb and you start to see evergreens all around you. We are out of the plains! 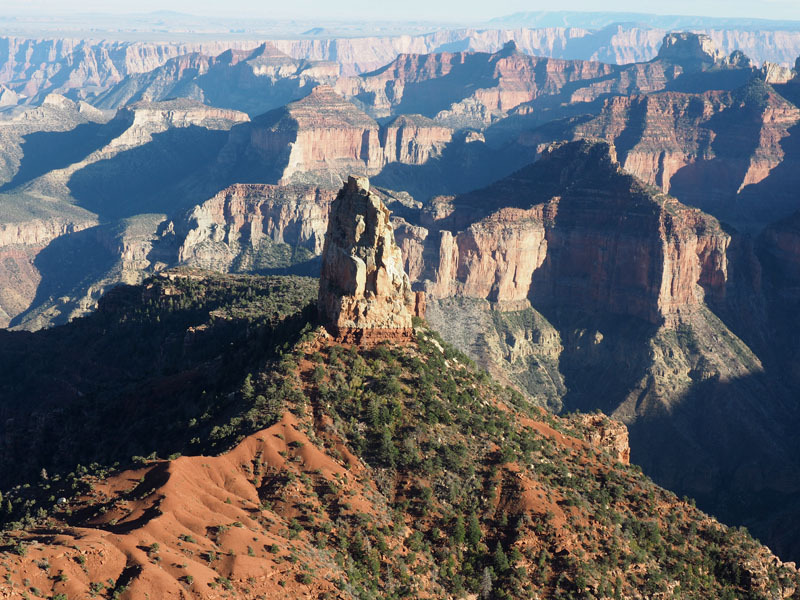 In a short while you reach an intersection at Jacob Lake, and you turn left to head south on Arizona Highway 67 into the Grand Canyon National Park. On the way one passes through a section of Kaibab that seems to have suffered a lot of fire damage. You pass high altitude meadows lined by evergreens with a lot of open space beside the road. It takes about an hour to get to the entrance of the park. 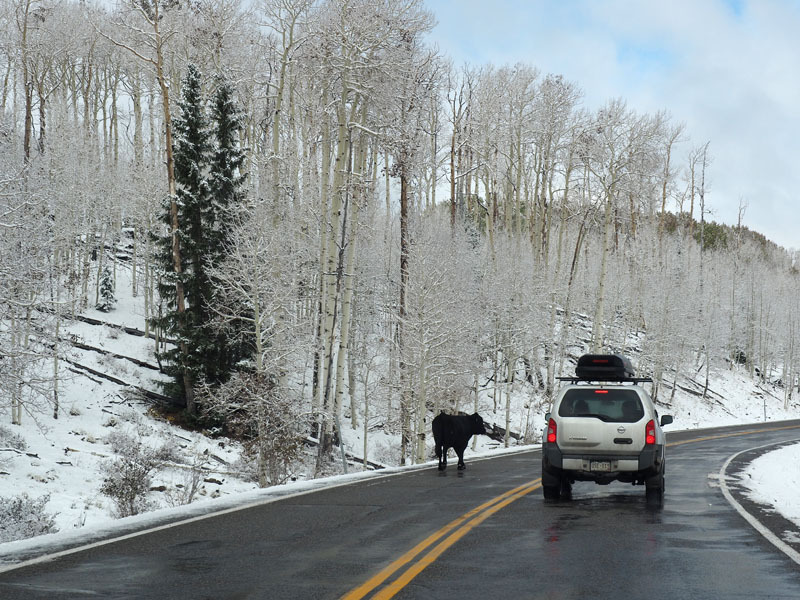 As we were driving toward the Visitor Center, we saw something happen on the winding roads that was unexpected. We were headed downhill when we thought we saw a car cross the road below us. Both of us thought there must be another road at the bottom of the hill. It turned out that the car had actually run off the road and down the slope on the side of the road into some trees. I caught a quick glimpse of the vehicle as we went by. The front seemed to be smashed in. The vehicle in front of us had managed to find a narrow space to pull over to help, but I could see no place to pull over myself. There seemed to be no cellphone coverage at that point. We proceeded toward to the Visitor Center with haste to report the incident. We were a little shaken up ourselves. We found out later in the day that the people in the car were OK. That was a relief. We found a place to consume our cold pizza near the parking lot and proceeded to the Bright Angel Point trail. This very short trail is deceptively challenging. There are some steep slopes, but the more difficult aspect is dealing with the fear of heights. You are walking on a narrow ledge over a very deep canyon. They have handrails in the sections where there are drop offs on both sides, but otherwise you are exposed and you have to watch out for the mind games that may prevent you from making progress. 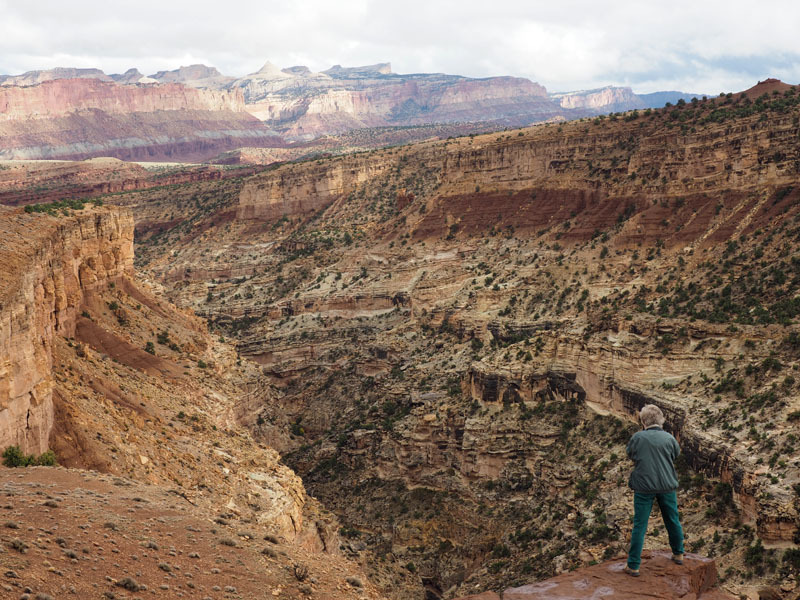 At the end of the walk you end up standing in an open space overlooking the canyon on three sides. It is stunning! It is actually scary to see scenes like this while you are walking this trail. 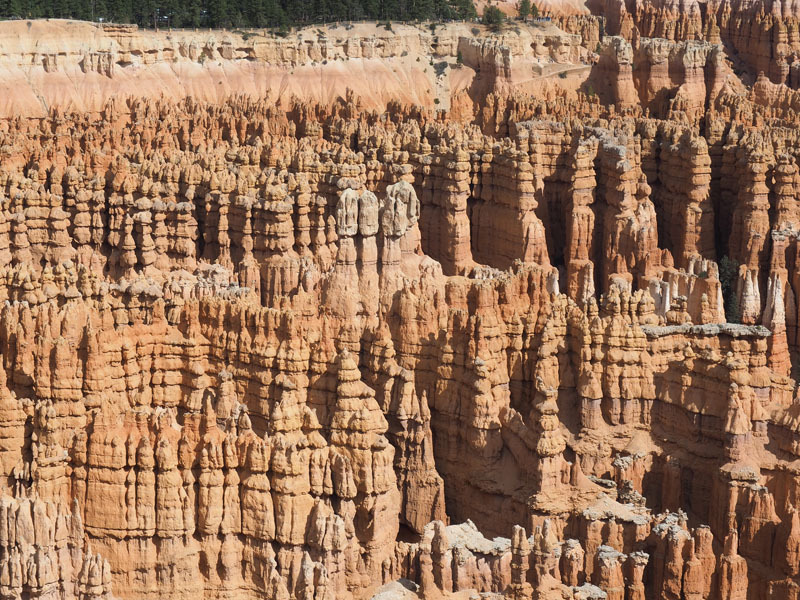 You get an idea of scale when you see the people on the ledge at the upper right side of the picture below. A few of the mountains in front of us are named after Hindu gods. All the way in the background is the southern rim of the canyon. 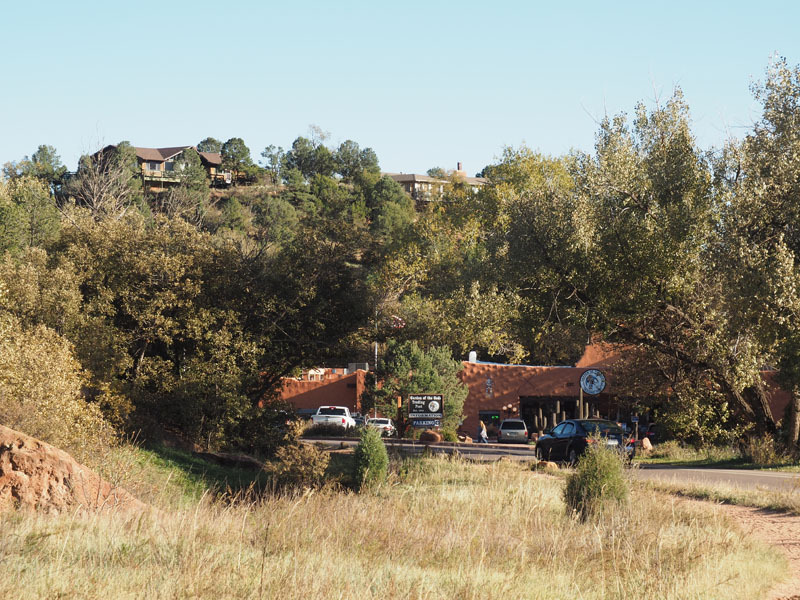 The Visitor Center for the South Rim is closer to the right side of the picture. 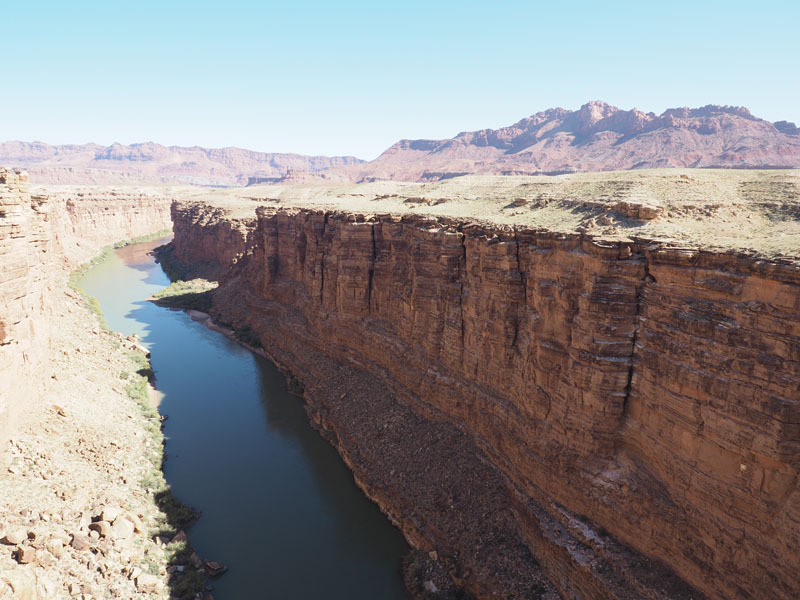 The Colorado river flows in the canyon closer to the south rim. 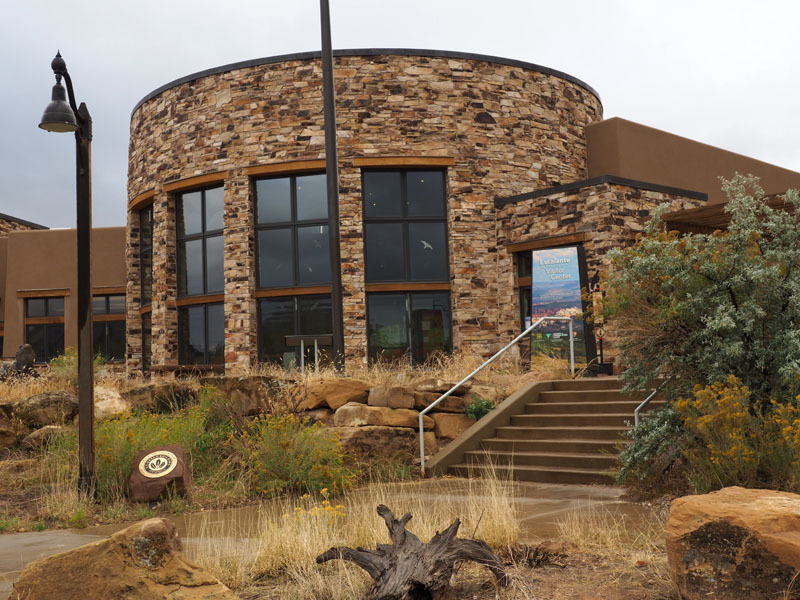 There are not many trails to walk on the ridge on which the Visitor Center is located. We ended up doing a short loop going out on the Trancept Trail and returning on the Bridle path. 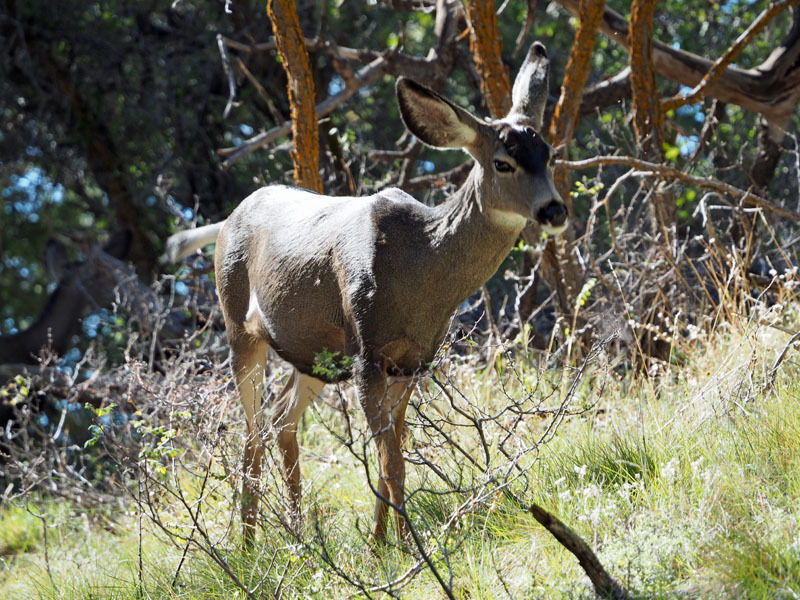 On the way we passed some deer (I think they are mule deer) close to the trail. They were not afraid of us. 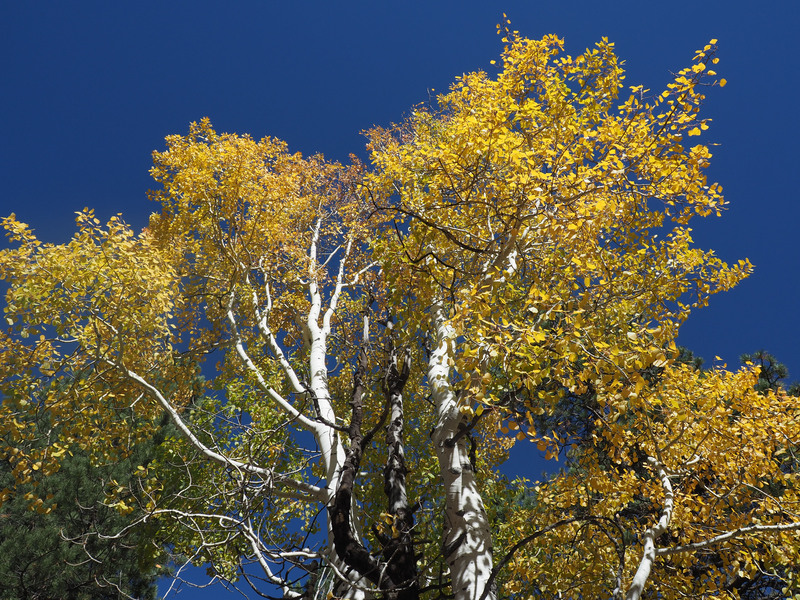 The aspen trees look very beautiful this time of year. 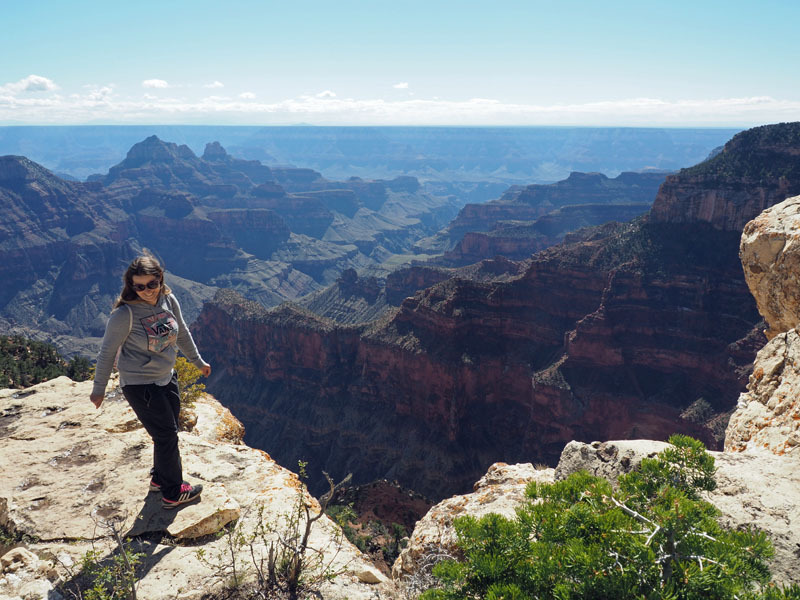 There are other very challenging trails on the northern rim if one wanders away from the visitors center, including the north Kaibab Trail that you can use to get to the bottom of the canyon and perhaps cross over to the other side. But we were done with hiking for the day! 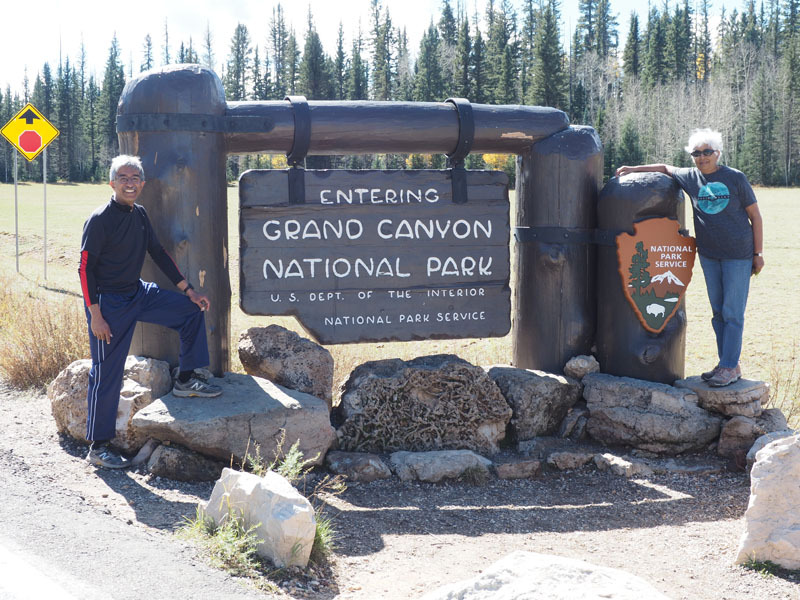 We drove out and took a side road to Imperial point, the highest point in the Grand Canyon (8803 feet). The wind was howling as we got out of the car and the temperatures were beginning to fall precipitously. We did not spend too much time outside. 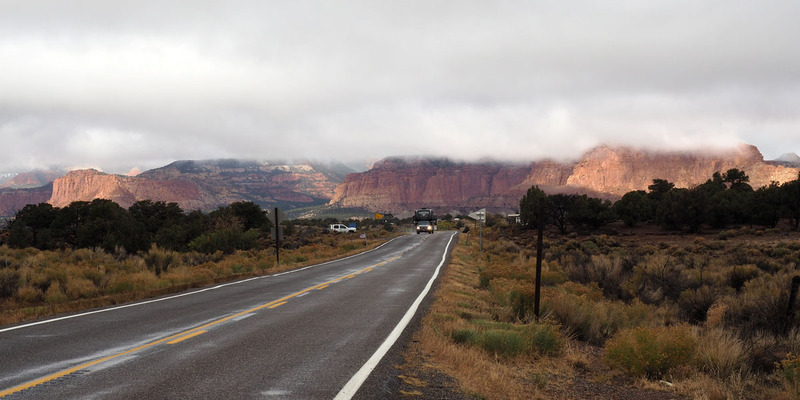 And then it was time to head towards Kanab, UT, our stop for the night. The sun was setting as we approached Fredonia, the town on US 89A at the northern border of Arizona. 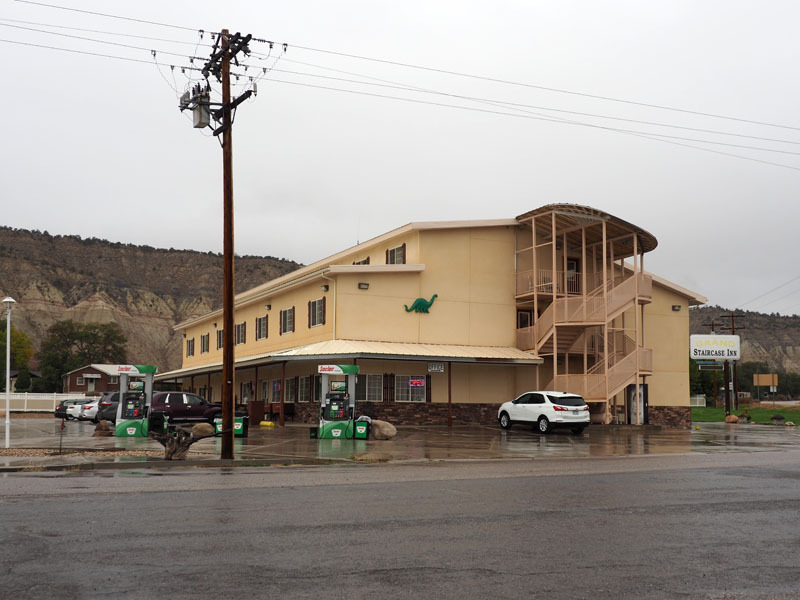 We entered Kanab immediately as we crossed the border and found out hotel at the southern edge of town. Once again, it looked like a brand new facility. We are spending two nights here. 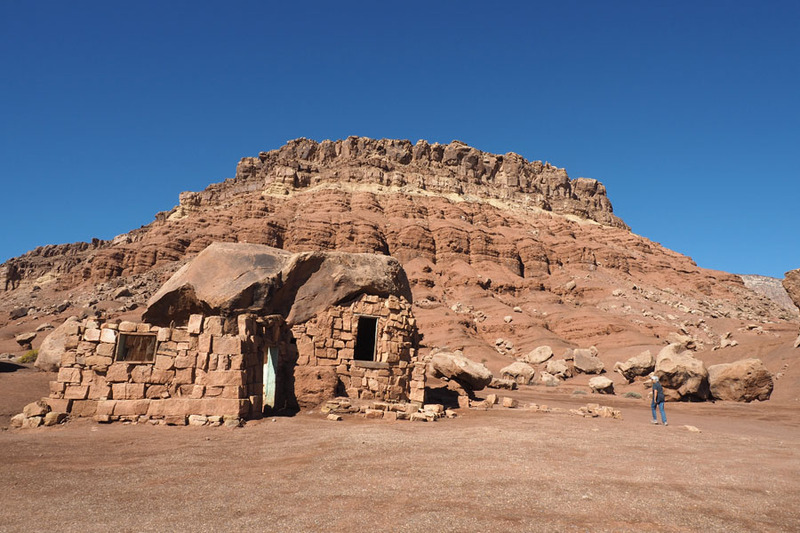 Having left Navajo country some time early during the day, we had crossed back into our original time zone, which meant that it was later in the day that I expected. We went around looking for a place to eat and realized too late that most places were closed, most likely because it was Sunday evening. The town looked small, but the broad roads and its wide blocks with smaller one story buildings also gave it a sense of emptiness on this Sunday evening. We did find a Subway eventually and got some food to bring back to the hotel. 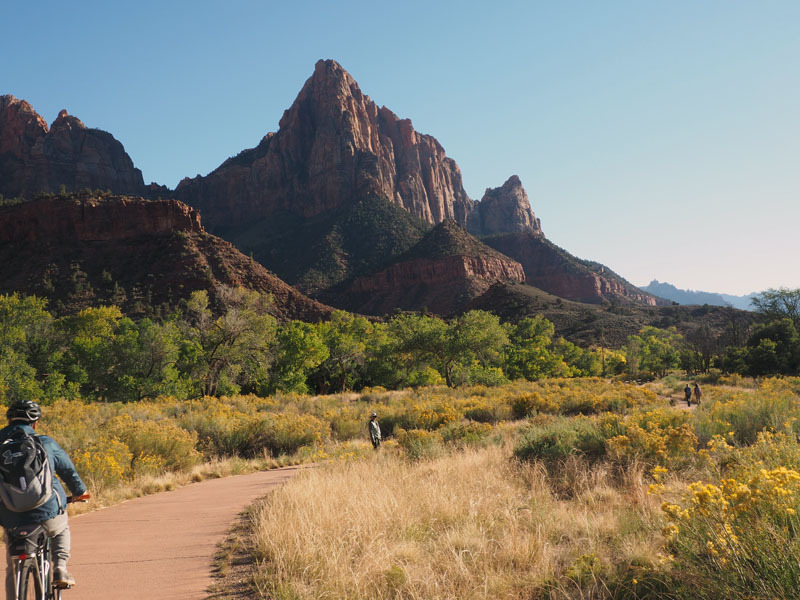 We are visiting the nearby Zion National Park today. The temperature is below freezing right now, but there is nothing we can do about that. It will get warmer during the day. We will head out as soon as we are ready.